What: the southern portion of the GR-7 trail. 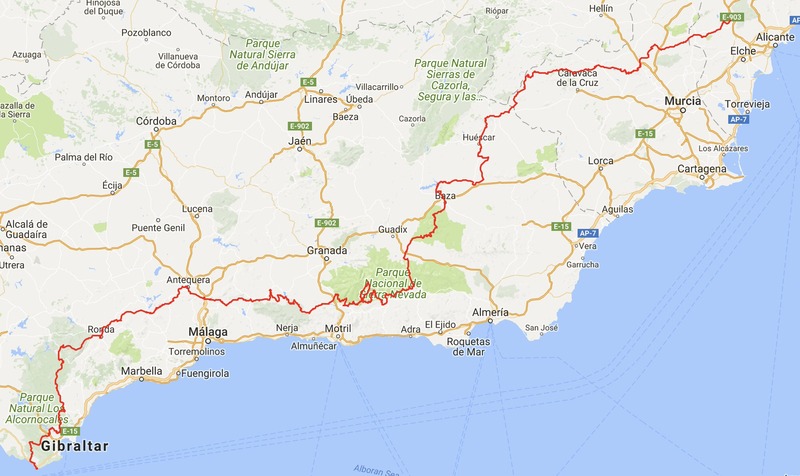 Where: From Tarifa to Elda, through Andalucía, Murcia, and a bit of Valencia, Spain. When: April 7 – May 11, 2012 (34 days). 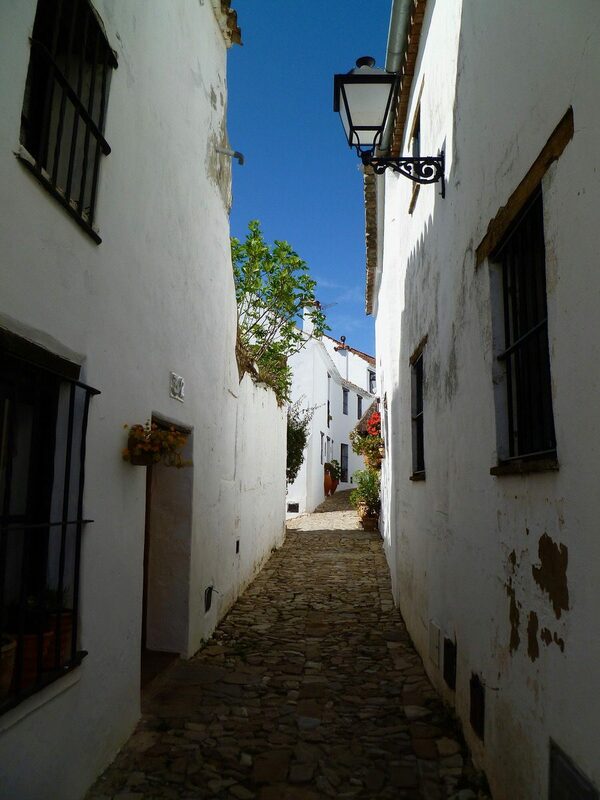 Highlights: fine scenery, easy logistics, historic sites, good food, friendly people. 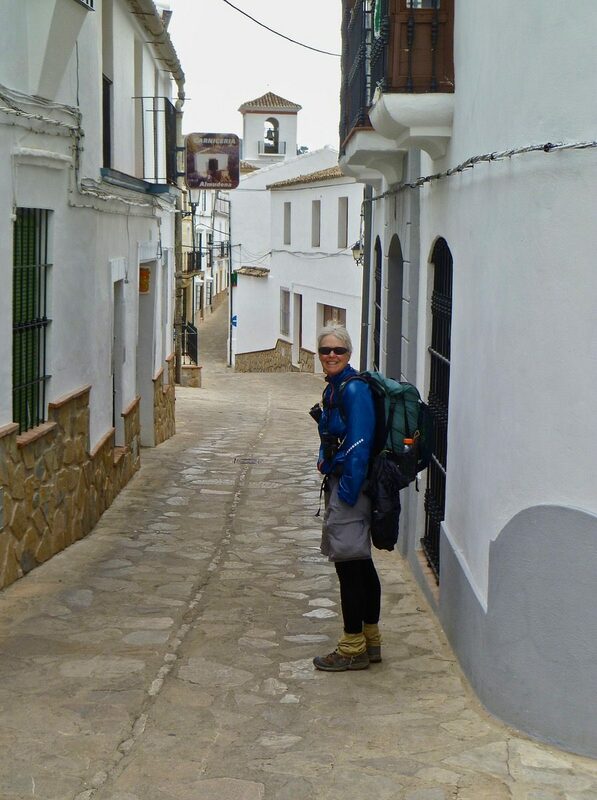 We used the Cicerone guidebook Walking the GR-7 in Andalucía; Tarifa to Puebla de Don Fadrique, by Shirra and Lowe. The book was only somewhat helpful for navigational purposes, but contains cultural information that we found interesting. We had the 1st edition and are not familiar with the current 2nd edition. 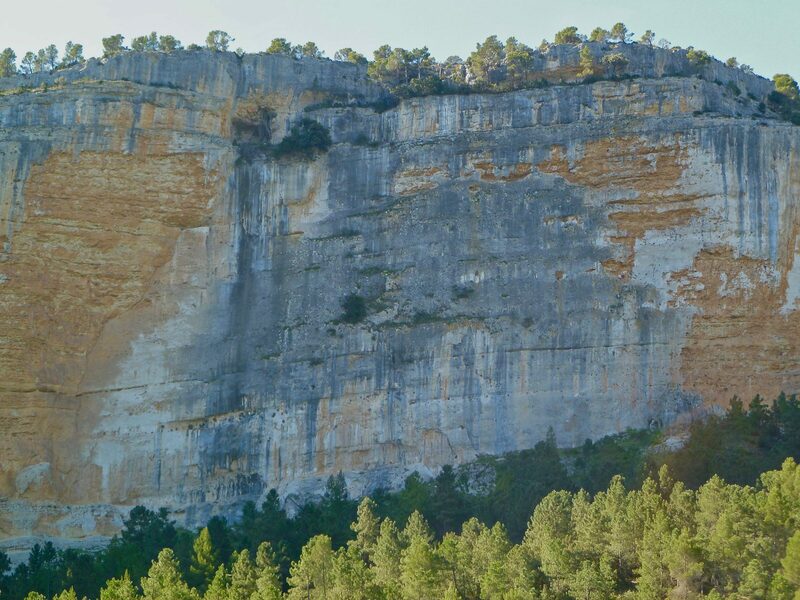 The book only covers the portion of the GR-7 found in Andalucía. 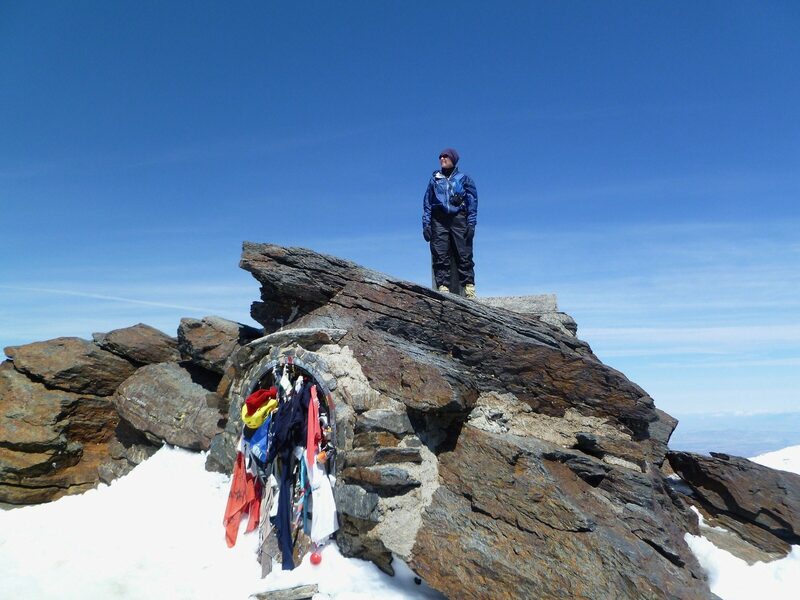 Christine (aka German Tourist) hiked the entire GR-7 in 2014 and wrote an excellent summary. In 2011, John Hayes thru-hiked the E-4, of which the GR-7 is a part. He has written a good summary, and also a very detailed daily diary. 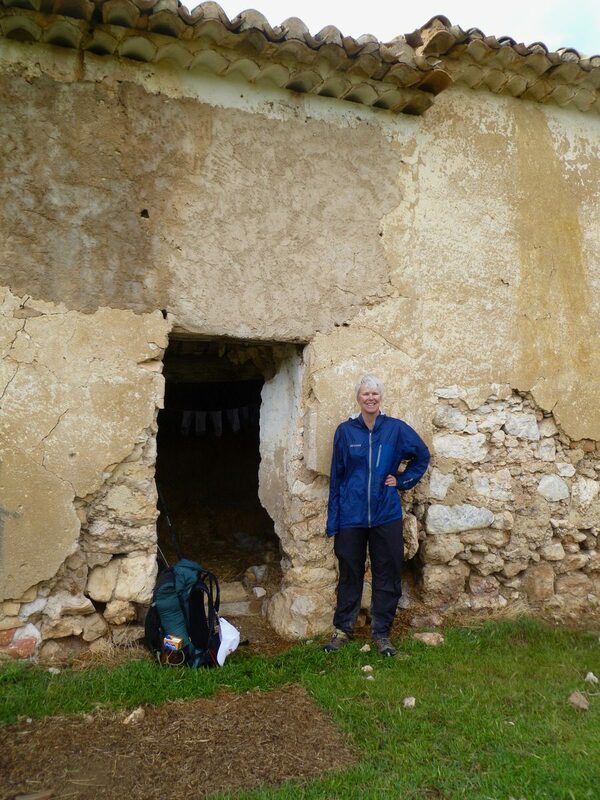 John Revelo’s Hiking in Spain – GR7 Trail Guide has useful information, particularly for lodging. 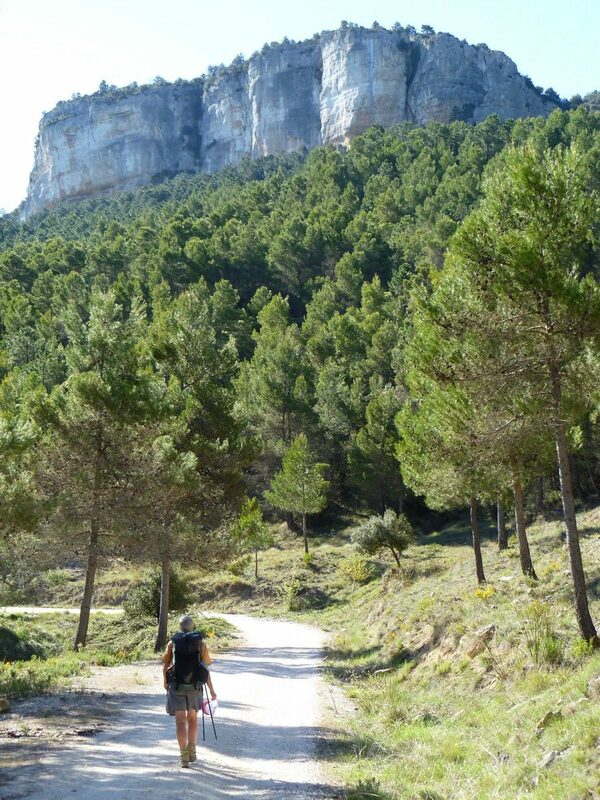 We downloaded gpx tracks from Rutas y Viajes. 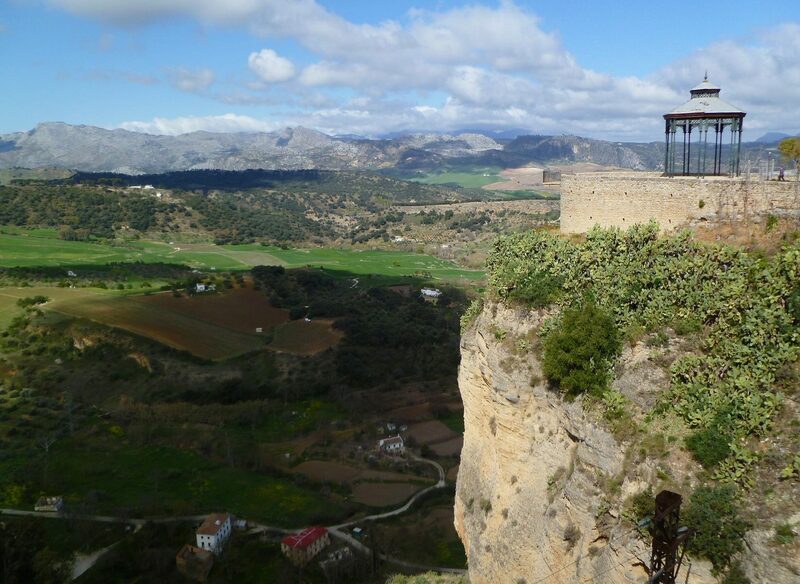 We had traveled in Spain on two previous trips. 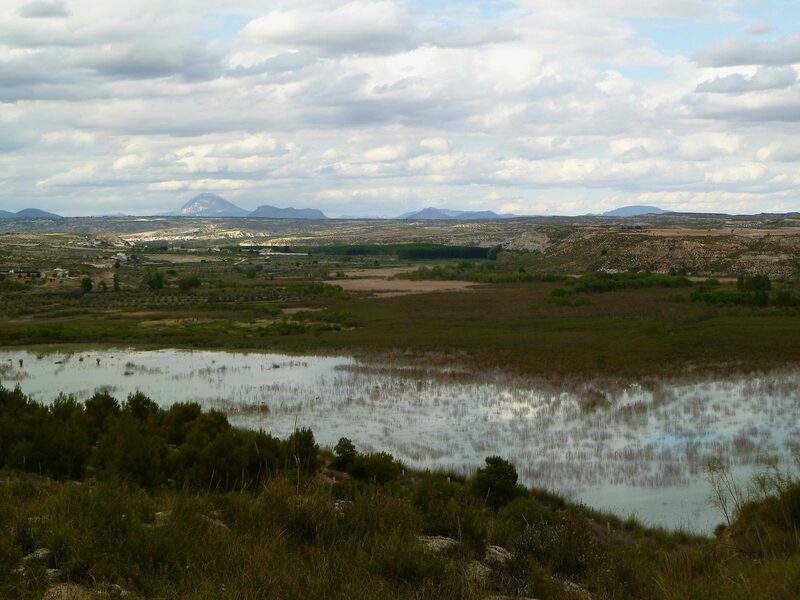 The first was a 1989 birding trip in southern Spain using a rental car for transportation. 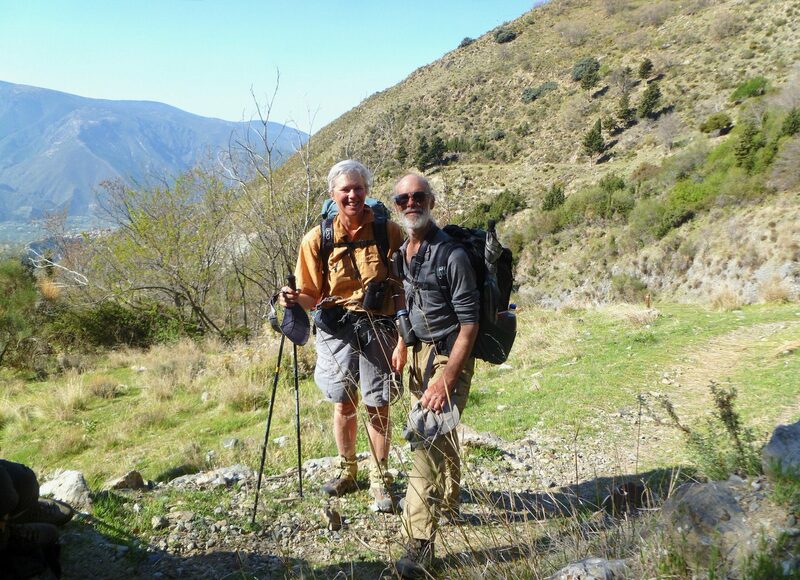 The second was a 2010 thru-hike of the Haute Route Pyrenees. 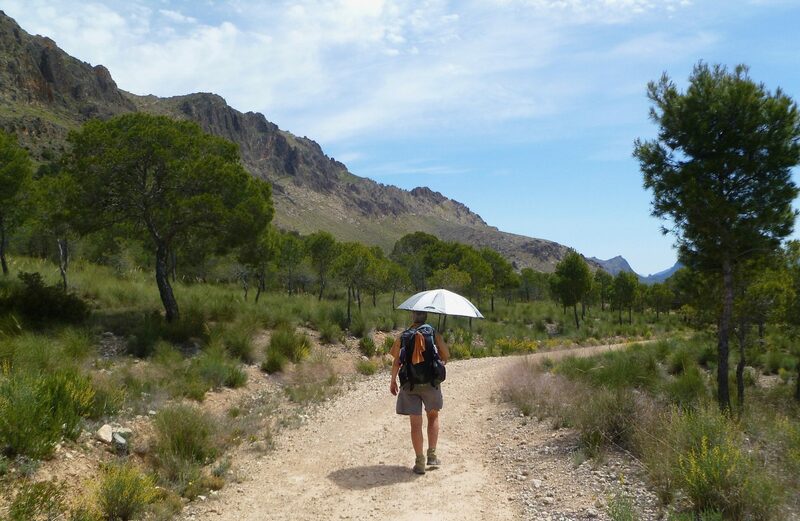 We had enjoyed Spain very much, and the HRP was one of our top-ten trips, so we decided to return and try another long-distance trail. We found the GR-7 by looking at maps and doing web research. Subsequent reading suggested it would be an interesting walk, so we decided to start at the southern end and walk as far north as we could within the time we had available. 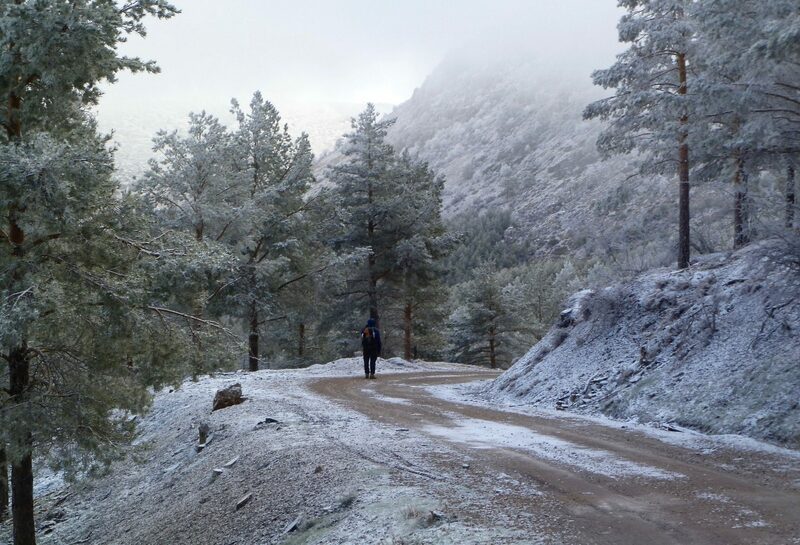 We thought that the section of the trail starting in the south would be the most rewarding and we had no expectations of completeing the trail at the Andorran border. 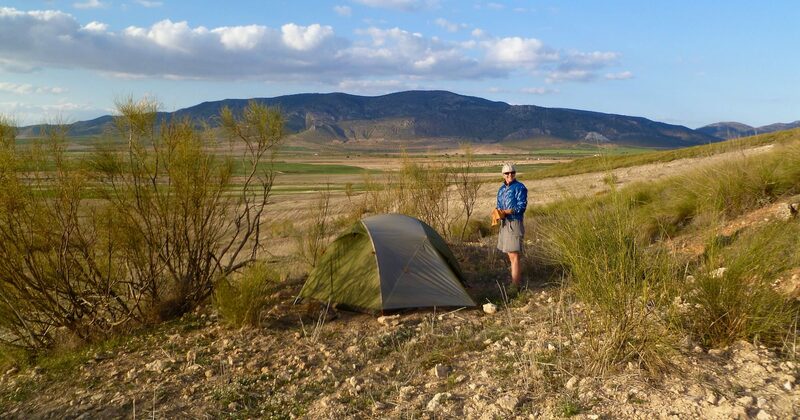 Since our starting point in Tarifa was just a short ferry ride from northwestern Africa, we added a ten-day birding trip in Morocco prior to the start of our walk; details about that trip is not included here. 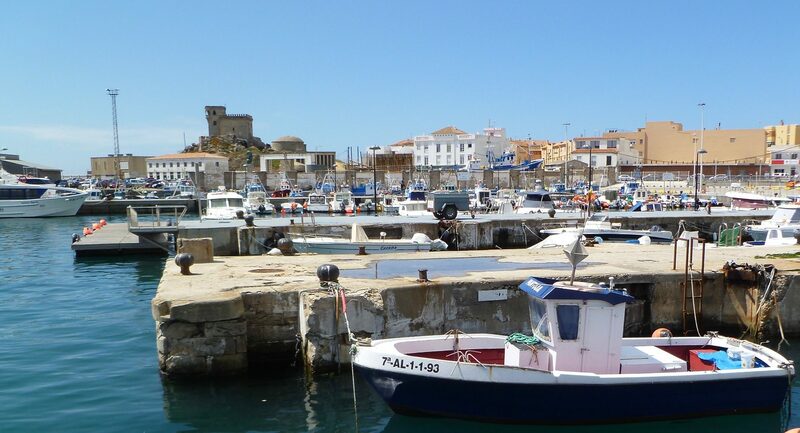 Tarifa harbor, the start of the GR-7. The walk continued along the beach, a popular place for kite-boarding. The GR-7 is concurrent with the E-4, a very long-distance trans-European route that ends in Budapest, Hungary. 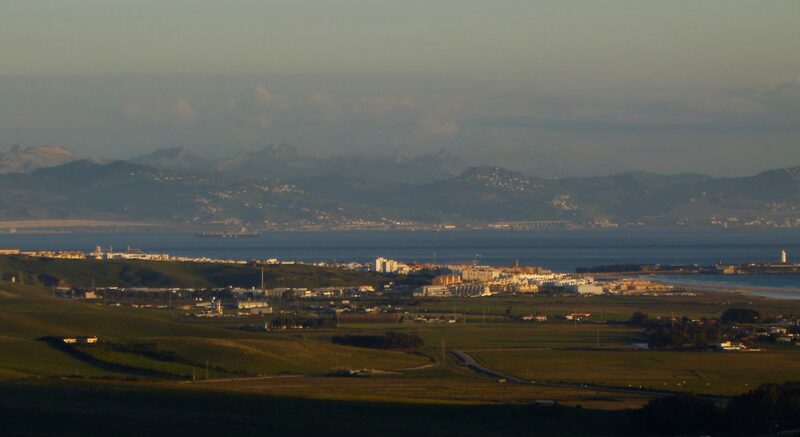 Looking back to Tarifa and across the Straits of Gibraltar to Morocco. A lot of the walking was on dirt tracks used a farm roads. There was almost zero vehicular traffic on these roads. 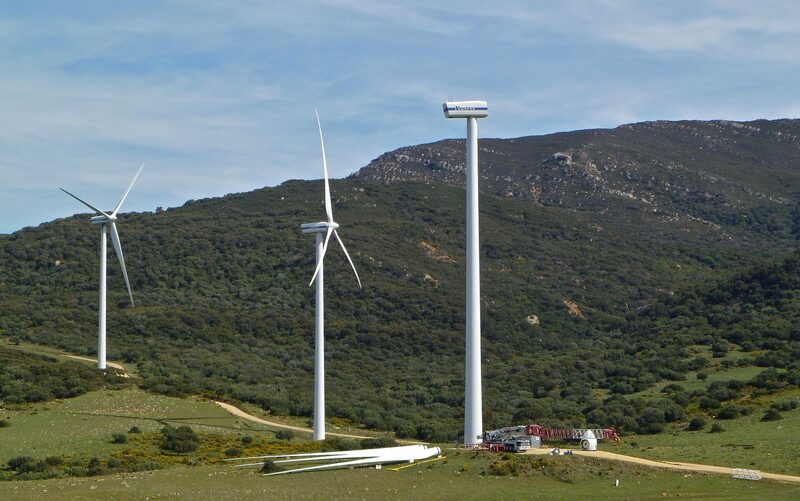 Spain is investing heavily into alternative energy sources. 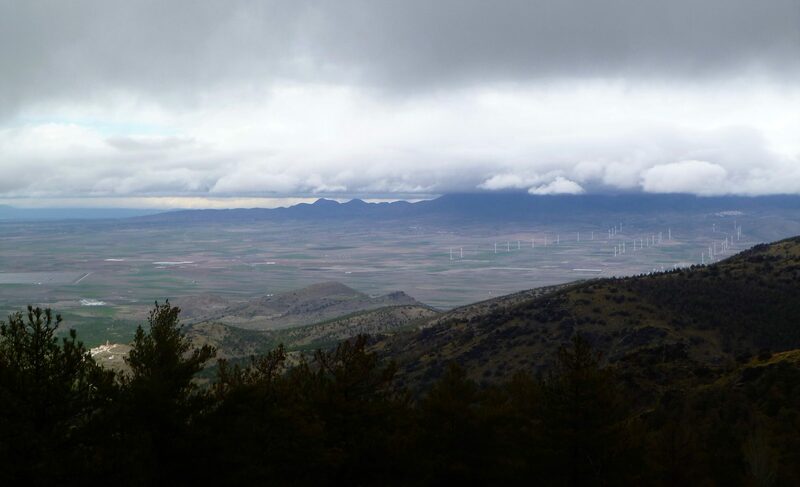 Wind turbines are scattered everywhere. Here a new one is under construction. 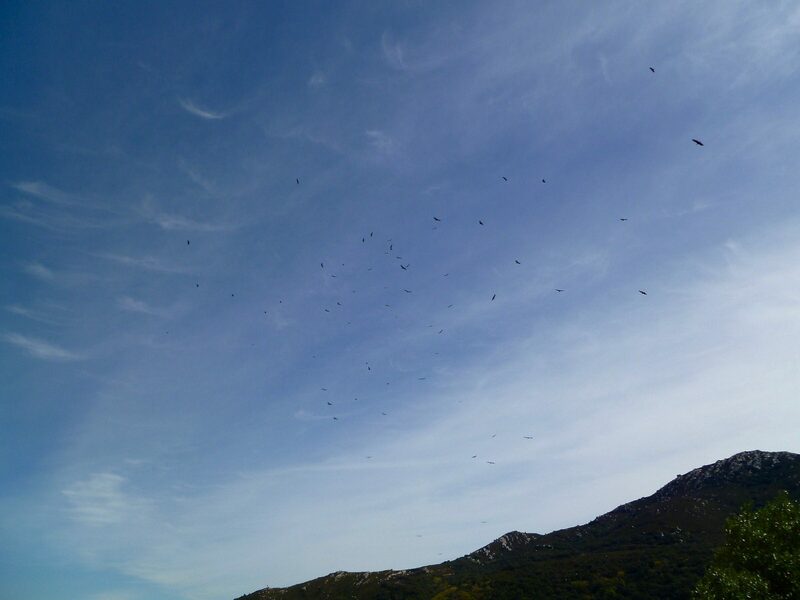 A large kettle of Eurasian Griffons, a common species of vulture. 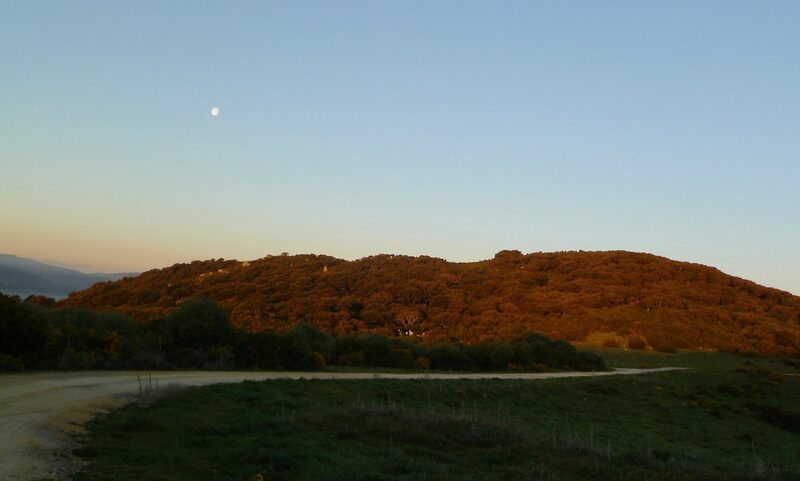 Early mornng day 3; we usually started walking a little before sunrise. 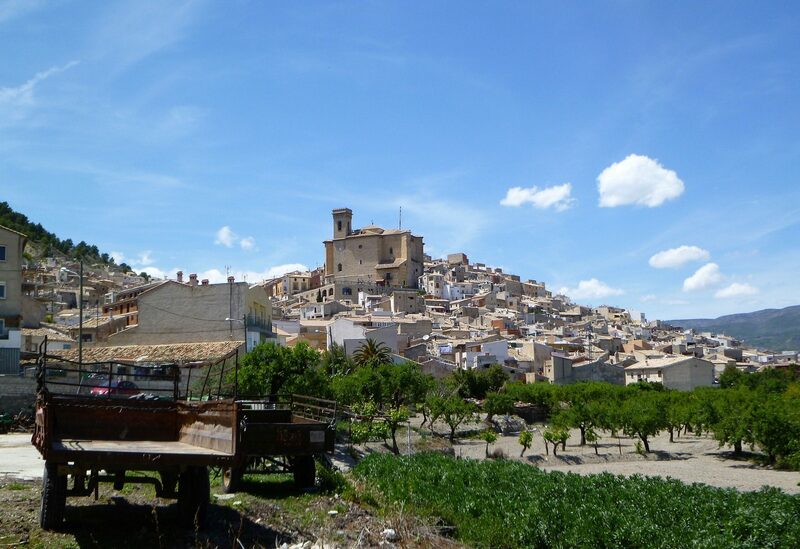 The hilltop town of Castillo de Castellar. Our campsite for the night was on the skyline ridge well to the left of the castle. 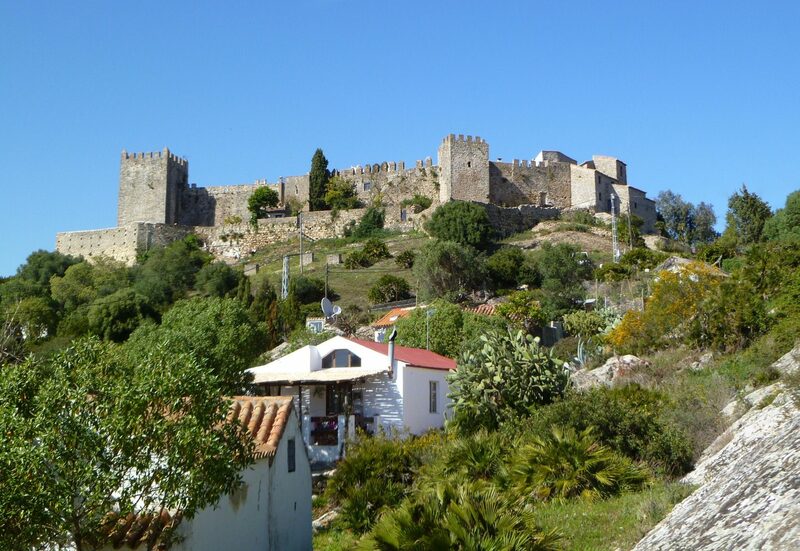 The town inside the castle walls. 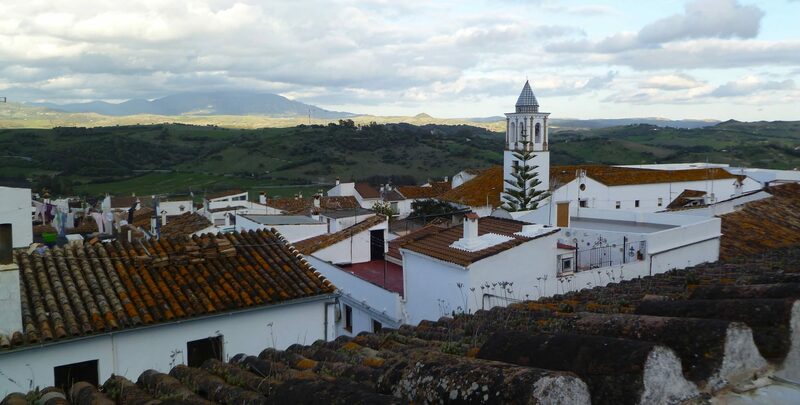 The architecture is typical of the region: white walls, tile roofs, narrow stone paved streets, and security bars on every window. 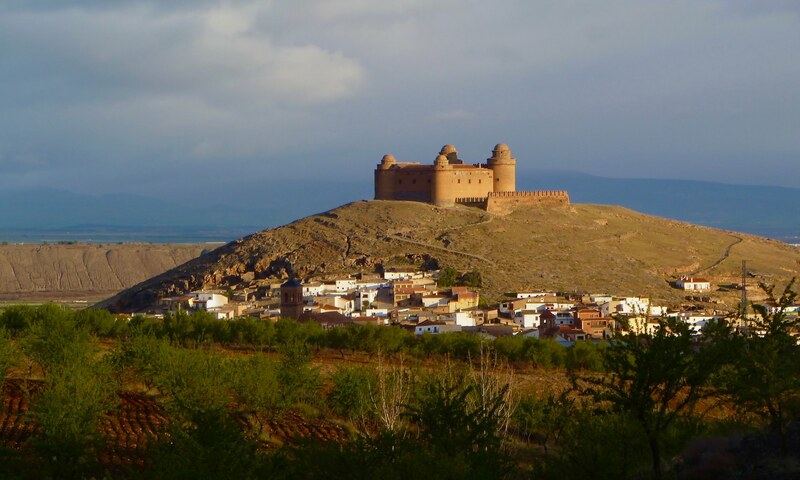 This walled town dates back centuries and was fought over many times. 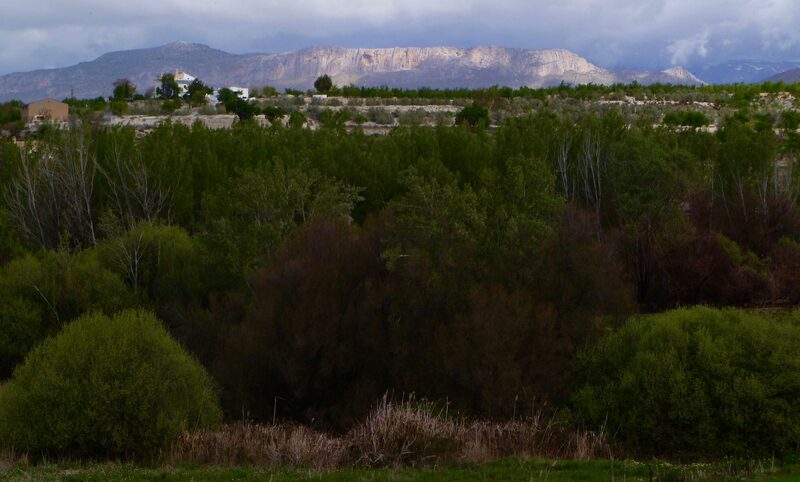 Jimena de la Frontera. 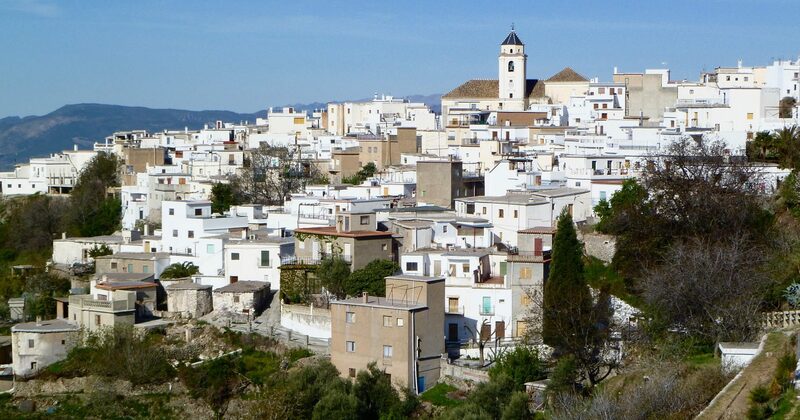 A typical “Pueblo Blanco” (White Town) of southeastern Spain. 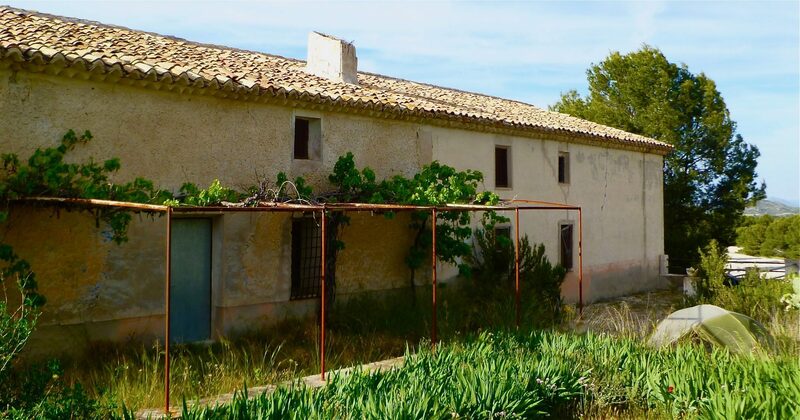 We spent the night in a small casa rural, which is similar to an English B&B. 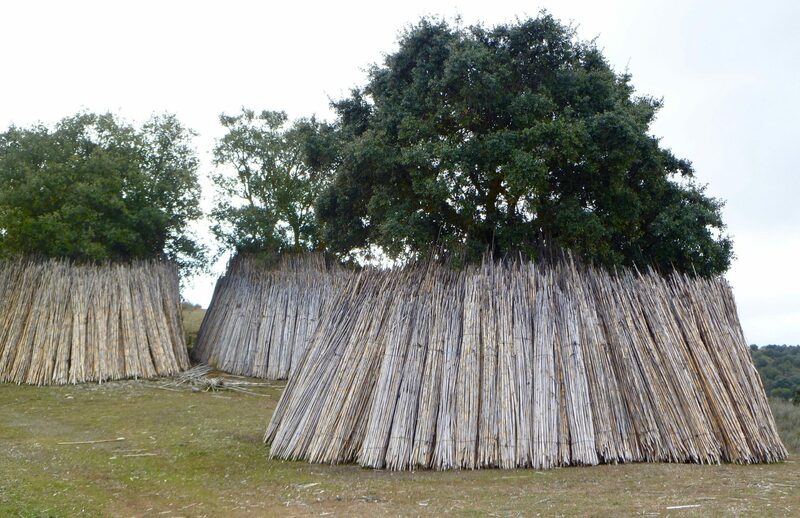 A cork-oak stand. The bark is sustainably harvested primarily to make wine bottle corks. 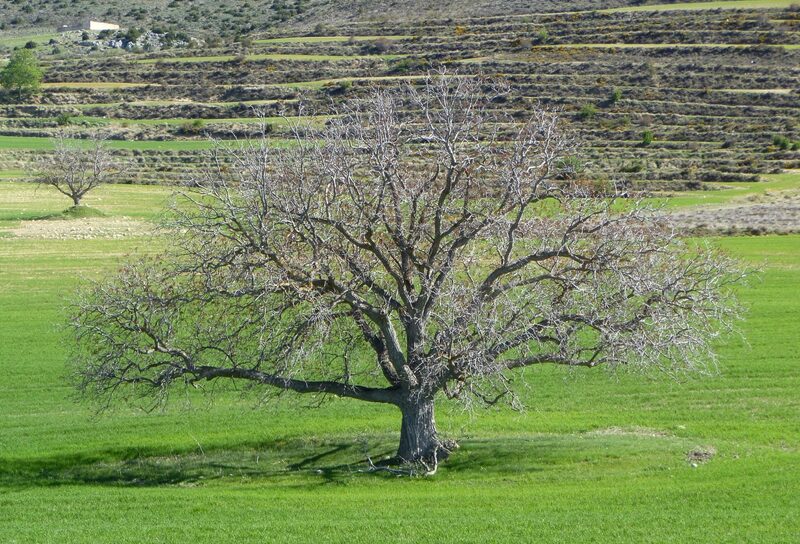 A tree will be stripped of its lower bark every twenty-five years or so. Late afternoon day 5. 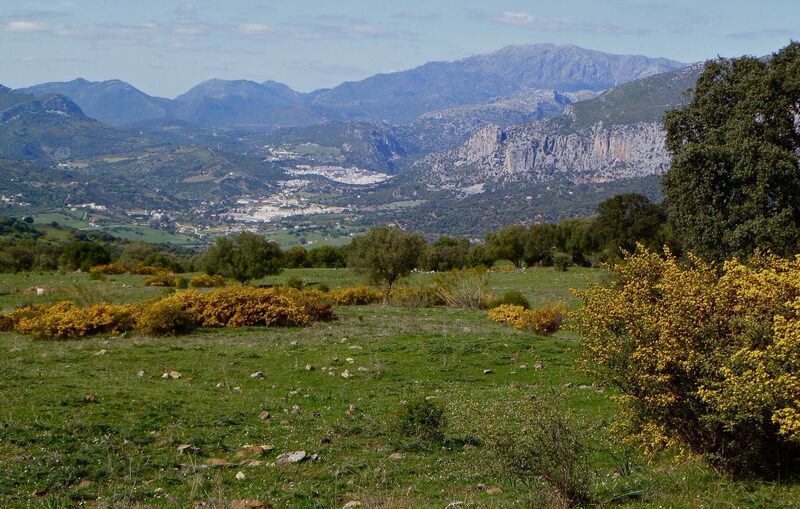 Looking down a long valley with the large town of Ubrique in the distance. 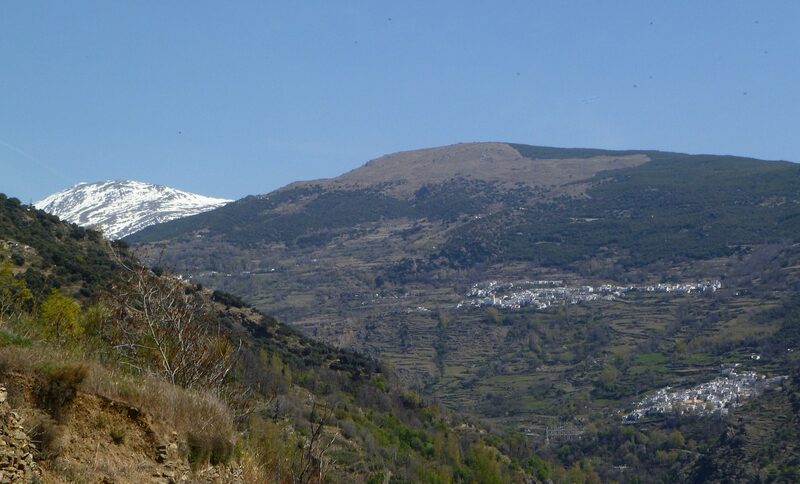 The GR-7 passes through town and on up the valley to the right. 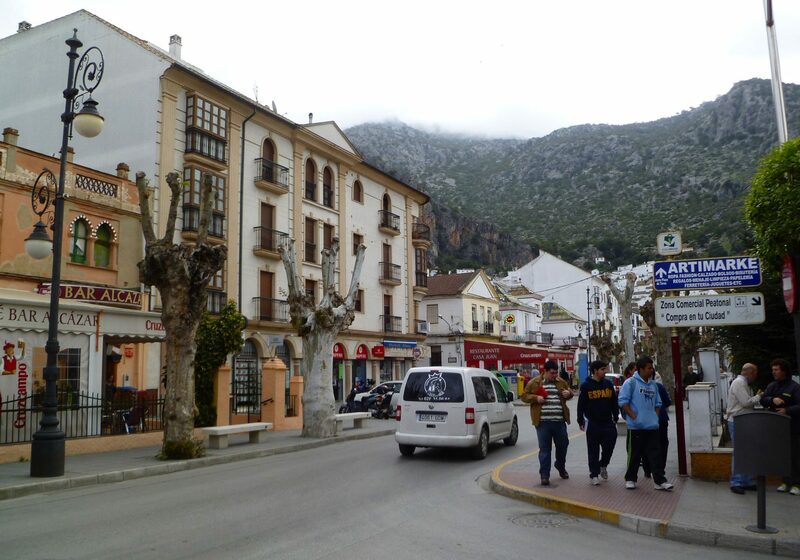 Ubrique: this is a major commercial center for the region and was bustling with morning activity. 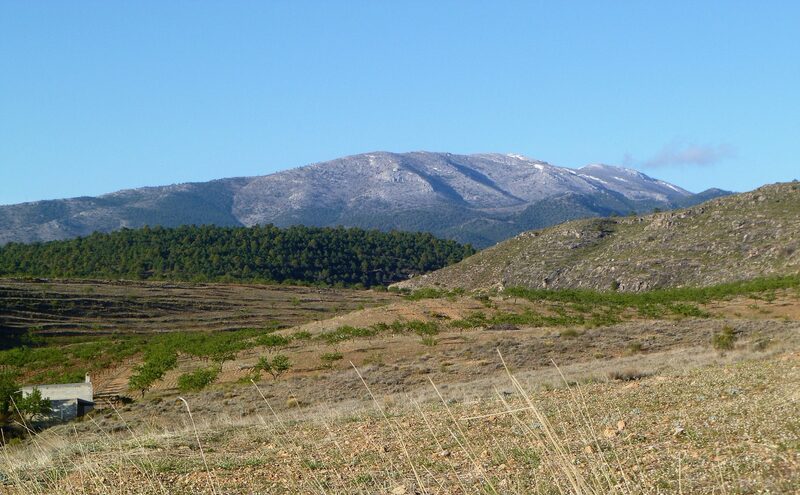 Beyond Ubrique, the GR-7 follows an ancient Roman Road from Ubrique to the smaller hill-town of Benaocaz. 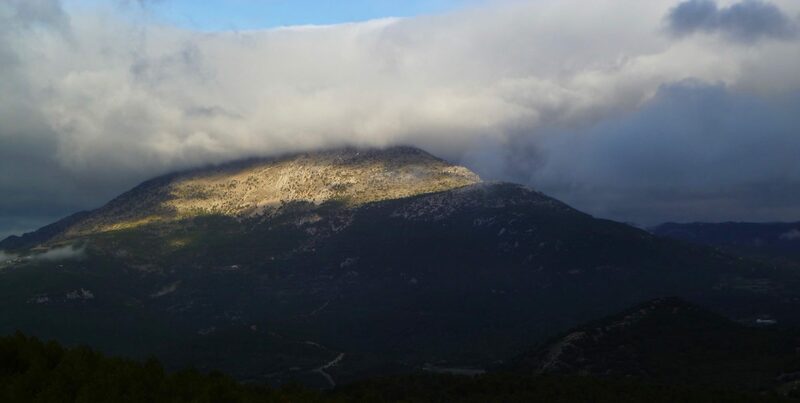 Approaching Benaocaz; the weather has turned cool and grey and will mostly remain so for several days. 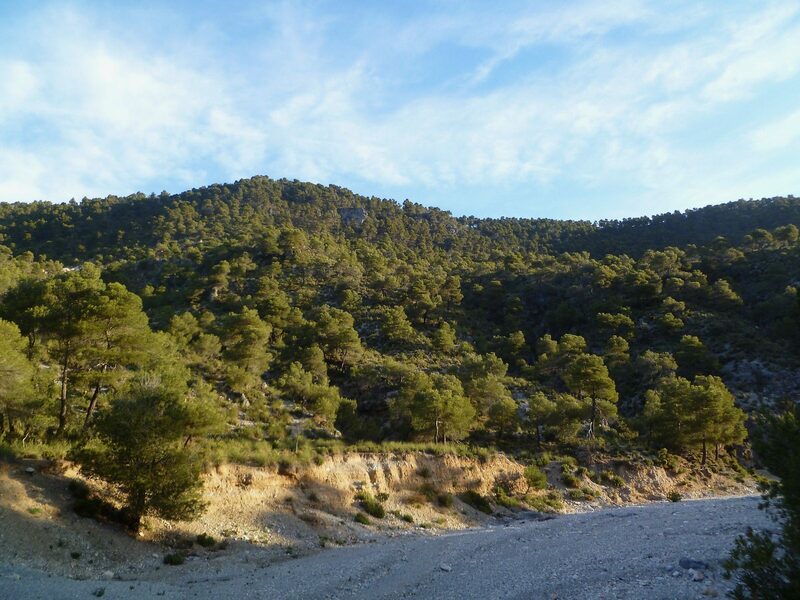 Beyond Villaluenga del Rosario, we climbed into wilder country on small trails. Campsite night 6. Intermittant rain for most of the night. Leaving Montejaque and on the way to Rhonda. 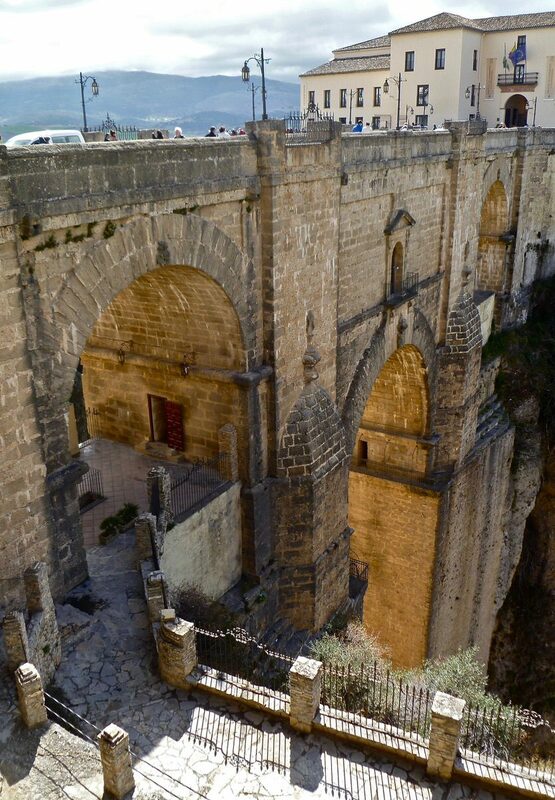 Rhonda: this is a major tourist destination with buildings dating back to Roman times. 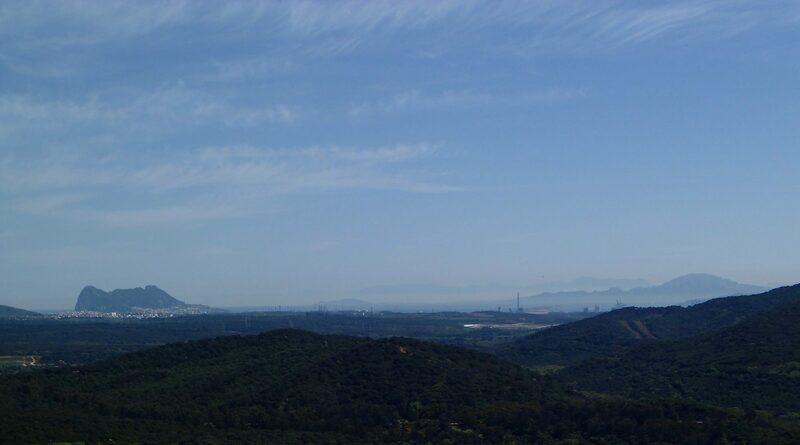 The view is back to the mountains we just crossed from Ubrique. 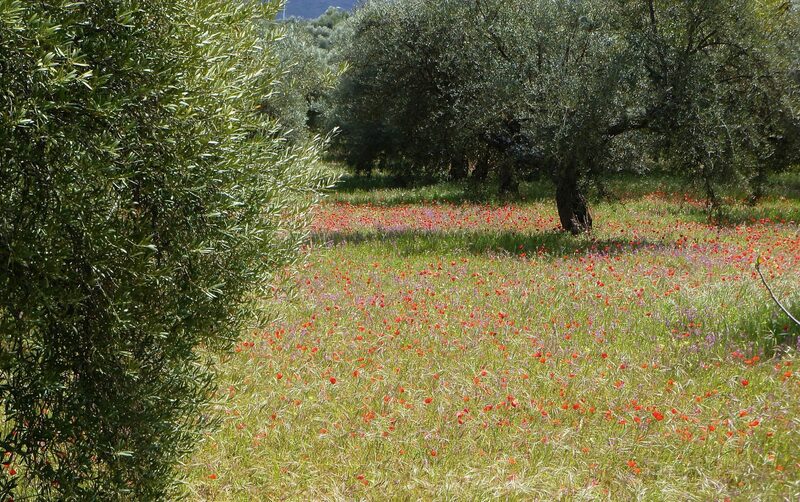 Fields with blooming poppies and olive groves were a common sight on this walk. Morning day 8, just after a downpour. Washing socks in a public fountain. These were common along the GR-7 and their spigots were a source of good potable water. 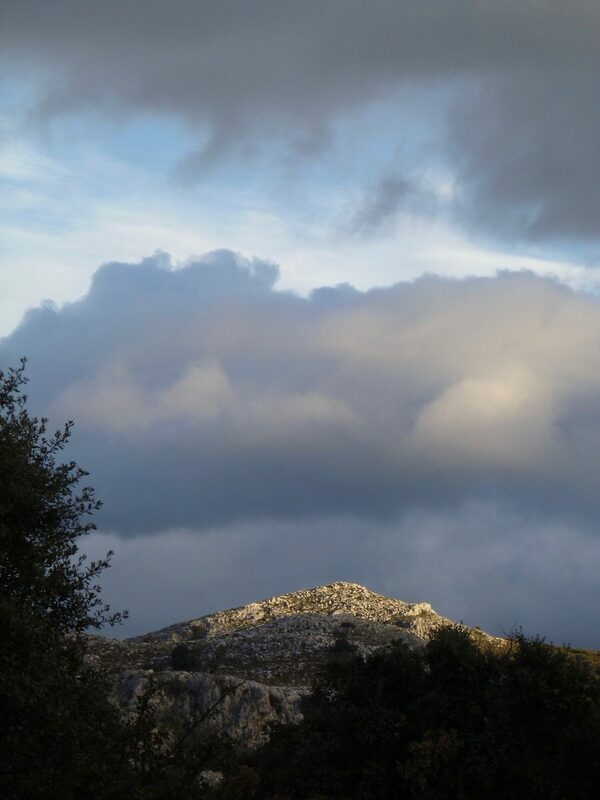 Ardales. We had a tasty dinner here (octopus and honey eggplant) in a randomly chosen little restaurant. 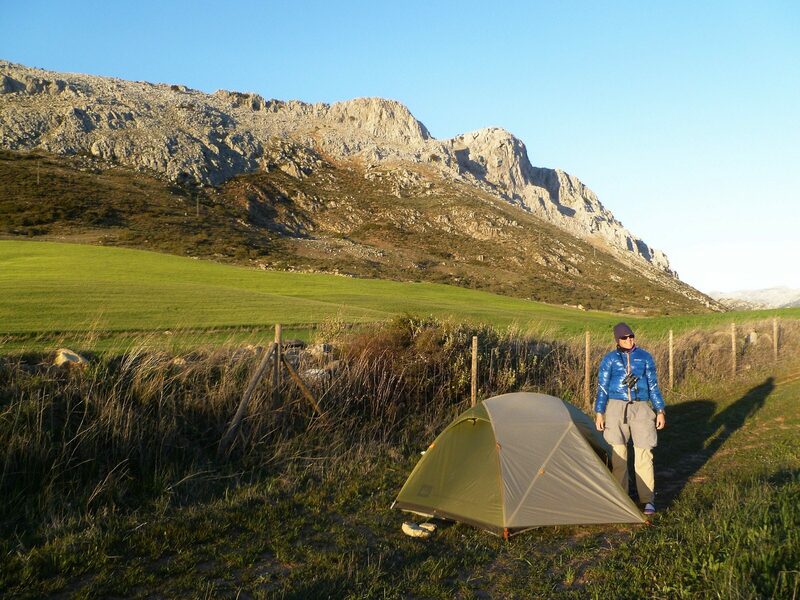 Late evening day 8 beyond Ardales, looking for a flat campsite. Campsite night 9. 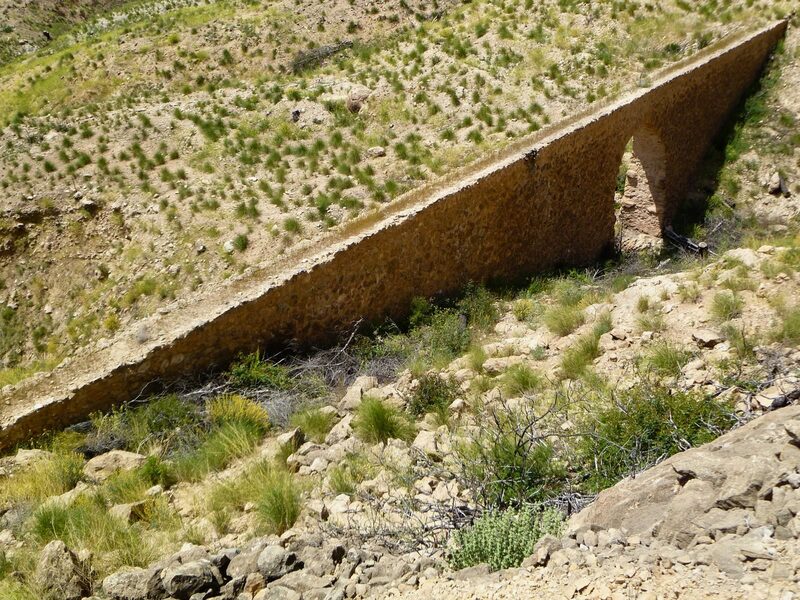 This site was located just below the top of hill overlooking Valle de Abdalajis and appeared to be a newly constructed platform for building a house. 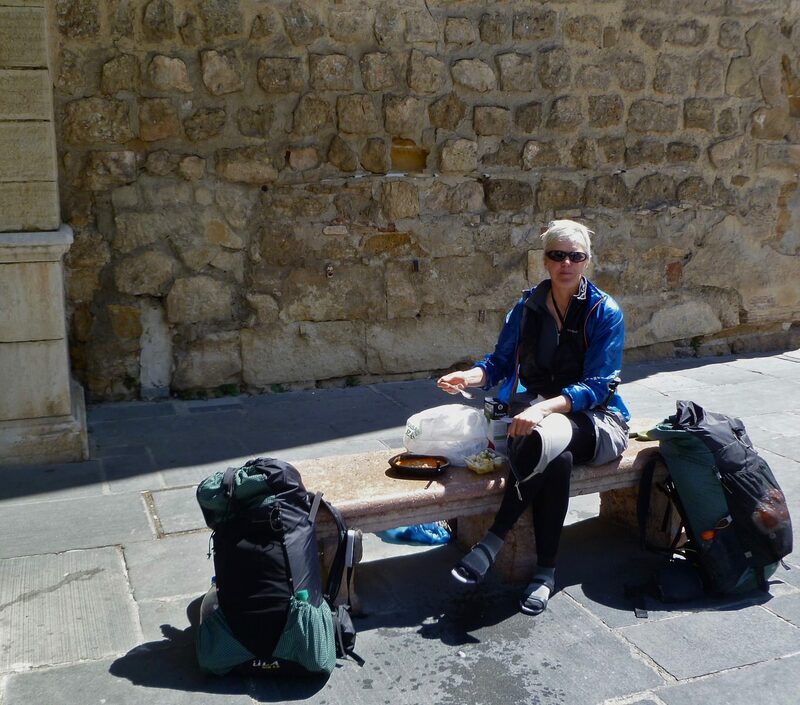 Take-out roated chicken and gazpacho deli lunch in Antequera: eating in front of the main cathedral. The food was terrific. Campsite night 10. 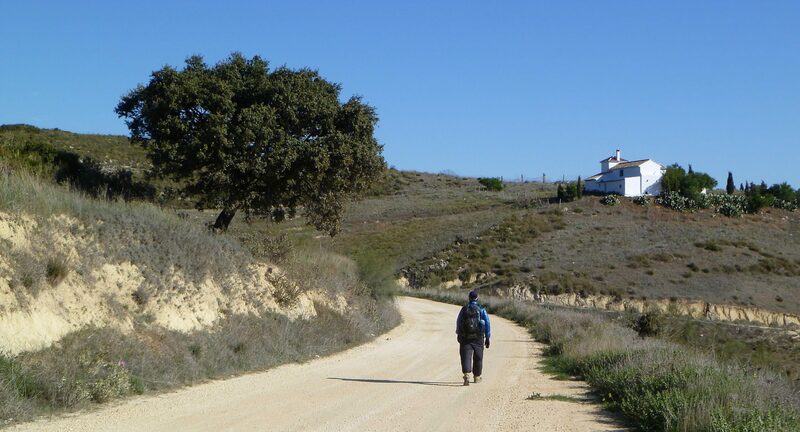 Another five star site, this time in a pasture overlooking a wide valley..
Riogordo: walking through these small villages was always a fun puzzle as the route signs vanished and the streets were narrow, twisted and led in a myriad of directions. You were never quite sure where you were and how to get to the other side of town. 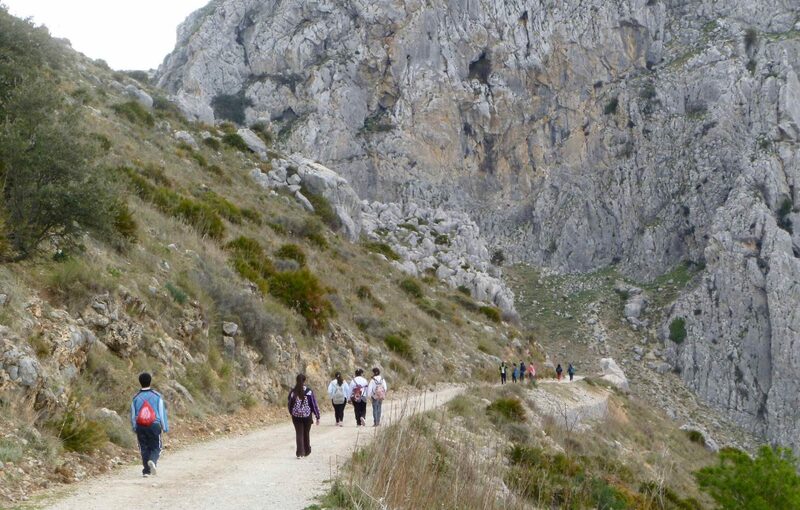 We found ourselves walking with a large group of kids heading to school in Ventas de Zafarrayas. Many of these kids walked 4 or 5 k each way every day. At Zafarrayas, the GR-7 split into its northern and southern alternates. We took the southern route. 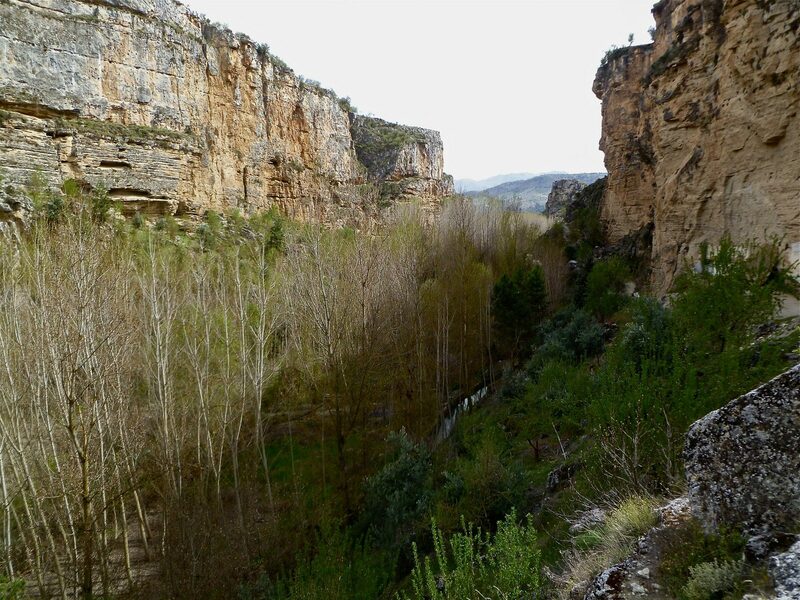 The limestone gorge outside of Alhama de Grenada. 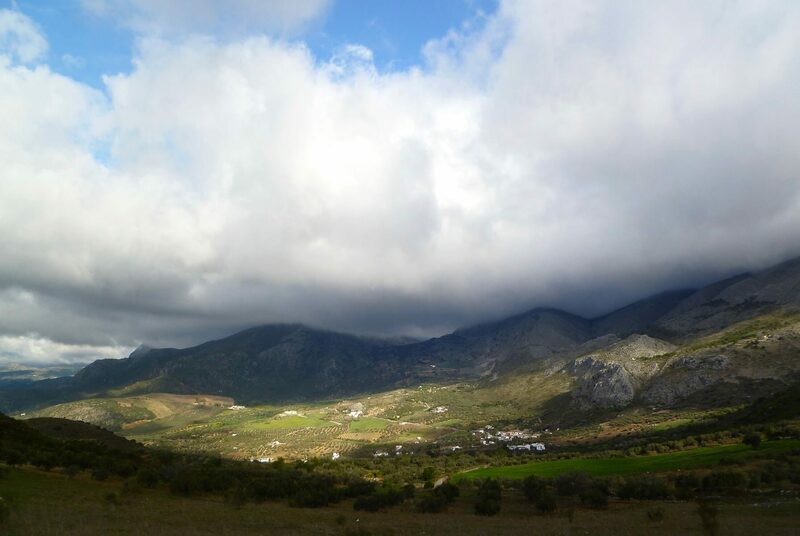 Alhama de Grenada. We stayed in a small hostel in this town. 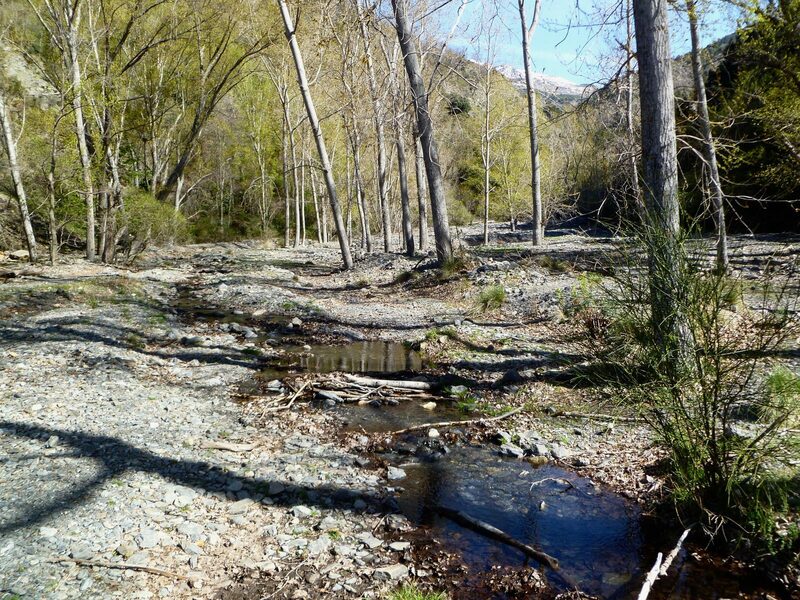 The route down to Albunuelas followed a wide dry streambed that must really flood hard whenever it rains heavily. Campsite night 15 on a old agricultural terrace. We had a flyby Northern Goshawk here. 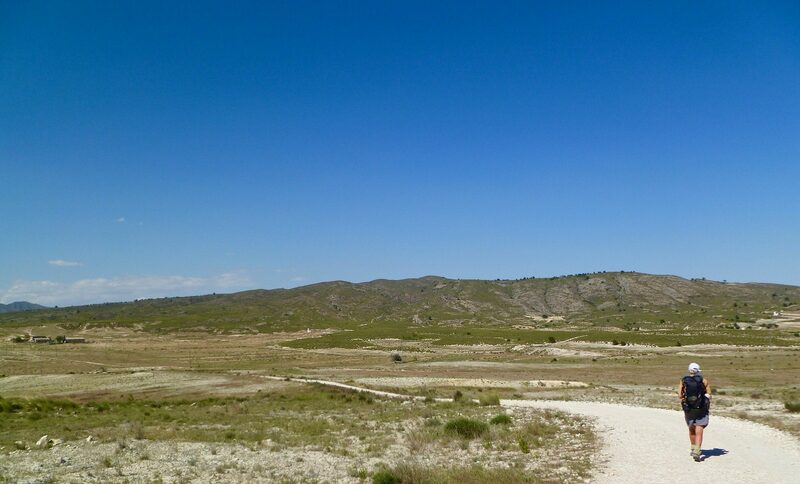 Mountain biking is extremely popular in this area. 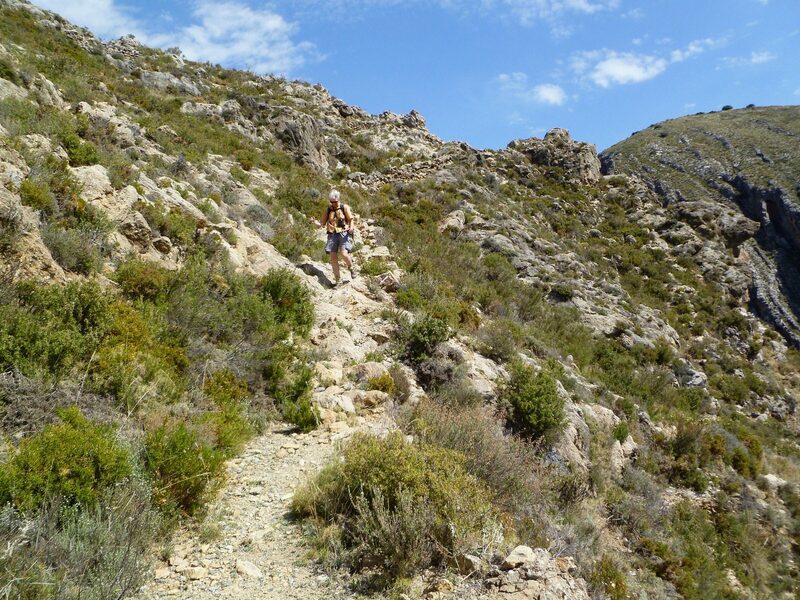 The trails start to become a bit more mountainous in nature. Followiing a diversion off of the main GR-7 up towards Tello. 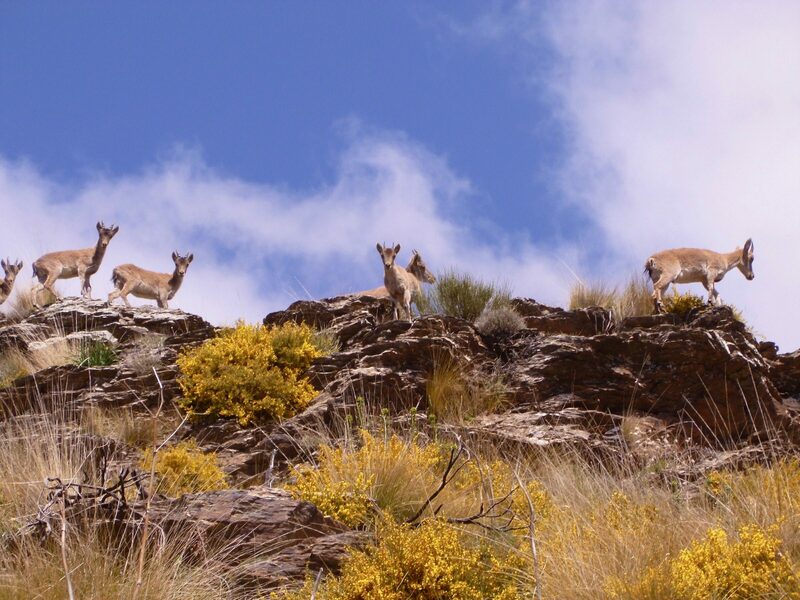 Spanish/Iberian Ibex (Capra pyrenaica). We saw quite a few of these animals. We had breakfast in Canar’s town plaza. Like many of these small villages, there were very few people out and about early in the morning. 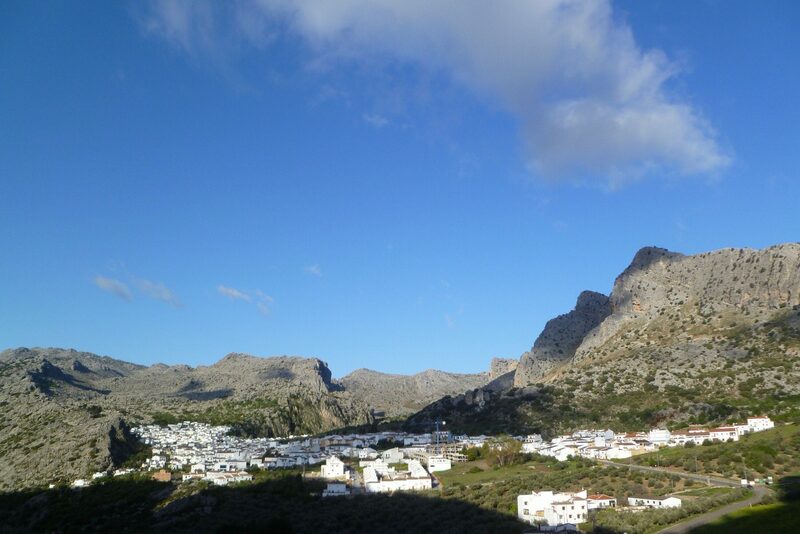 The lovely hill-town of Canar. The creek behind the dam. No reservoir at all. Pampaneira. We had a tasty pizza lunch here. This town makes its living catering to tourists and is filled with craft shops selling trinkets of varying quality. 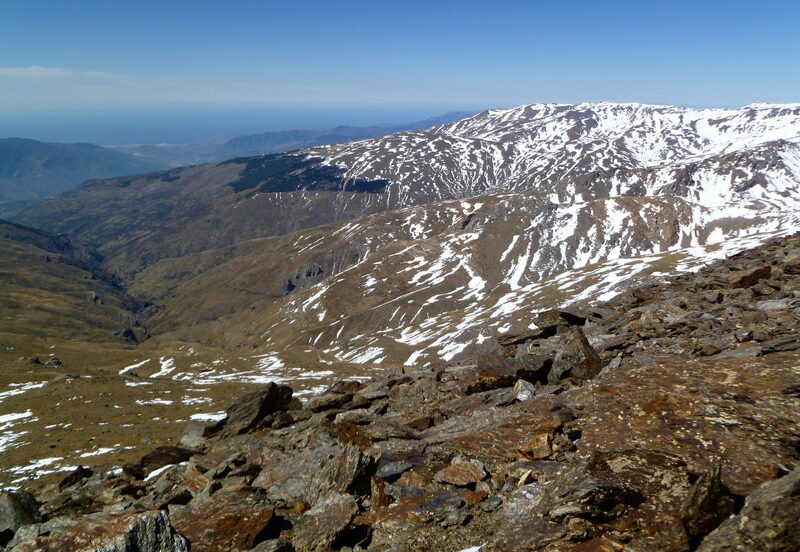 The next morning looking up towards today’s goal, the summit of Mulhacen (the high point well right of center), which is the highest peak (11,413′) in continental Spain. Looking south toward the Med from near the summit. 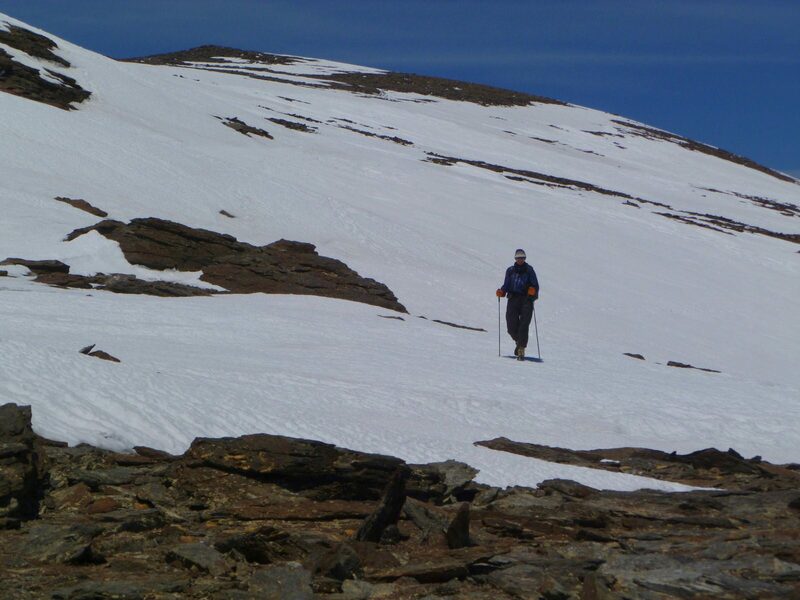 The climb was easy class two with an occasional crusty snowfield to cross. However, it was extremely windy and we had to keep moving to stay warm. Descending via a more eastern track. 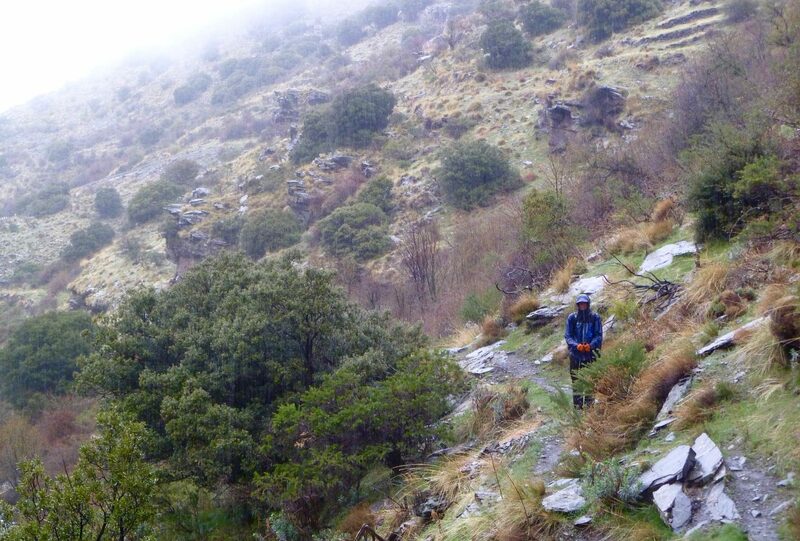 The Spanish Sierra Nevada is definetly not as steep, rugged, or scenic as our Califonia Sierra Nevada. Looking back toward Mulhacen from our dinner spot. Capilerilla is a busy place with lots of tourists. We hope they didn’t mind sock washing in the town square. The landscape continued to change character. 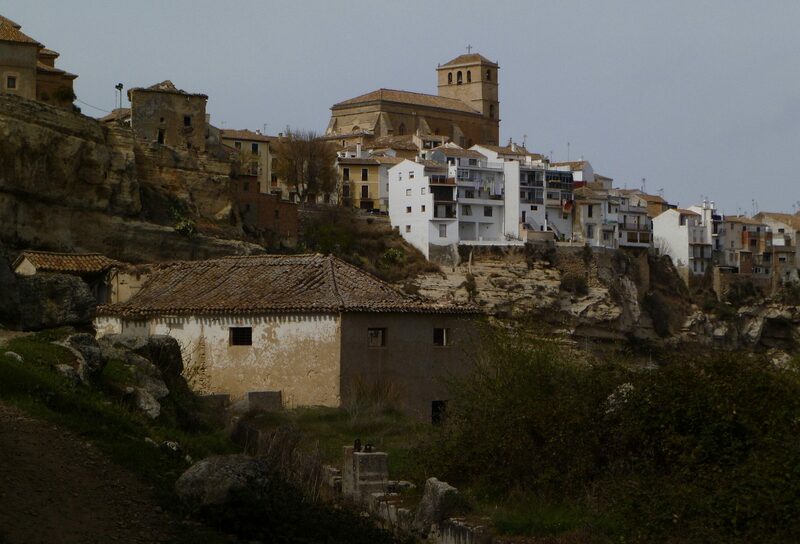 Approaching Bayarcal, the last town we passed through on the southern side of the Sierra Nevada. After crossing the pass, we dropped out of the clouds and got a view over the vast valley we would cross the next day. 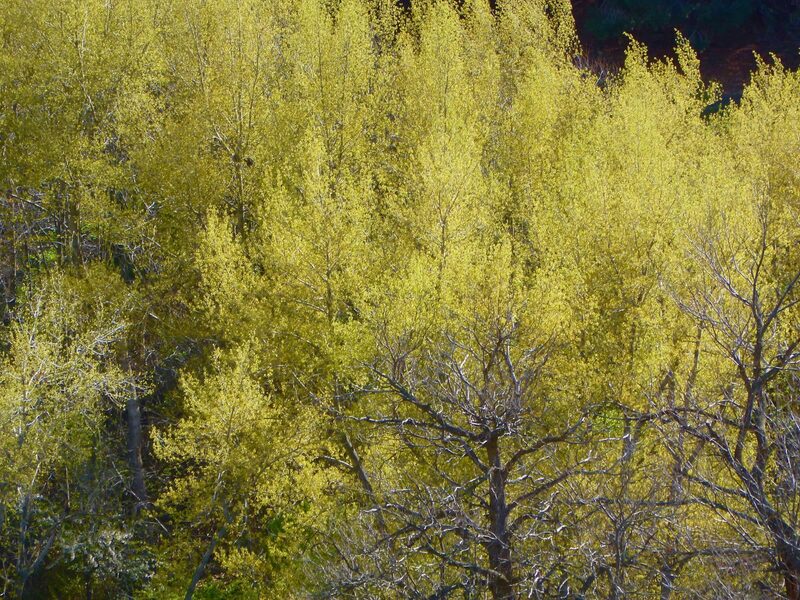 Some of the leaves were just flushing out on the north side of the mountains. 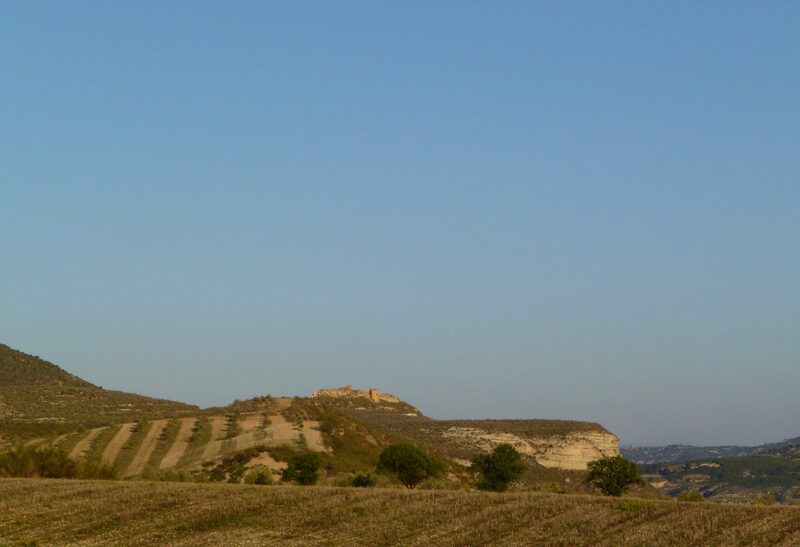 Starting to cross the open valley; looking back at La Calahorra castle. 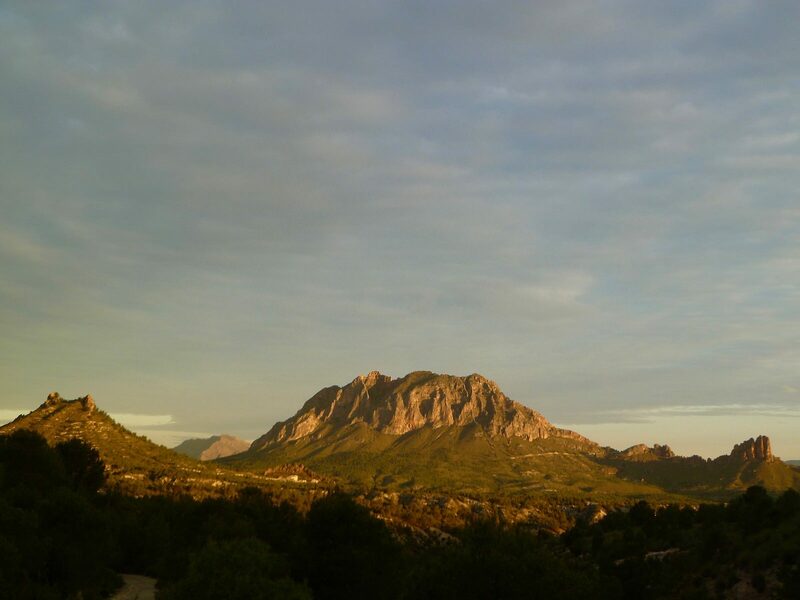 Later in the evening, it cleared up a bit and we had spectacular views of the mountains. Heading over the pass the next morning; more snow squalls. 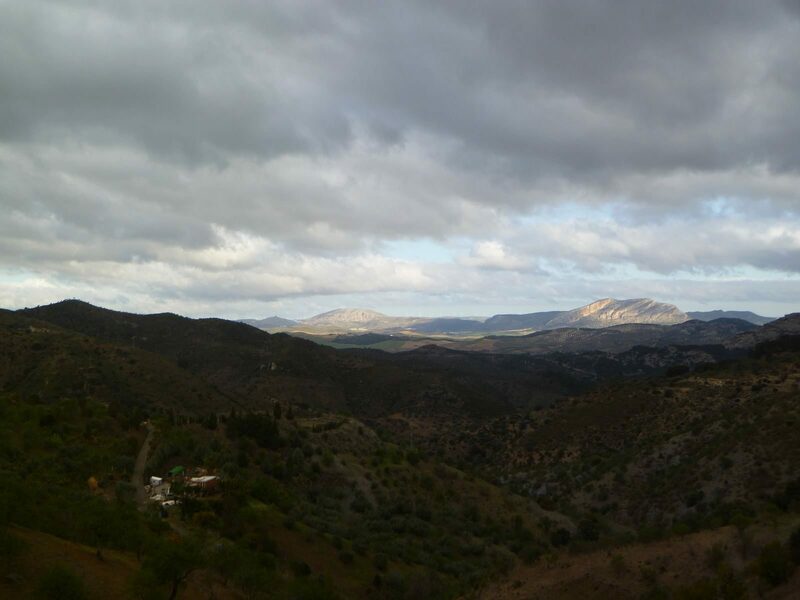 Looking back toward the Sierra de Baza we had just crossed. At least Amy was able to buy a Mojito bar, an ice cream treat she became addicted to. 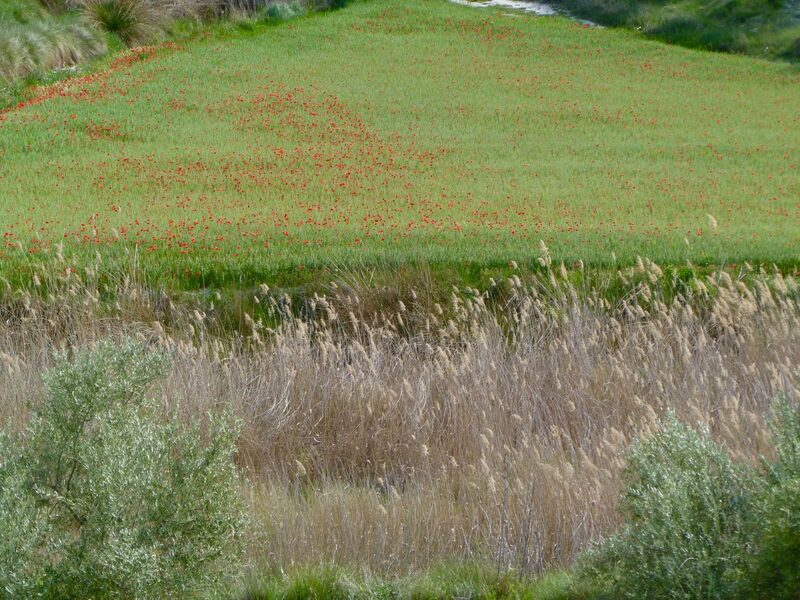 But the olive groves still dominated a lot of the area. 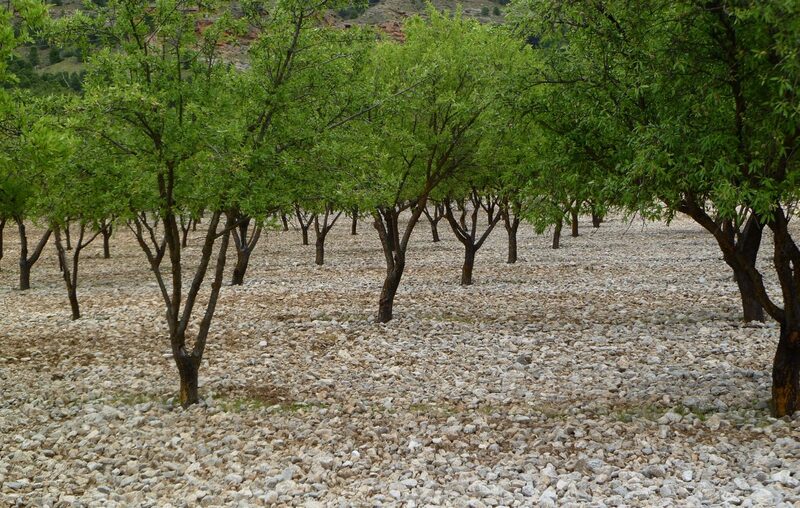 Almond groves. No camping here. Campsite night 25. 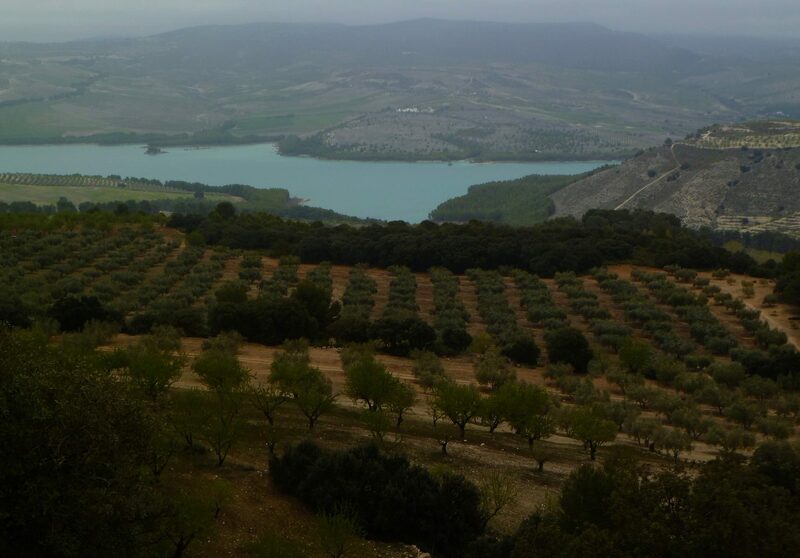 A five star site on top of a ruin studded hill overlooking the reservoir and the surrounding area. There was a tiny flat place just big enough for the tent. The next morning dawned clear and warm. 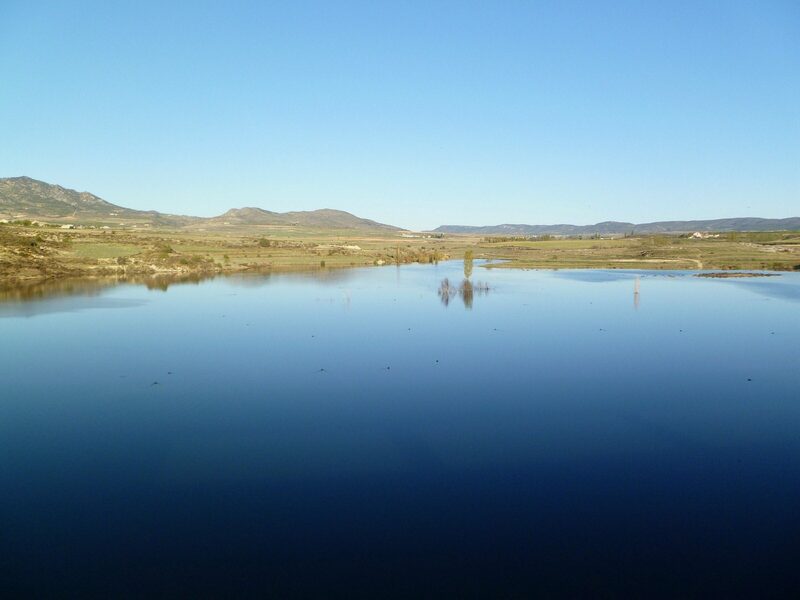 The reedbeds at the end of the embalse were full of chattering birds. 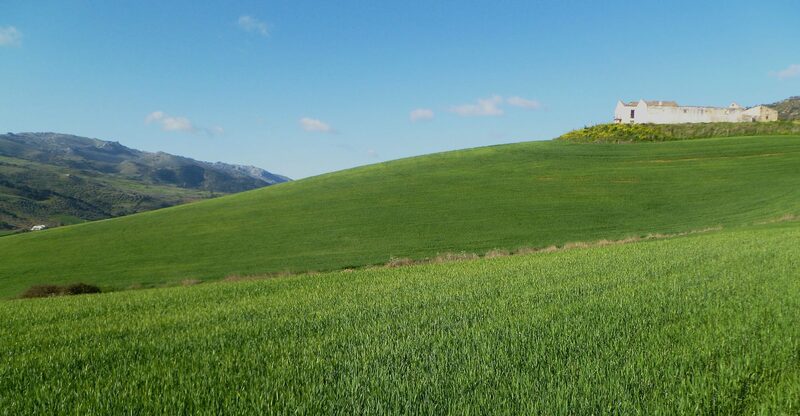 Beyond Cullar, the landscape became much more fertile. Campsite day 26 had fine views over the vast agricultural plain. 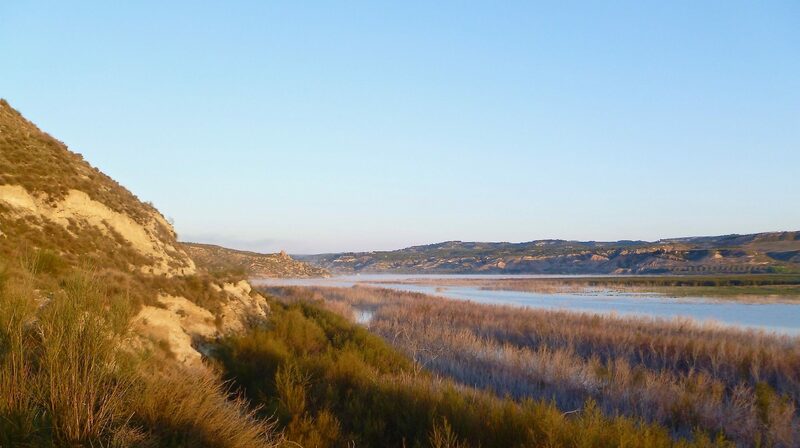 The next morning we followed a lush riparian corridor from Galera to Huescar. The trees were full of nesting birds. 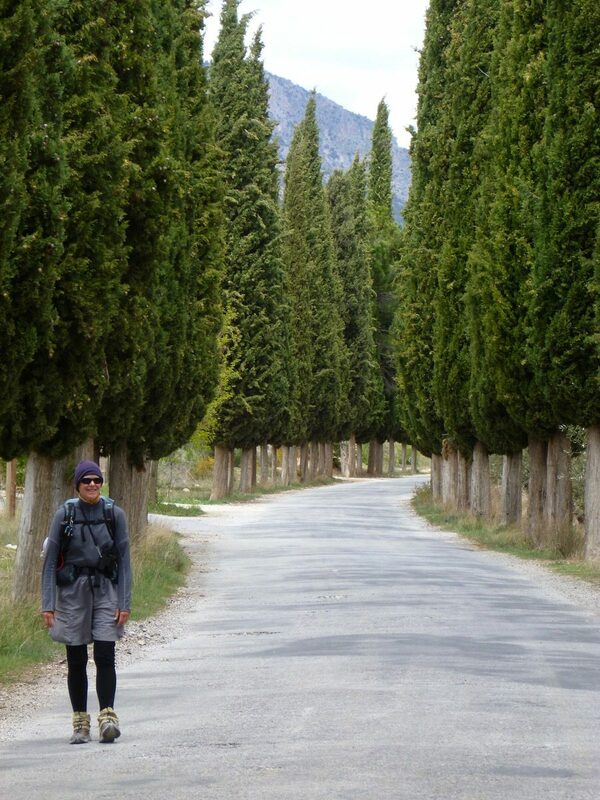 The quite road heading north out of town was lined for miles with cypress trees. Some weather was moving in the next morning. Night 29 was spent in a little dry and warm hay storage room in the old barn. A pair of Little Owls shared the building with us. The next day dawned clear and pleasant. The walking was varied and interesting all day. 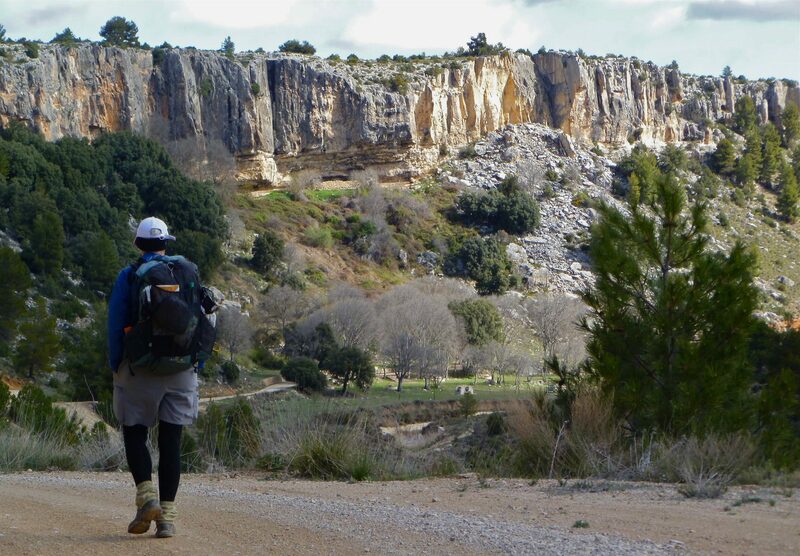 The route led into a lovely gorge that felt similar to the American southwest. 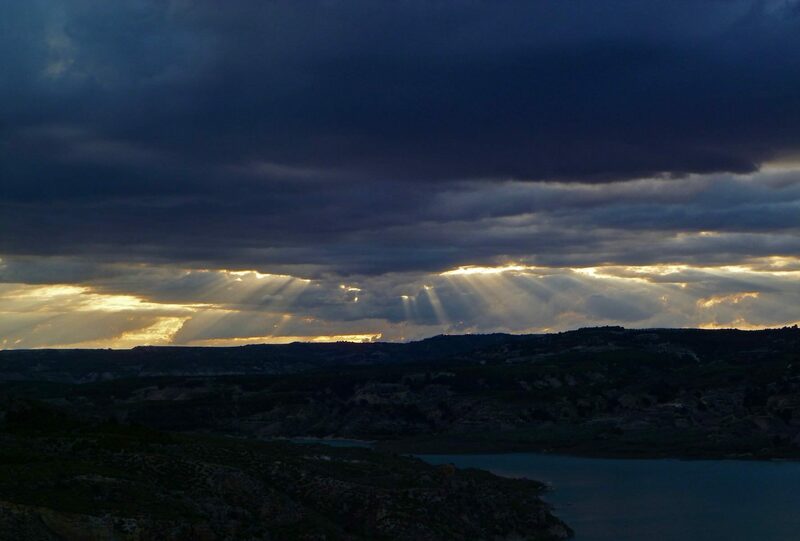 Embalse La Risca. We camped at the very far end in the small grove of trees. 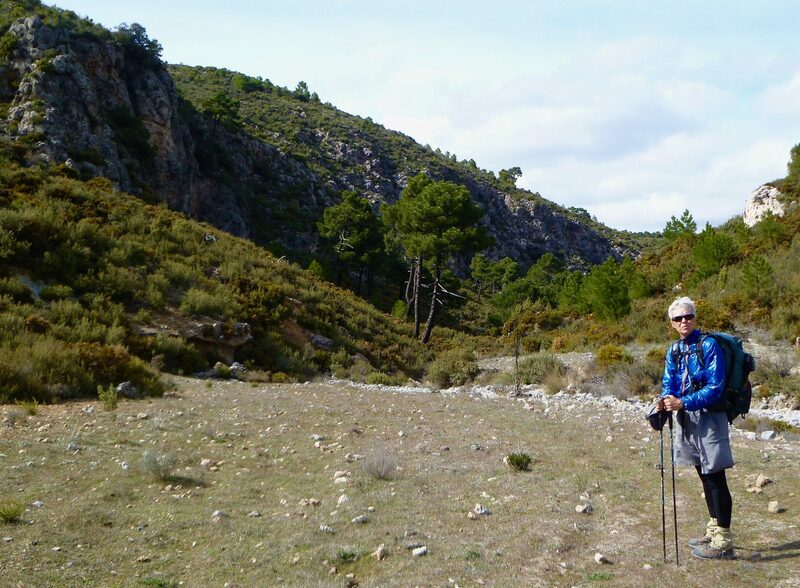 Walking through an isolated gorge toward Moratalla. 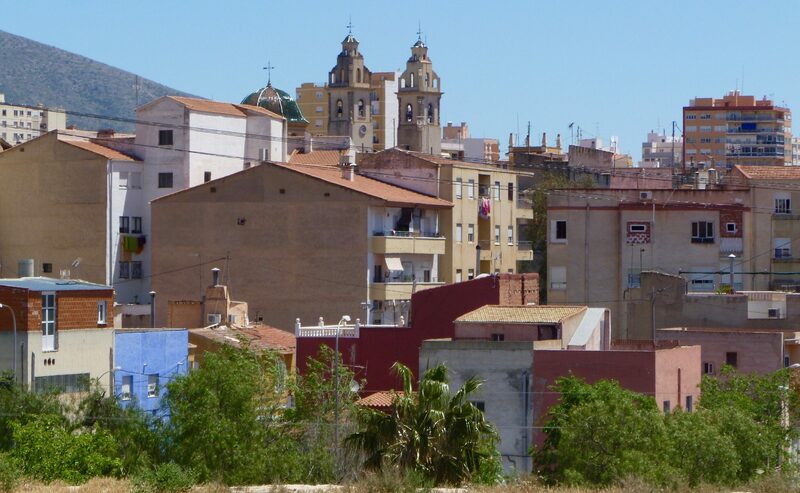 Moratalla was the first sizable town we passed through for the last couple of days. The town has a very different character from previous places we had walked through. Campsite night 31; on the patio of a mostly abandoned cortejo. We stopped earlier than usual as the day had become very hot. It cooled down nicely as evening arrived. Another hot sunny day. Amy is using Jim’s Chrome-Dome umbrella for shade. 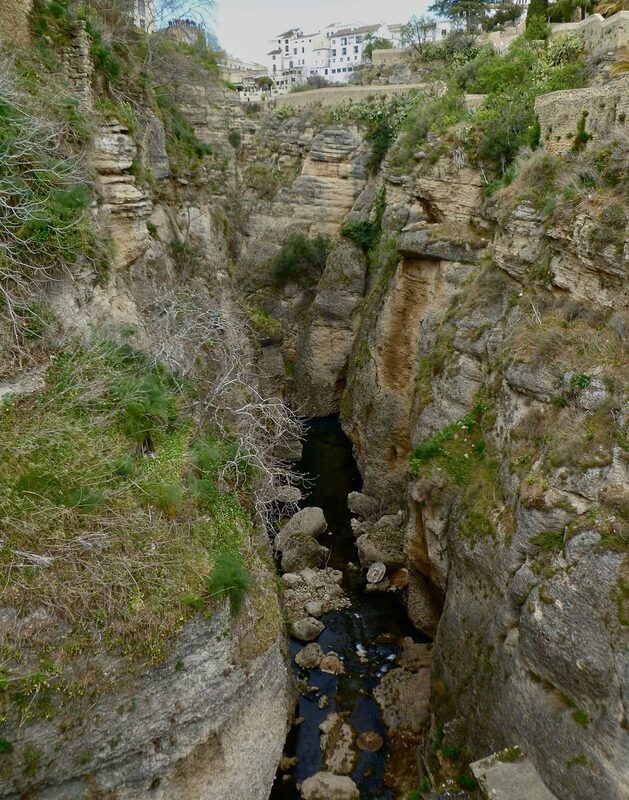 Old Roman aquaduct below the Sierra del Molino east of Calaspara. 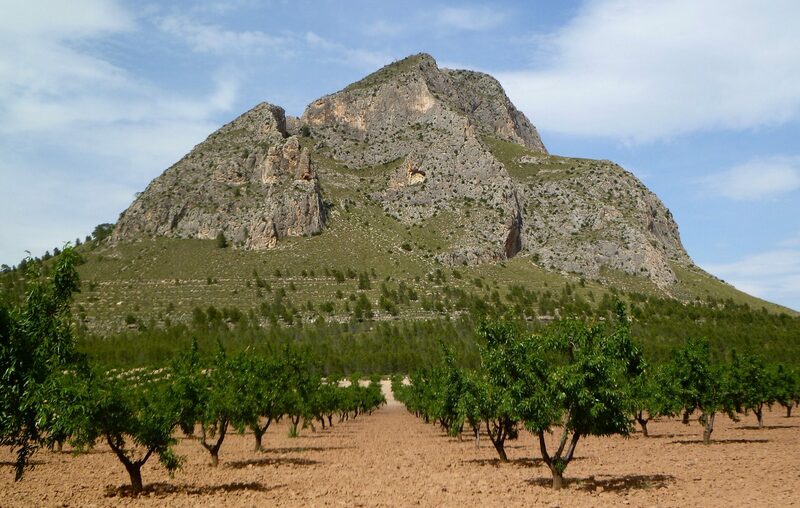 El Almorchon, a notable landmark in the region. 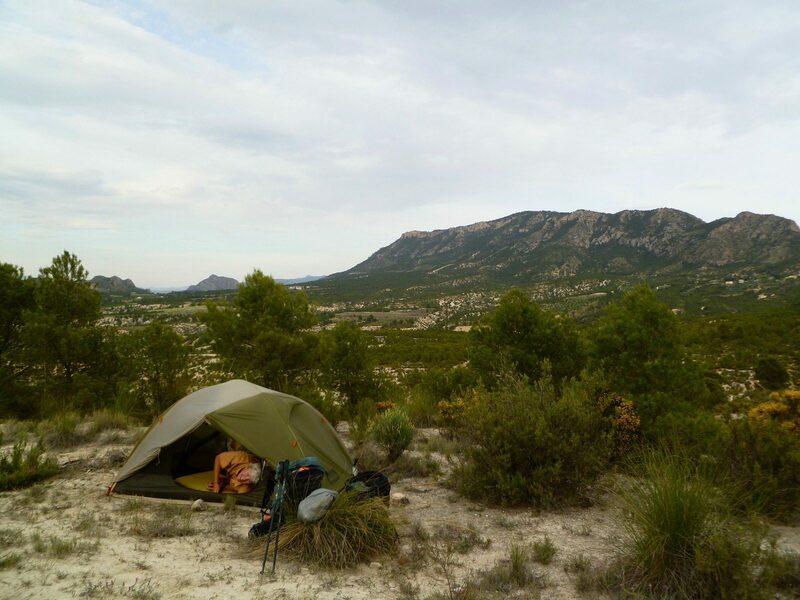 Campsite day 32 in a region of strangely eroded cliffs and gullies west of Cieza. 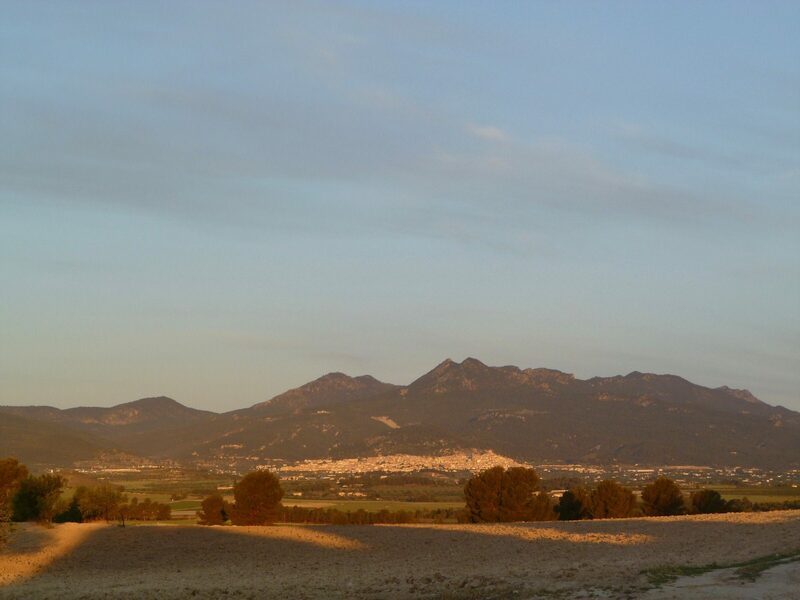 El Almorchon the next morning. An interesting early 20th century market building. 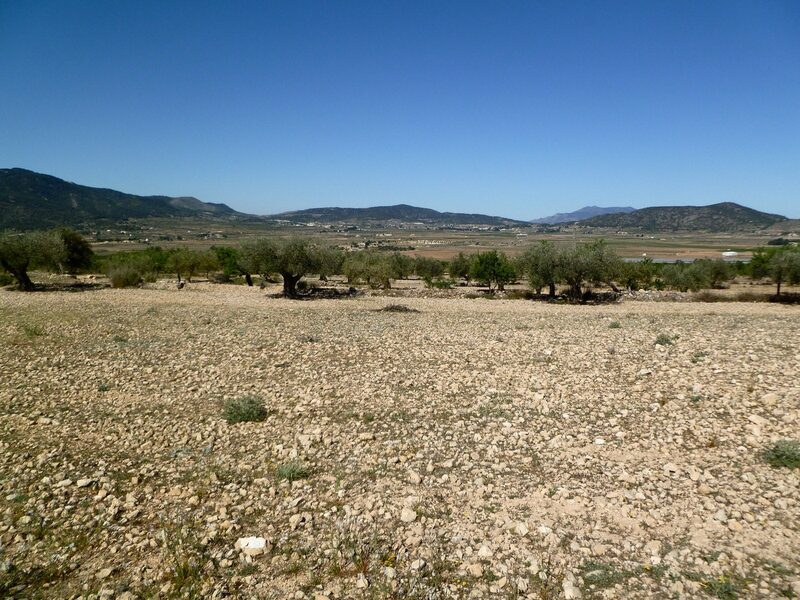 Drylands, low hills and heat; post Cieza. 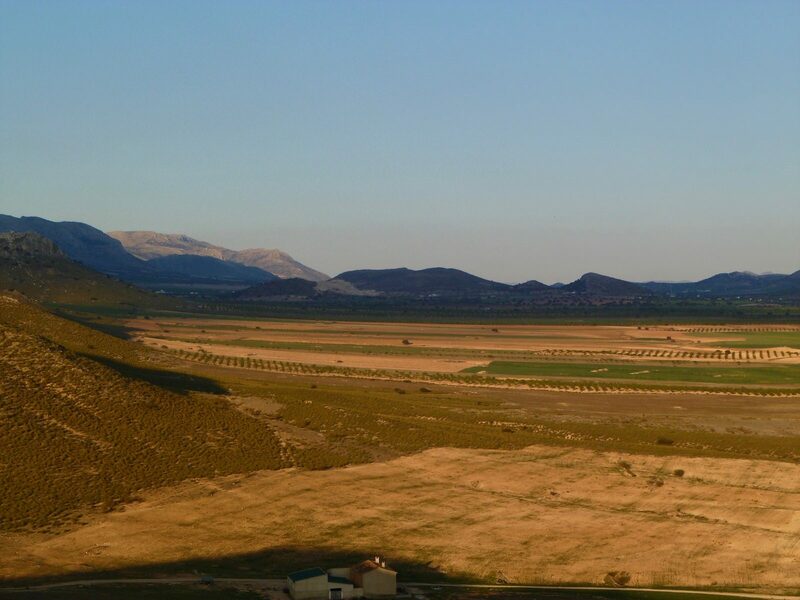 The farms in this area were really hard-scrabble compared to what we had seen earlier. 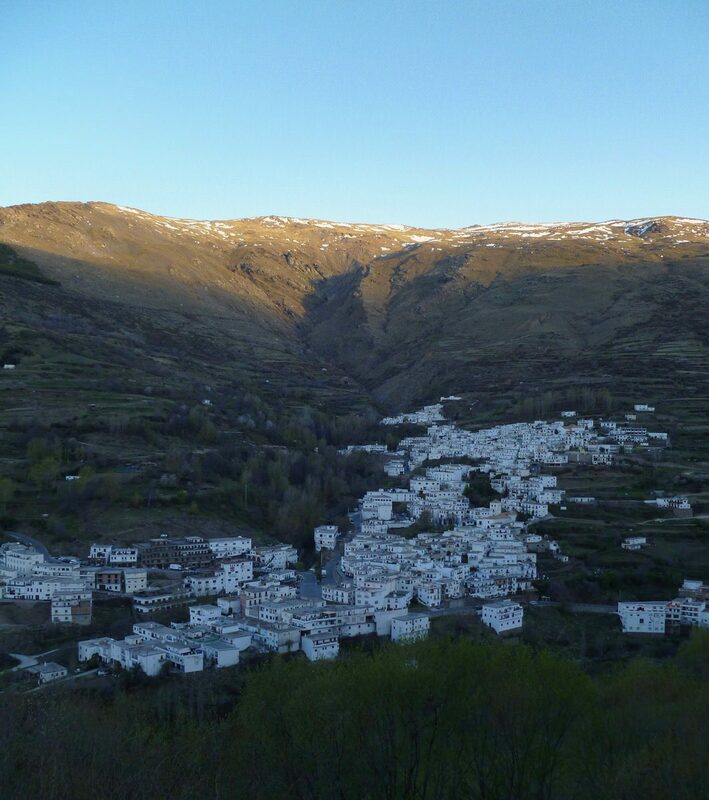 Elda; the last town on our GR-7 walk. Mid-day at Elda Station. 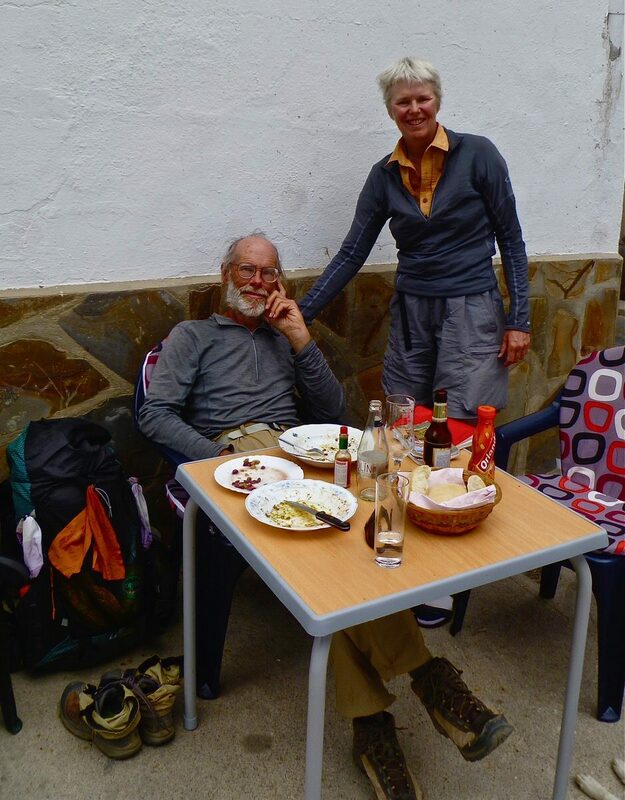 Just about 34 full days after stepping off the ferry in Tarifa. I agree with everything that James says in his assessment. This was an easy, straight-forward hike that was satisfying and worthwhile. Although not stellar, the scenery was pleasant and diverse. The towns were always interesting and the people we met were consistently outgoing and fun. The weather was generally good, and the food was great. Because most of the route is on either improved or rough dirt roads, I think I might have had more fun on a bicycle instead of on foot. 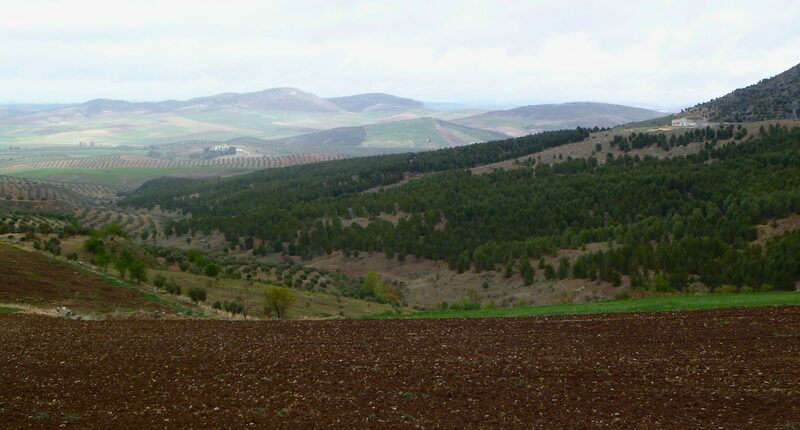 Knowing what I know now, I might recommend cycling the TranAndalus bike route instead of hiking this route to those who have an interest in both types of travel. That bike route is occasionally concurrent with the GR-7 and provides a well-documented extensive tour of the same region we hiked. Don’t get me wrong, this hike was very gratifying, but the plethora of dirt roads means that one could cover a lot more ground by traveling on a bike instead of on foot. The portion of the GR-7 that we walked was generally quite satisfying. 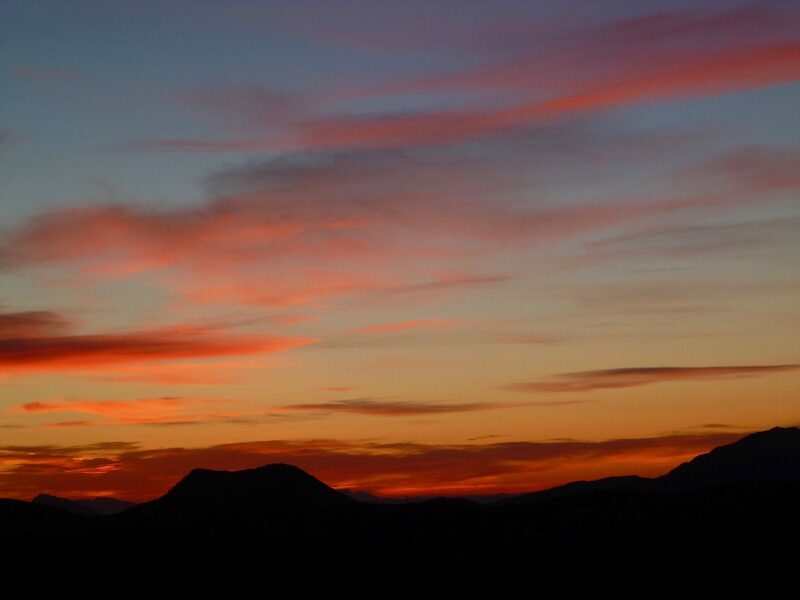 While the scenery was not awe-inspiring, it was almost always pleasing. 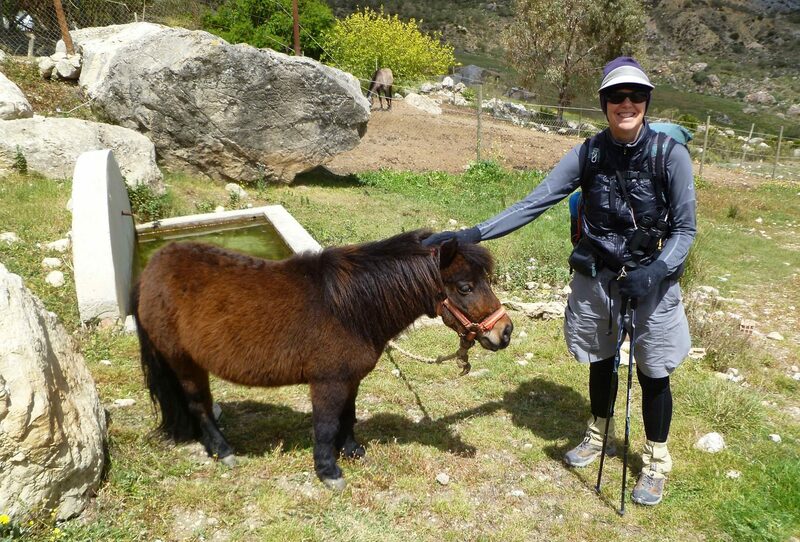 The terrain and physical environment had enough variety that the trip was rarely boring. 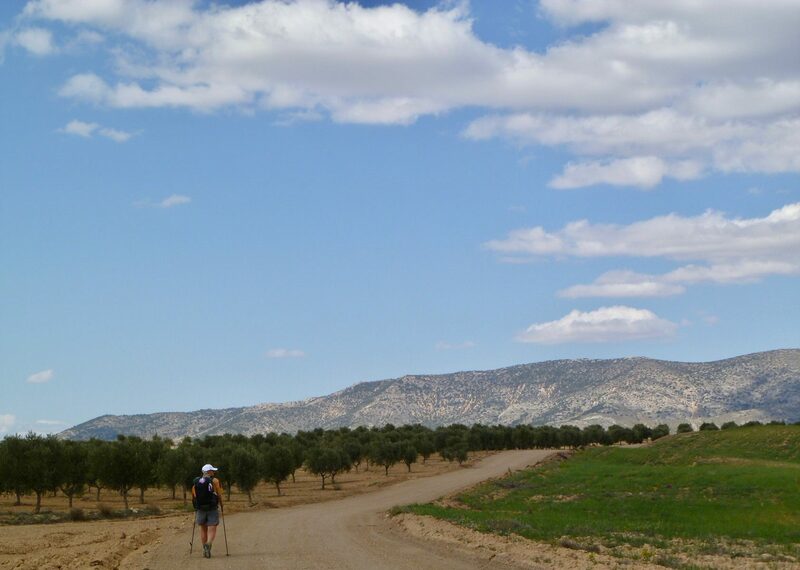 The walking was straightforward, mostly easy, comfortable, and rewarding. 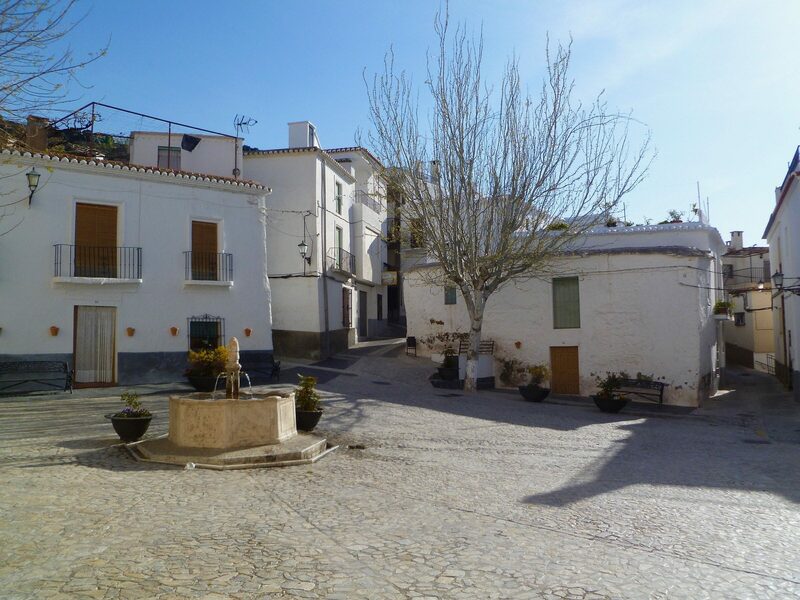 The small towns were usually quite beautiful and in harmony with their surrounding environment. People were friendly and helpful without getting in your face. The food was good. 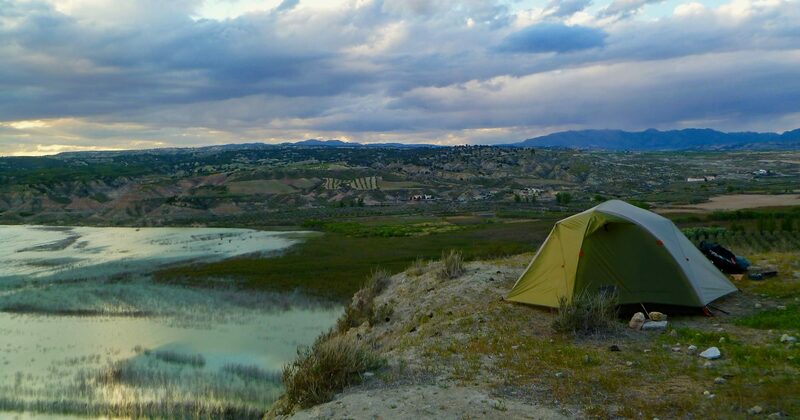 There is a great peace to the simple routine of a walk like this: get up, eat, walk, eat, walk, find a place to camp, eat again, sleep and repeat. 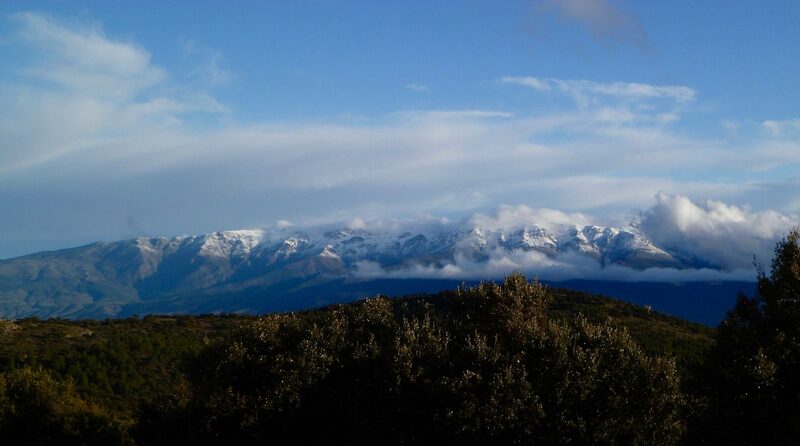 As the highest point on the southern variation is around 2000 meters, altitude should not be an issue for most people. For me, the highlight of this route would be its diversity. There were a great many varied and interesting places to see and explore. 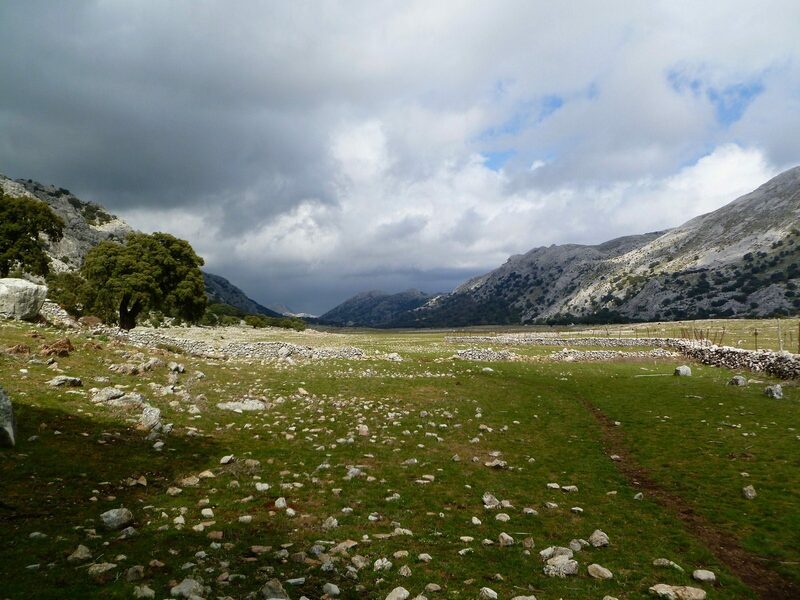 We started on the coast at sea level and reached over 11,000 feet in the Sierra Nevada. 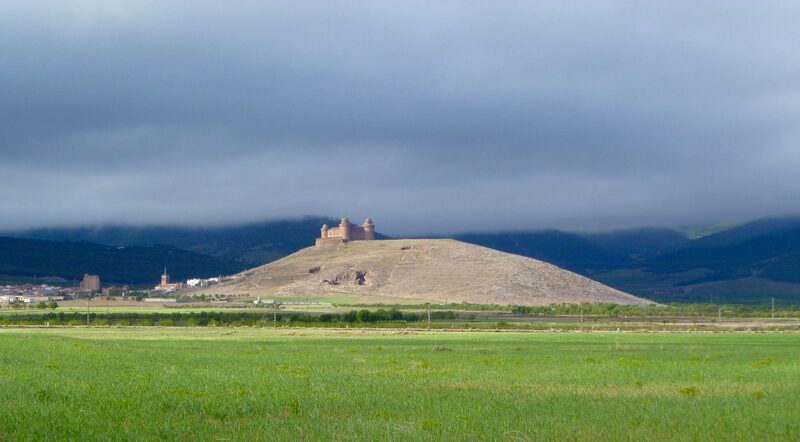 We saw ancient castles next to big solar energy farms. 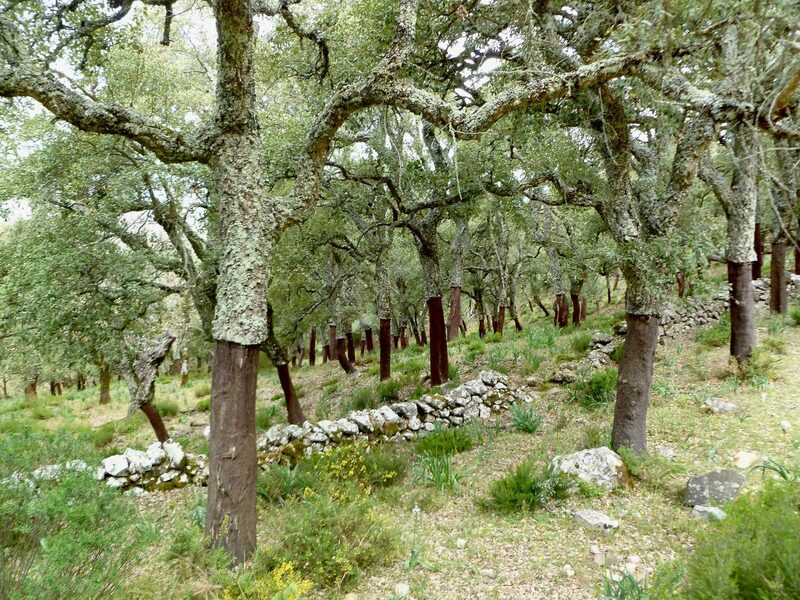 There were lovely cork-oak forests and arid badlands. 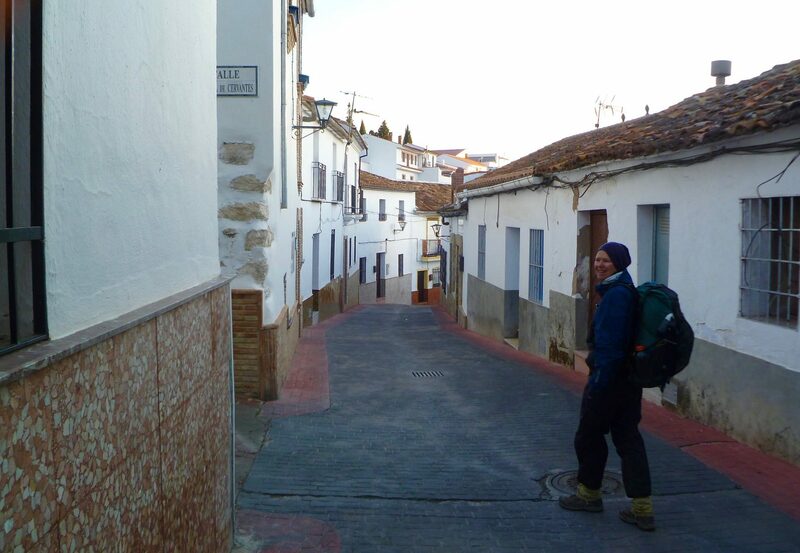 The many towns we walked through were usually very different from one to the next. Some had historical or cultural tourist attractions while others were just ordinary places where people lived. Many of the villages had been there for centuries with buildings from many eras mixed in together in mostly harmonious ways. 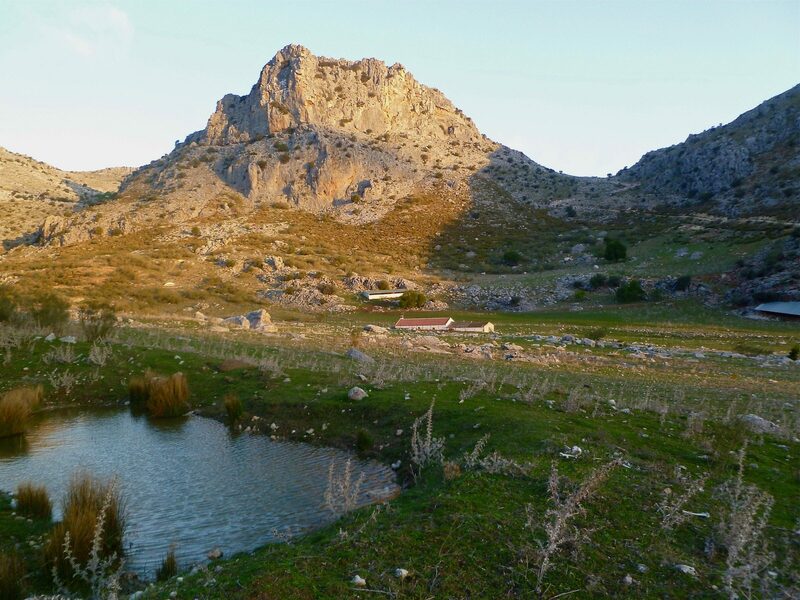 We spent a night in a cave house in Galera, saw a chicken festival in La Calahorra, and went swimming in the indoor Baños de Zujar. We camped in a barn with our own personal guard dog and a family of Little Owls, and on the sun-lit and vine draped-terrace of an empty farmhouse with great views in all directions. 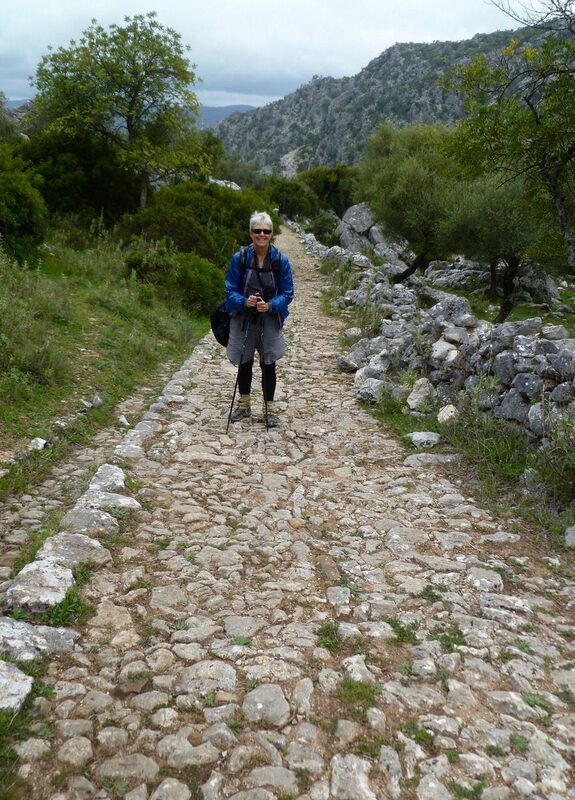 We walked on old Roman roads, dirt paths through vineyards and olive groves, and up old dry streambeds in the hills. It was novel for us to do a walk where we did not have to reach any particular final end point and could stop whenever we wanted. Meals were often entertaining as we were never quite sure what we might be served. 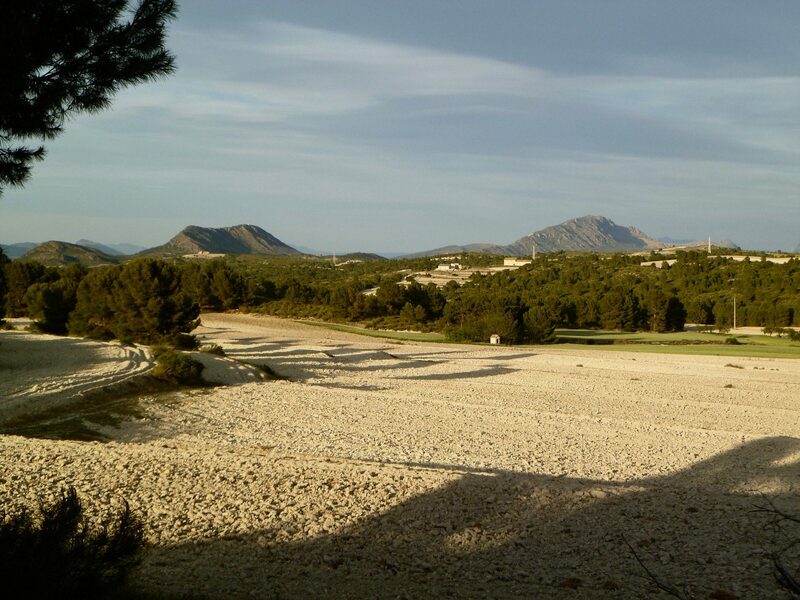 Most days had visually interesting changes to the landscape and I never found the scenery boring. 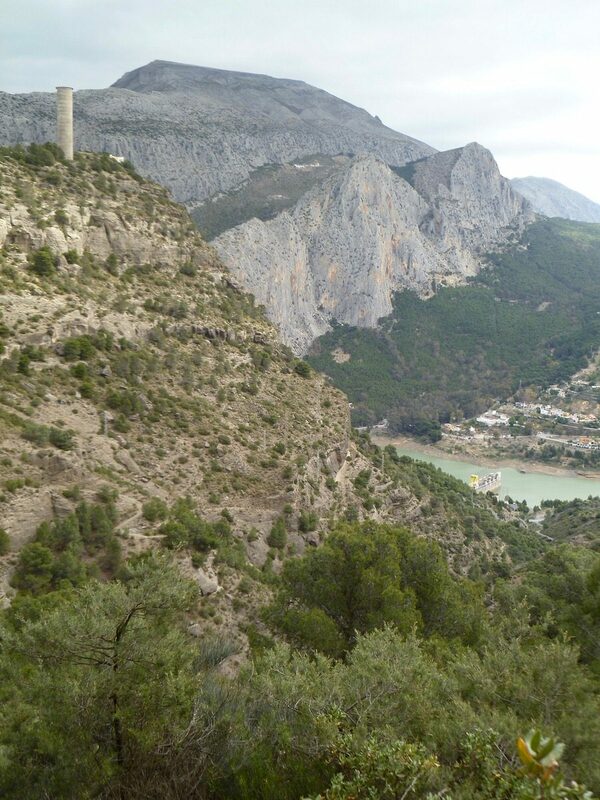 I was very pleased with this trip and can easily recommend it to anyone who wants to try something a bit different from a more typical mountain walk. 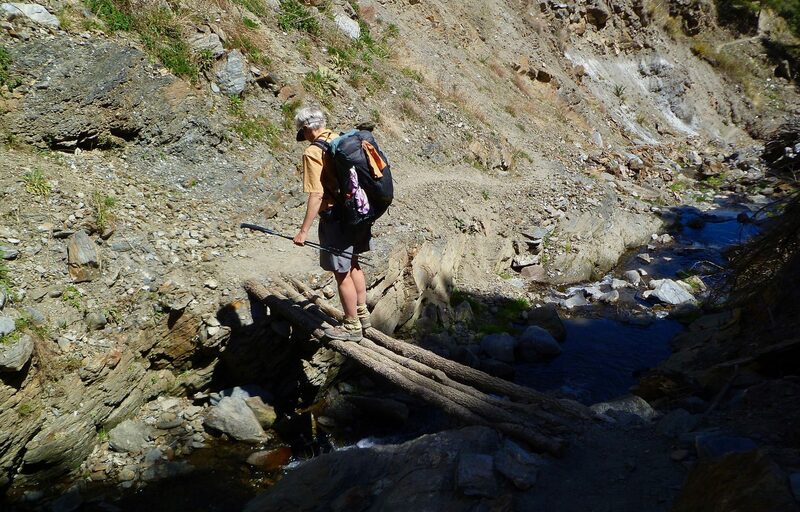 Anyone who is reasonably fit and has basic backpacking skills and equipment should be able to successfully complete this walk. 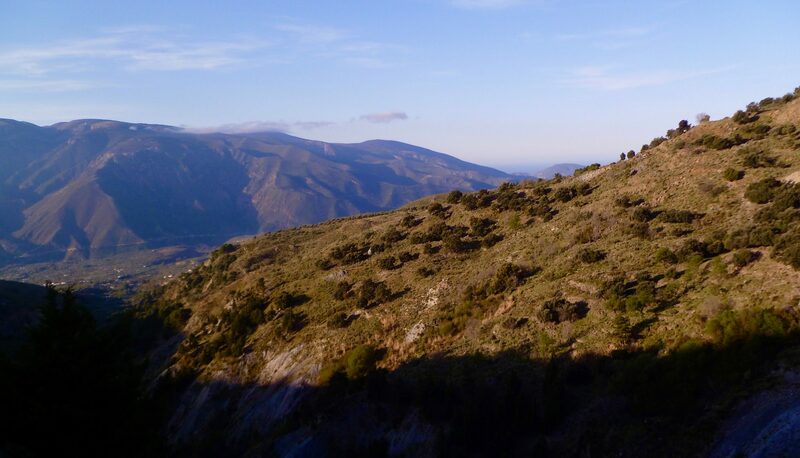 The GR-7 (Gran Recorrido) is a Spanish National Trail extending about 1900 kilometers from Tarifa at the Straits of Gibraltar, the southernmost point in continental Spain, northeast to the border with Andorra in the Pyrenees. 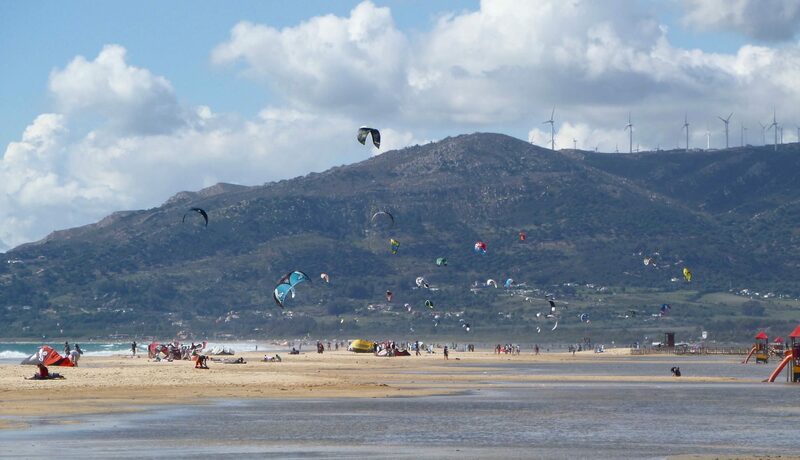 The southern part of the GR-7 is congruent with the trans-European E-4, which also starts in Tarifa. The 8000 km E-4 is completed as far as Budapest, Hungary and when finished will terminate in Greece. 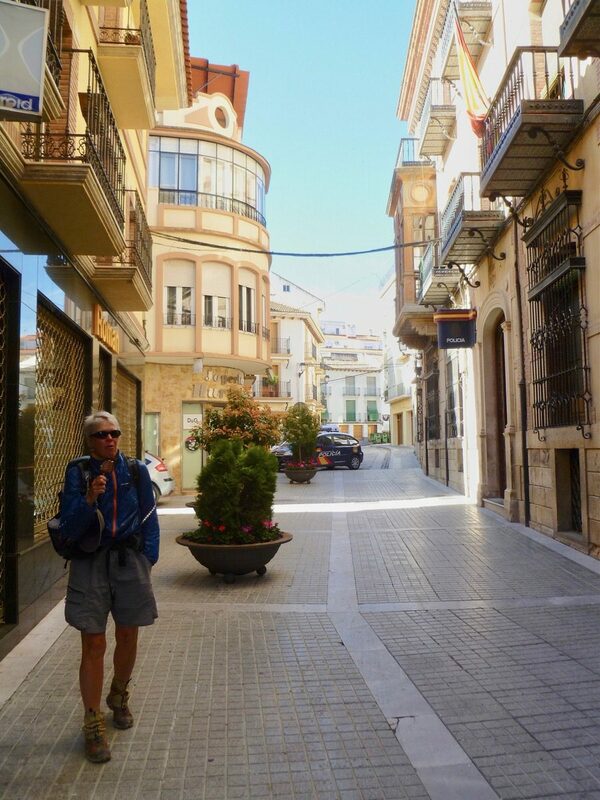 We started our walk at the Tarifa ferry terminal and continued through the Andalucía and Murcia Autonomous Communities and a piece of the València Autonomous Community, finishing at the train station in the town of Elda. 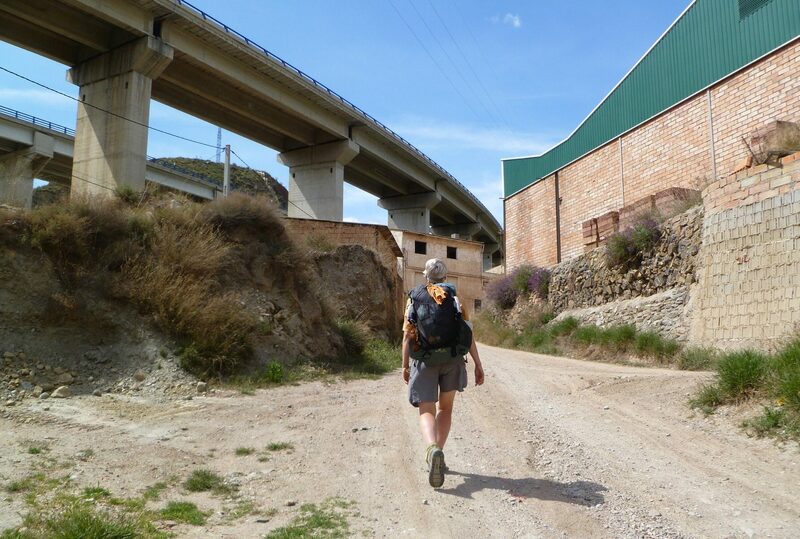 We walked about 1060 kilometers including various off-route diversions. Our total gain was about 23,610 meters (77,460 feet). This modest gain of 118 feet per mile is just one-third of Italy’s strenuous GTA. Most of the GR-7 is on unpaved roads with little to no traffic. There are some stretches of pavement walking, mostly when entering and leaving villages and towns; traffic was usually negligible. 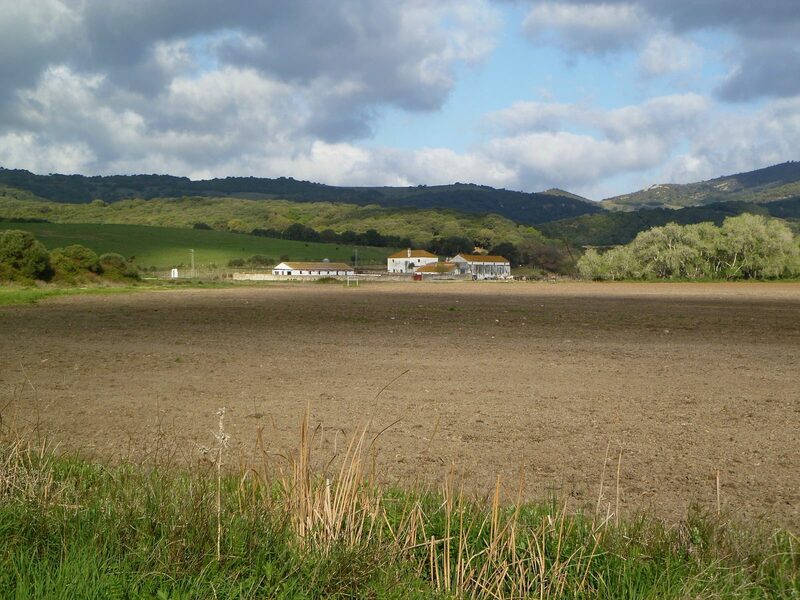 Throughout the region we walked, there is an extensive network of dirt roads, varying in quality from graded and maintained to rough farm tracks, but there is not a marked network of public footpaths like those found in England. Many of the dirt roads were undoubtedly centuries-old traditional footpaths that over the years have been widened to accommodate first horse-drawn carts and later vehicles. 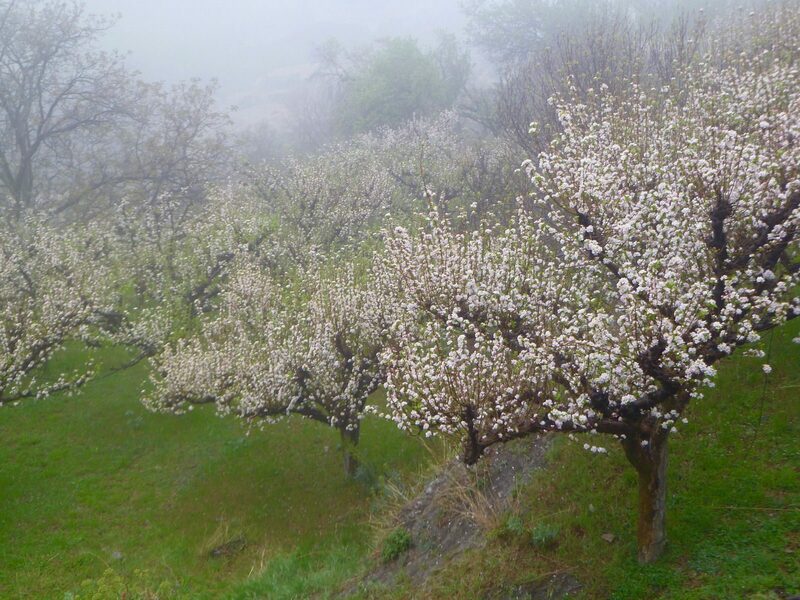 The dirt roads went everywhere: crossing fields, through orchards, by farmhouses, and almost all of them are publicly accessible. Vast numbers of “Coto Privado de Caza” signs are posted, but these only mean that hunting is prohibited. We saw very few “Prohibido el Paso” signs. Nearly all of the rural houses were fenced, but the field and countryside fences appeared to be intended to control animals, not to keep people out. 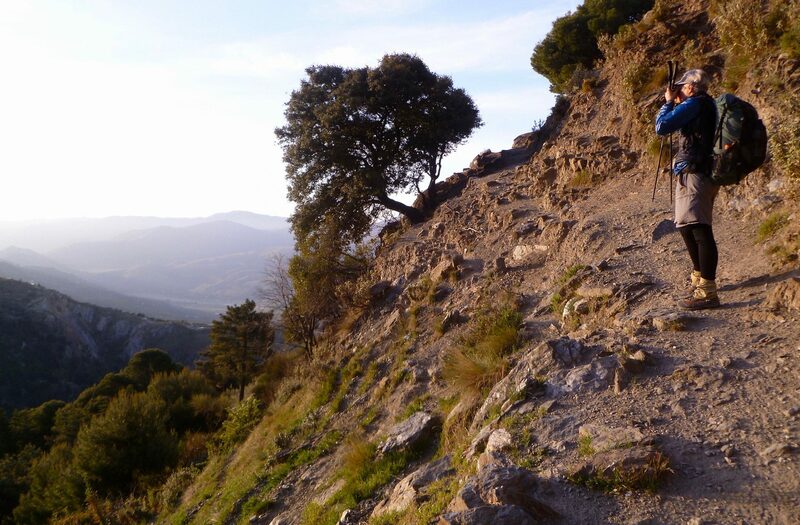 In a few places, most notably in the Sierra Nevada and other mountainous areas, the GR-7 is on traditional footpaths; the tread quality of the footpaths was generally decent. 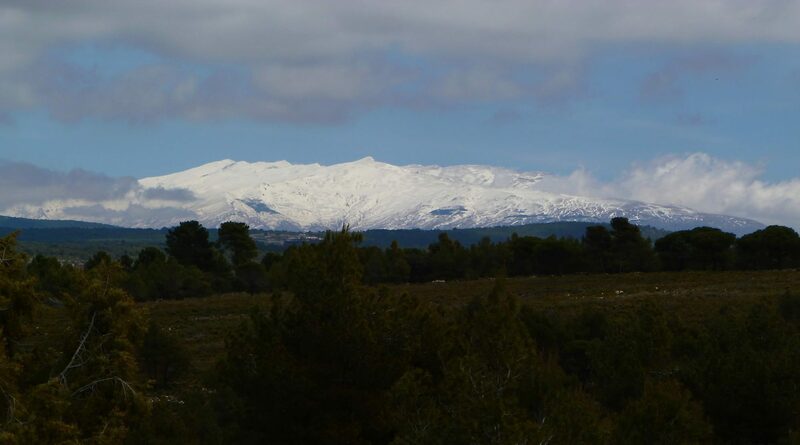 The GR-7 in Andalucía has two official variations around the Sierra Nevada; one skirts the northern perimeter of the mountain range and the other follows the southern perimeter. The two variations have similar walking lengths. 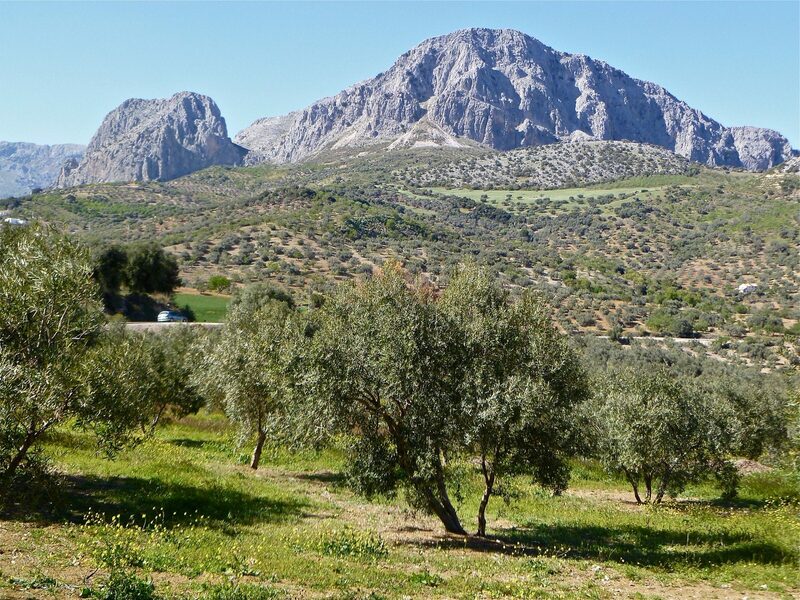 We chose to walk the southern variation because we believe it had fewer olive groves and more walking on mountain trails. 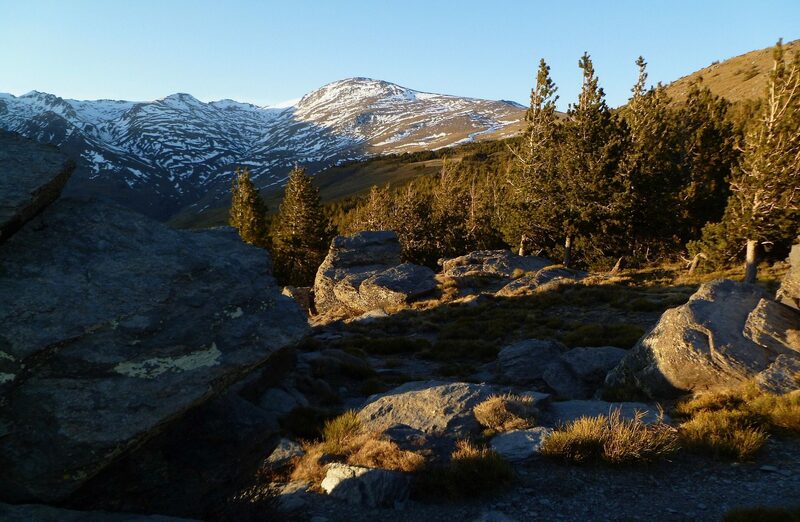 The southern variation also provided us with better access to Mulhacén (3,478 meters, 11,413 feet), the highest peak in continental Spain. 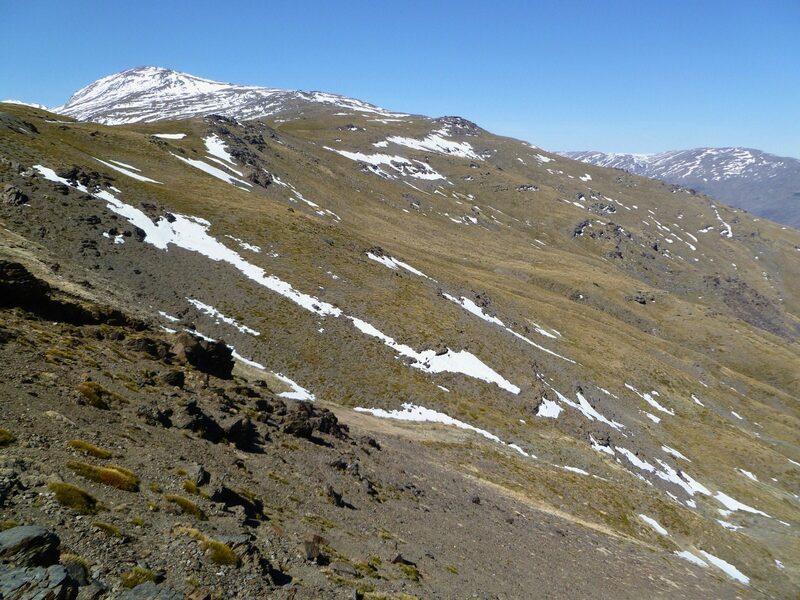 Although not directly on the GR-7, we climbed Mulhacén via a diversion starting in Bubión. 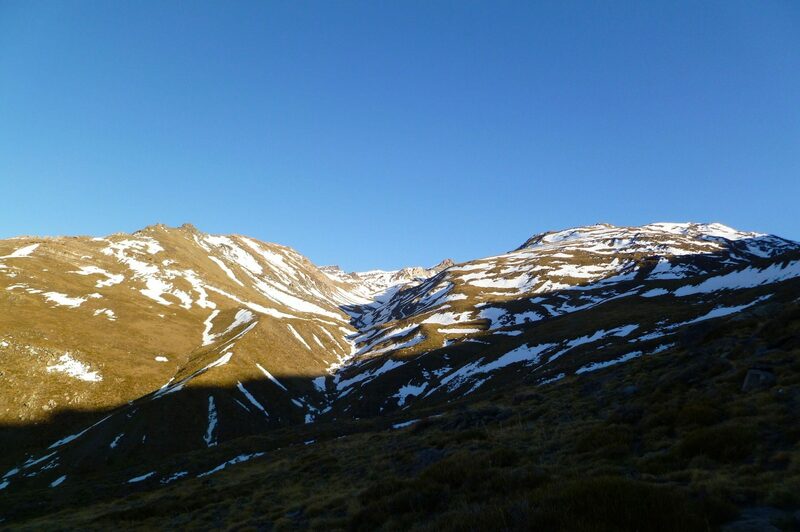 The south slope of Mulhacen itself was still covered with a lot of snow but required no technical skills or tools to climb. 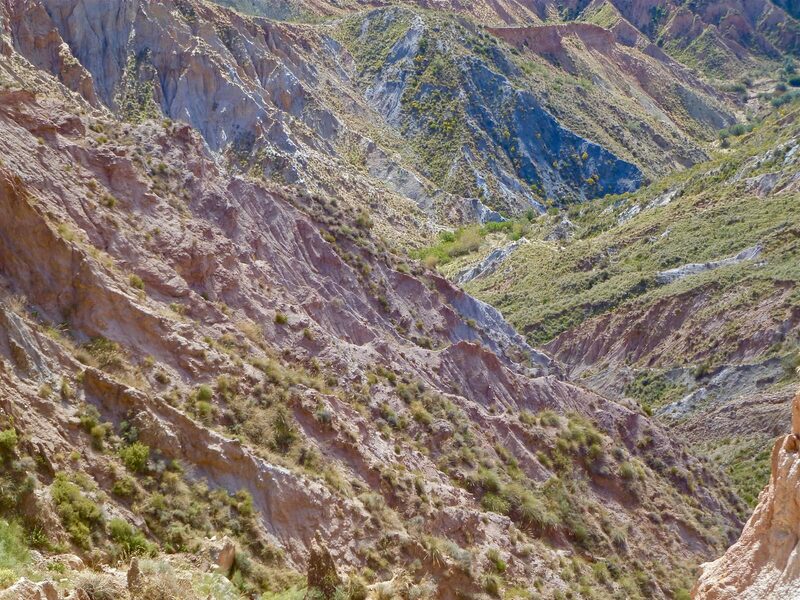 Because the majority of this portion of the GR-7 is on unpaved roads, we thought that it might also be a good region for a dirt-road bike trip. 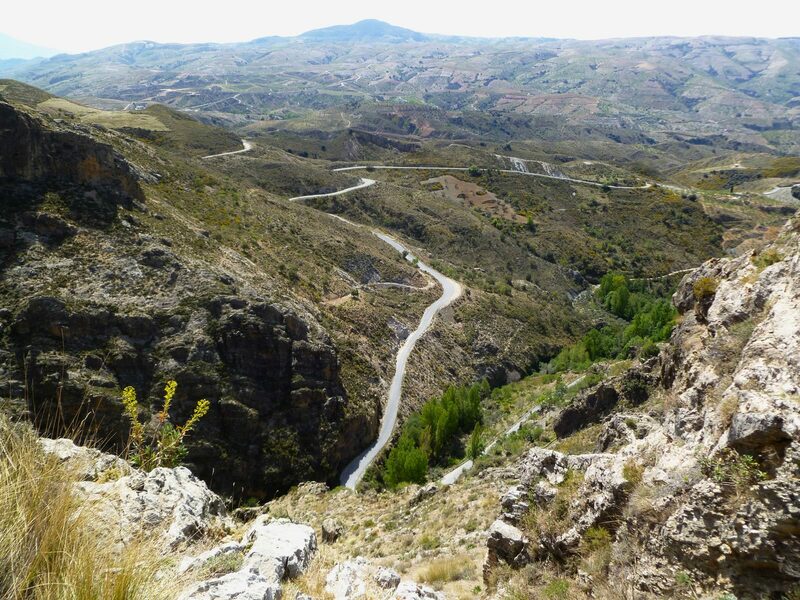 There is a well-documented 2000 km dirt-road bike route in the region called the TransAndalus. We followed the GR-7 using a combination of the guidebook, on-the-ground waymarks, a downloaded GPX track, and paper maps. We printed our own maps using CalTopo.com. Other than in the Sierra Nevada where having more detailed topo maps might have been helpful, the lack of high resolution maps was never an issue. The best commercially available paper maps would be the 1:50,000 Servicio Geográfico del Ejército (Spanish Military Survey) sheets, purchasable at Stanfords or La Tienda Verde. We also carried an iPhone with navigation and reference materials. We used the Gaia GPS app preloaded with tracks, waypoints, satellite imagery, and OpenStreetMap maps. Using the maps and detailed satellite images that we carried on our iPhone, we were able to map out opportunities where, by diverting from the established route, we eliminated significant stretches of pavement walking in favor of dirt roads and footpaths. 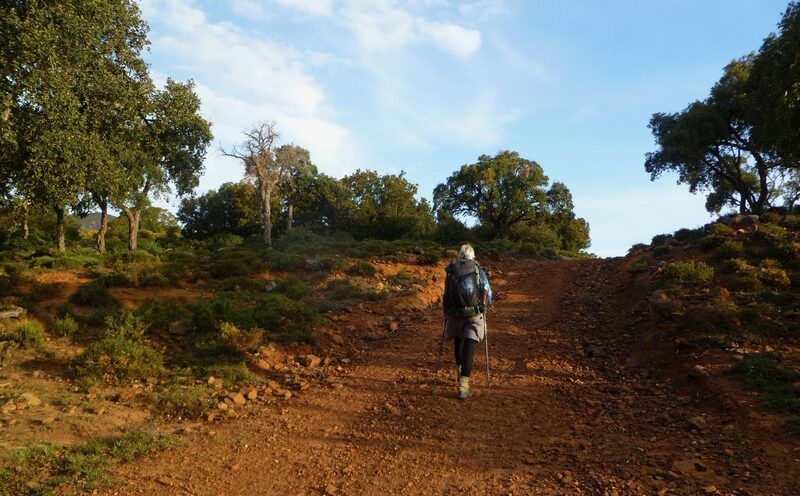 On more than a dozen occasions, we were able to walk variations we believe improved our trip. 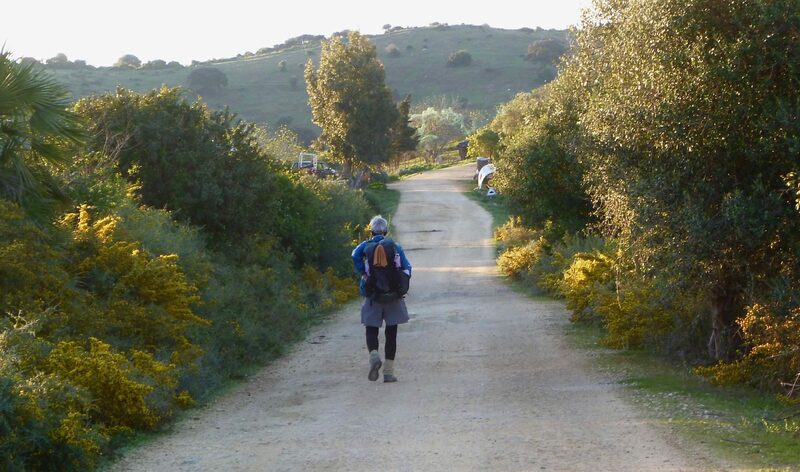 For instance, we by-passed a long stretch of pavement walking along the A-405 leading to Castillo de Castellar by following a slightly longer dirt track west of the established route. 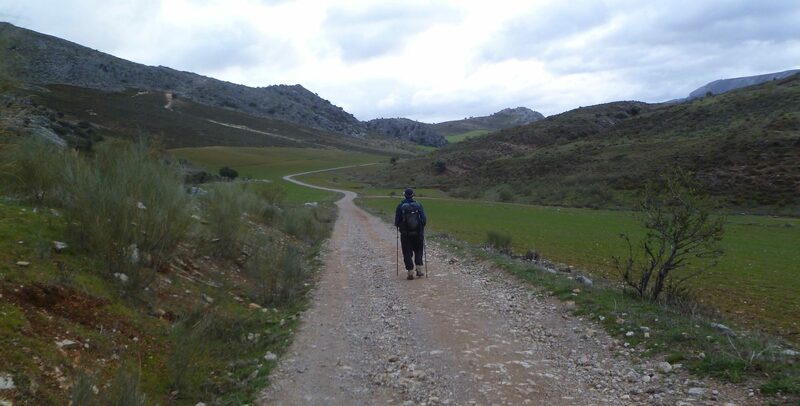 Another variation leading to the town of Cieza kept us mostly off pavement and higher in the mountains. 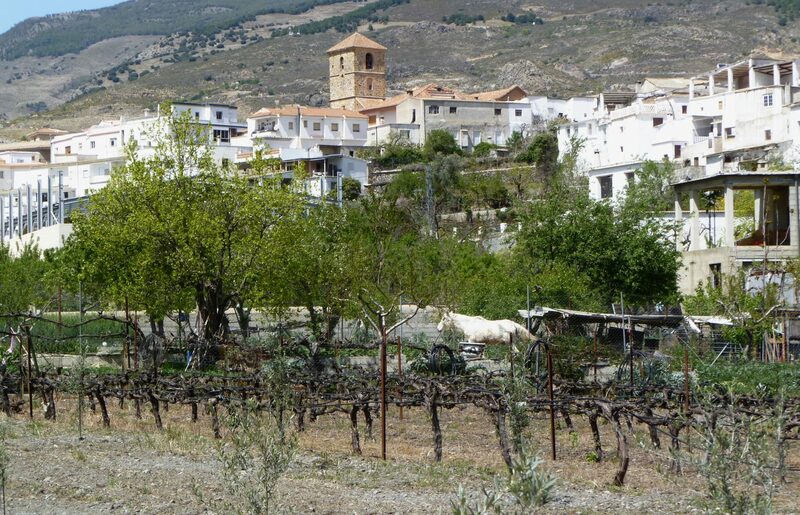 After passing through Nigüelas, we walked high in the Sierra Nevada towards Tello before dropping back down to the GR-7 at Lanjeron. There are certainly opportunities for other off-route improvements. 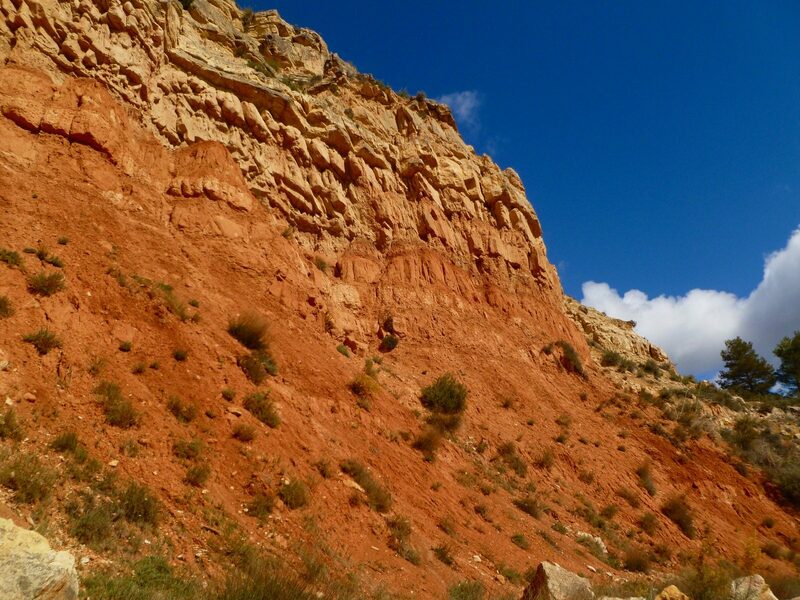 Our CalTopo track shows what we walked and thus includes our variations and does not always follow either the guidebook route or the Rutas y Viajes GR-7 gpx track. 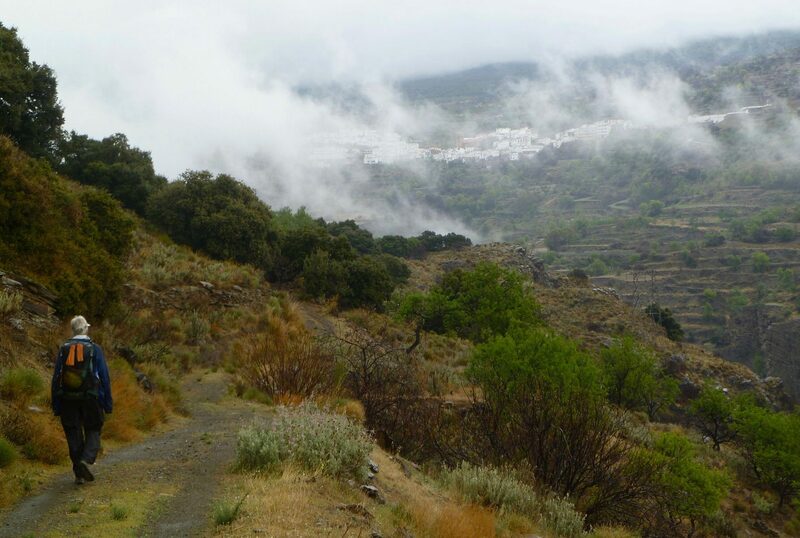 The guidebook route ends at Puebla de Don Fadrique and we walked another 220 kilometers of the GR-7 beyond that point. The various sources of route information we had were occasionally in conflict. The written text in the guidebook did not always match the printed maps in the guidebook. 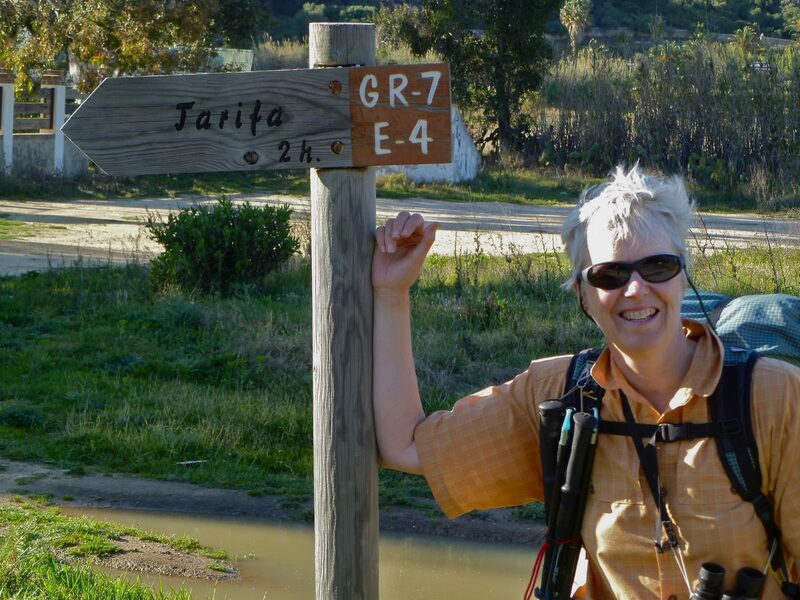 The guidebook text and maps did not always match the waymarks on the ground or the the GPX track we downloaded. The actual conditions on the ground were sometimes different that what the guidebook described as cultural changes constantly occur. 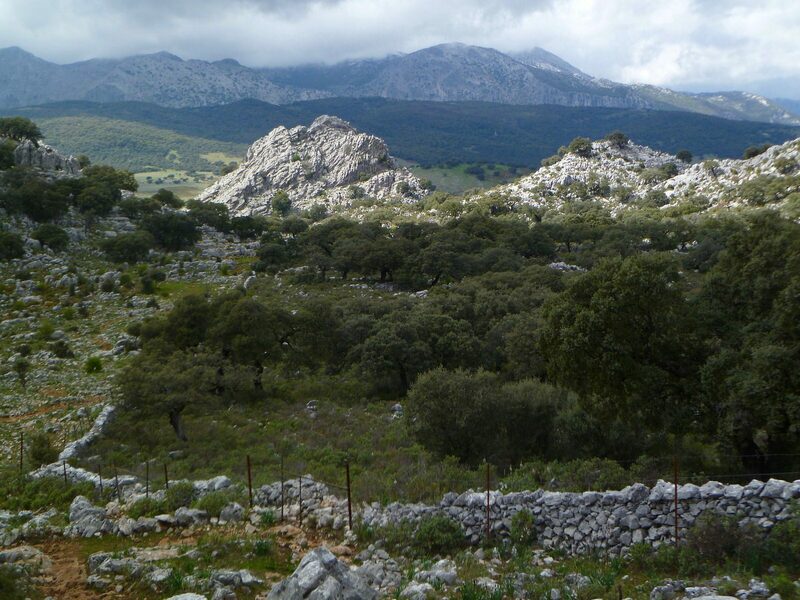 Finally, our own sense of where the best route might be was sometimes different from the guidebook or any of our maps. In other words, the data sources were not always in sync and we had to sometimes choose what we believed to be the optimal route. However, it is not highly complex terrain, and making the “wrong” choice is not likely to cause significant difficulties. Unless you have no sense of navigation at all, it would be difficult to get seriously lost. The GR-7 is waymarked using standard European Grande Randonnée markings. The on-the-ground waymarking varied from quite helpful to significant stretches where signs were non-existent. In places the path had been re-routed with new waymarks, but the old waymarks had not been removed, leading to possible confusion. While it would have been possible to follow the route using the guidebook and waymarkings alone, having a GPS made life a lot easier. 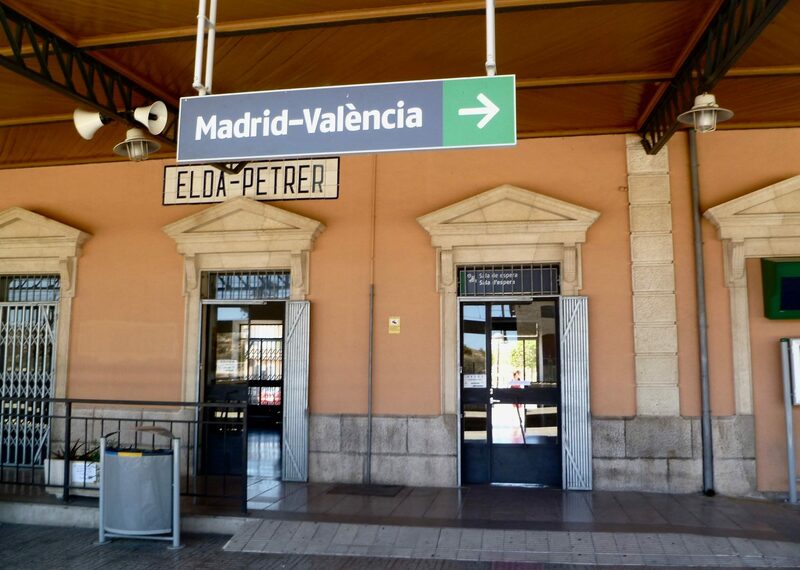 Signage, as is typical in Europe, gives estimated walking times between points, not mileages. 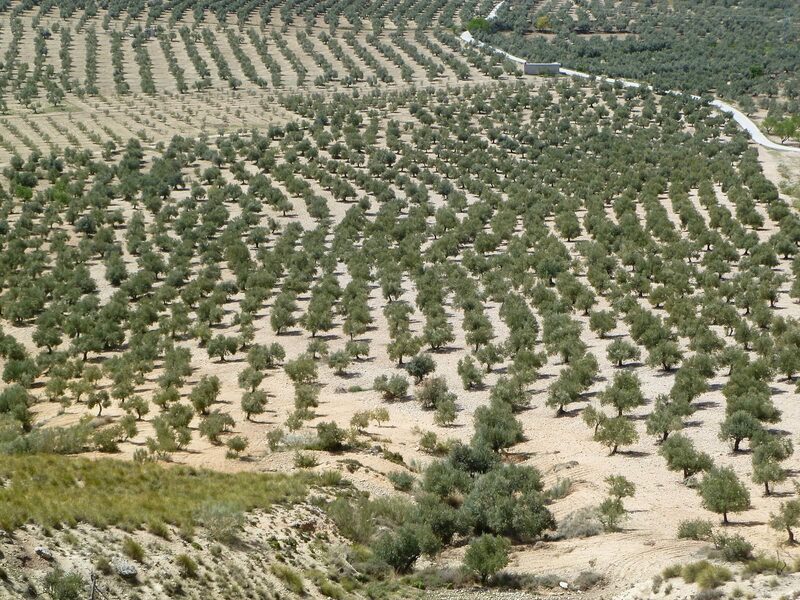 The GR-7 passes through olive and almond orchards, grazing areas, native oak forests, tree plantations, cork-oak woodlands, quite arid and almost badland regions, and many small towns and villages. 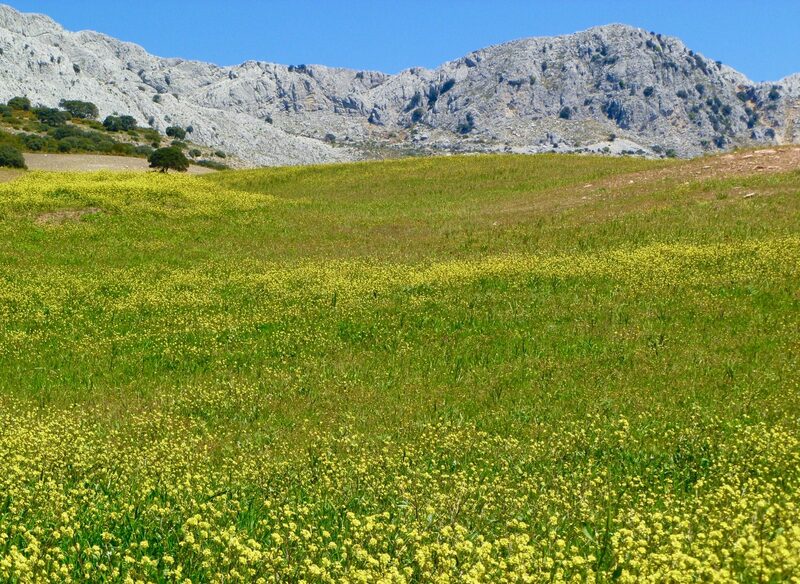 The grazed areas range from overgrazed landscapes to attractive hills where the grazing appears to be done at a sustainable level. 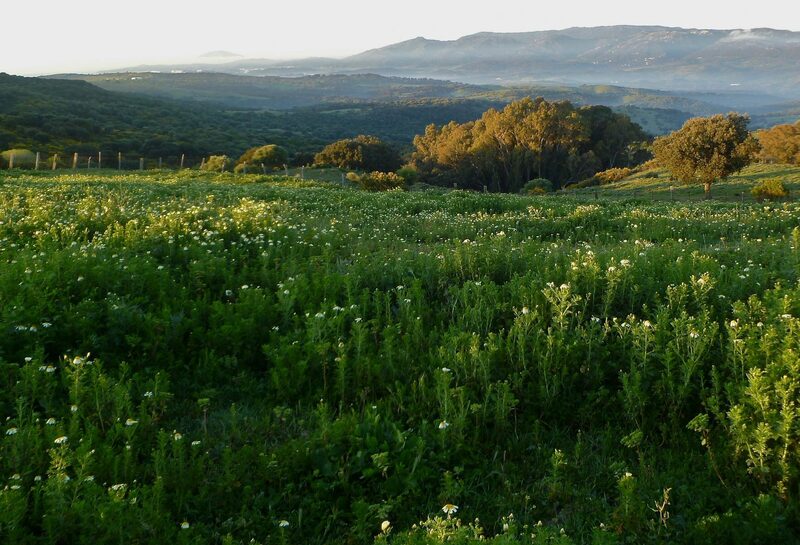 The pleasant Mediterranean landscape with flower-filled fields and chaparral often reminded us of the landscape around our central-California home. 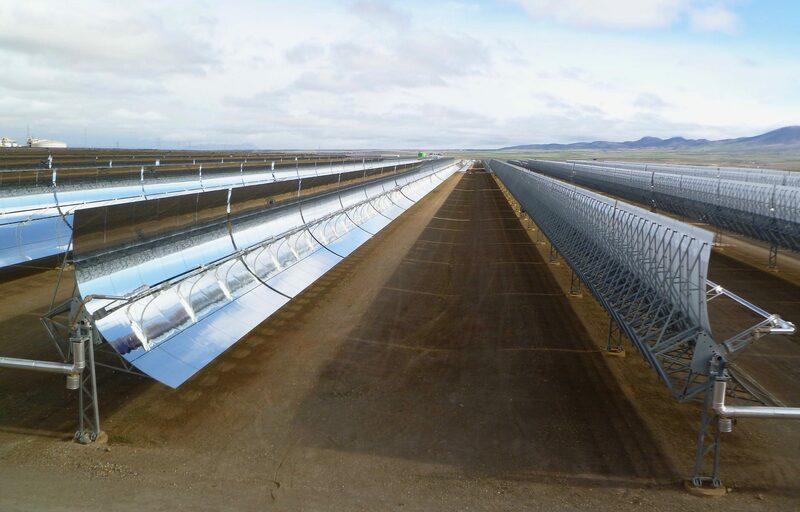 Spain has been investing heavily in carbon-free energy sources, and the GR-7 passes commercial photovoltaic installations, numerous wind turbine farms and skirts the perimeter of Andasol, Europe’s first parabolic trough solar plant and one of the largest solar power stations in the world. 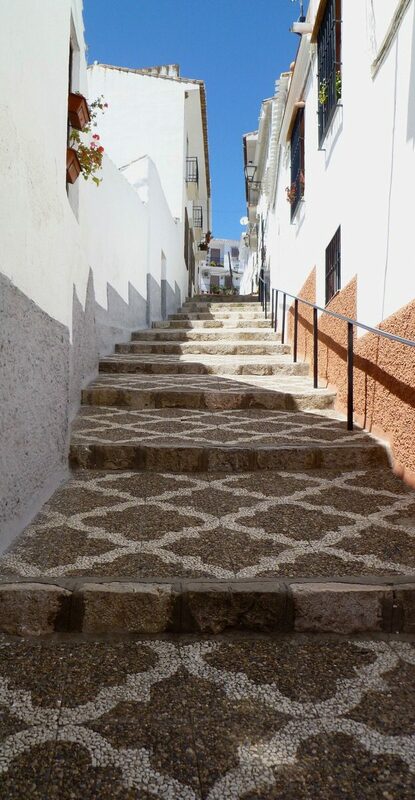 The small towns in the first half of the walk were heavily influenced by their Moorish past with compact layouts, narrow winding streets, lots of tile work, and white-painted buildings. 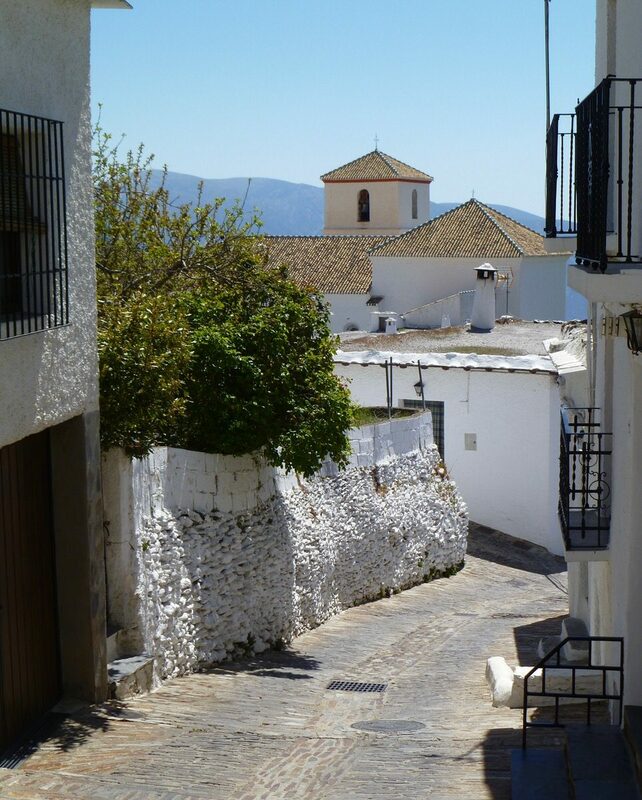 They are sometimes referred to as pueblos blancos and the words fit. 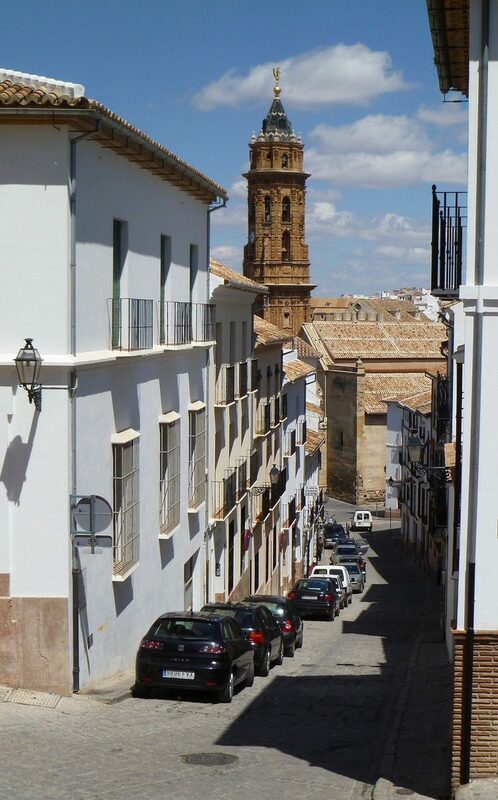 In the later portions of the walk, the villages opened up a bit and tended to have both natural stone and colorfully painted structures and have wider, straighter streets. 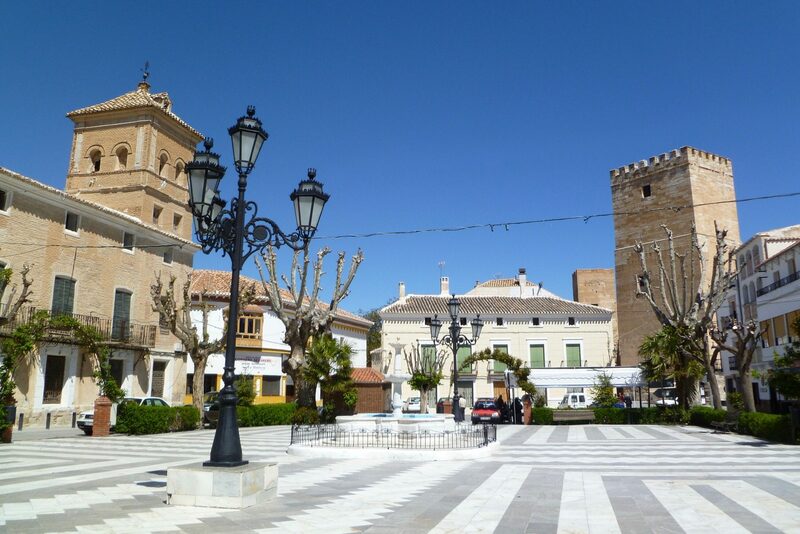 Most towns had one or more large open plazas, often with churches, fountains, and a collection of shops. The churches are almost exclusively Catholic, rather forbidding in appearance and almost always locked up tight. Street signs are small to non-existent, so finding markets, bakeries, and cafes required paying attention or asking passers-by. 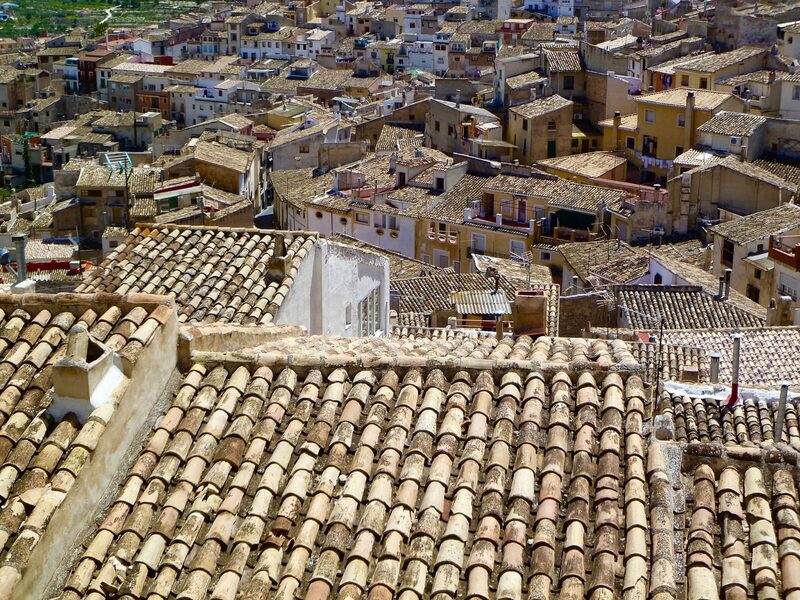 There are centuries-old buildings, some dating back to Roman times, which are still being used as residences and shops. 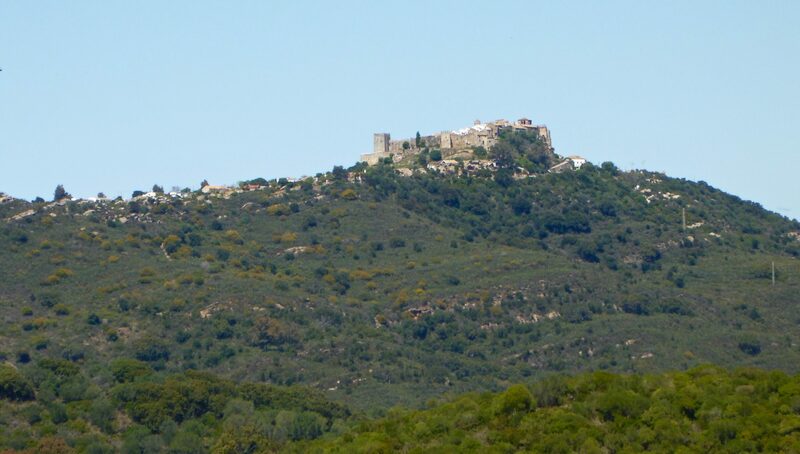 There are also many castles, some in ruins and others in reasonable repair, which added a dramatic element to the route. 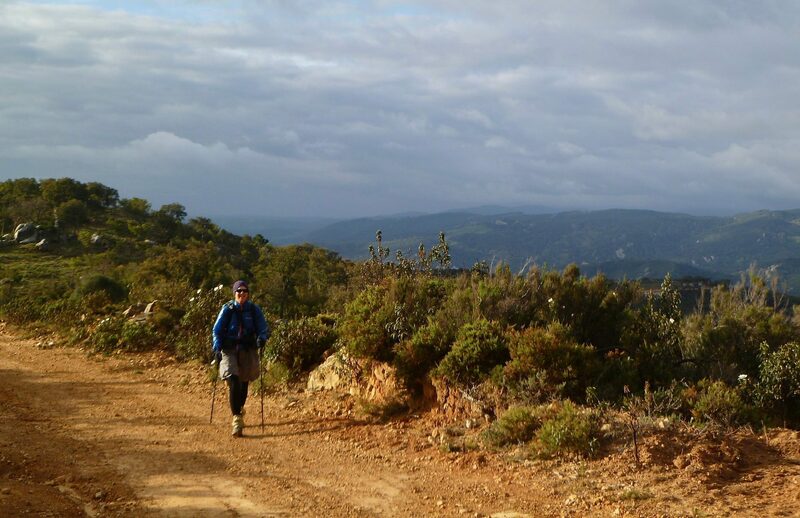 In 2010 we through-hiked the HRP between the Atlantic and Mediterranean along the French/Spanish Border. Compared to the HRP, the GR-7 is much easier walking, more relaxed, has many more towns, but is not nearly as scenic. There was access to shops nearly every day on the GR-7 but not on the HRP. 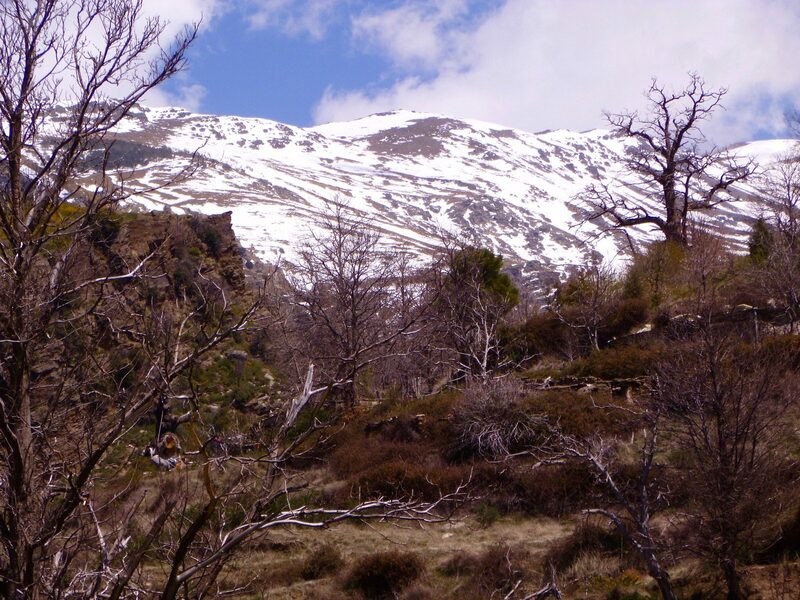 The walking on the HRP is primarily on footpaths and is often steep and rocky, so the trip is more physically demanding than the GR-7. 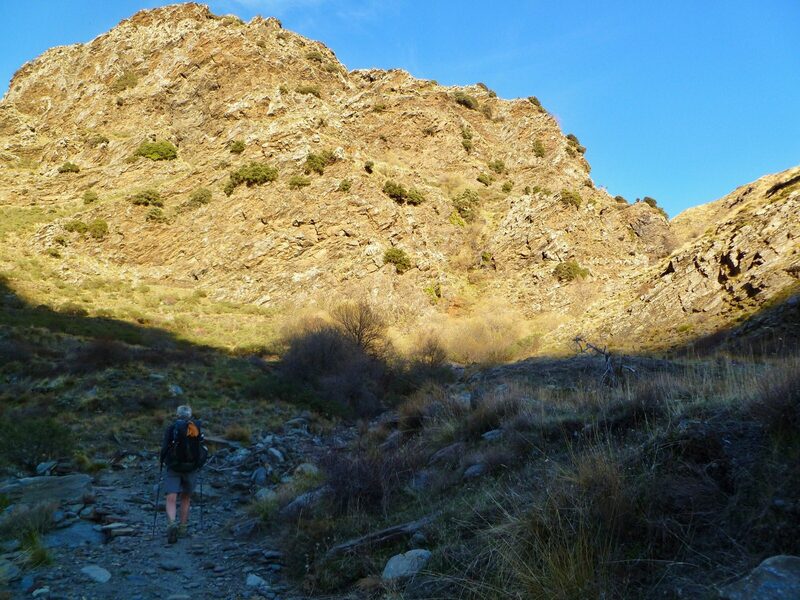 If you have an opportunity to walk only one of these routes and you have the skills to do it, we think the HRP is a more rewarding trip, although the GR-7 was a completely satisfying experience as well. This walk is not wilderness backpacking. Outside of northern Scandinavia, there is essentially no wilderness in Western Europe as we know it in the US. 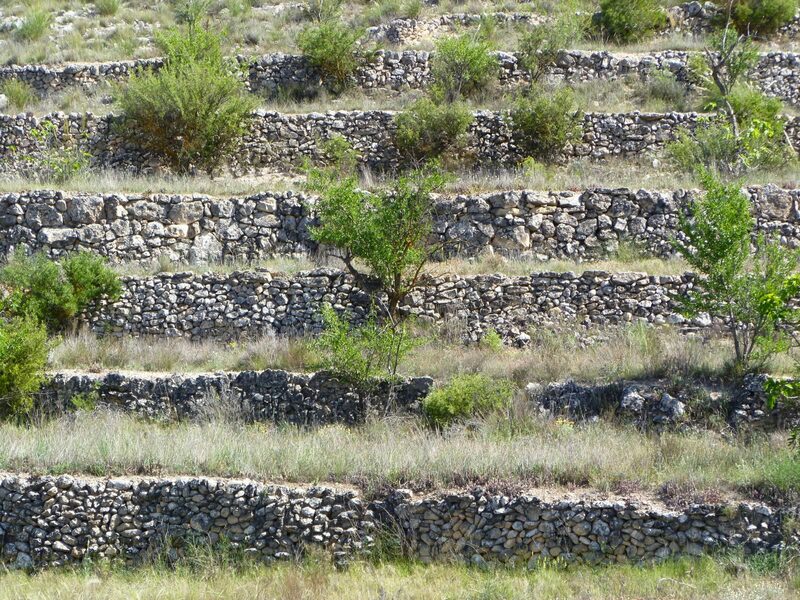 The GR-7 passes through areas that have been settled for millennia and have been affected and modified by human activities including extensive grazing, agricultural terracing, deforestation and so forth. 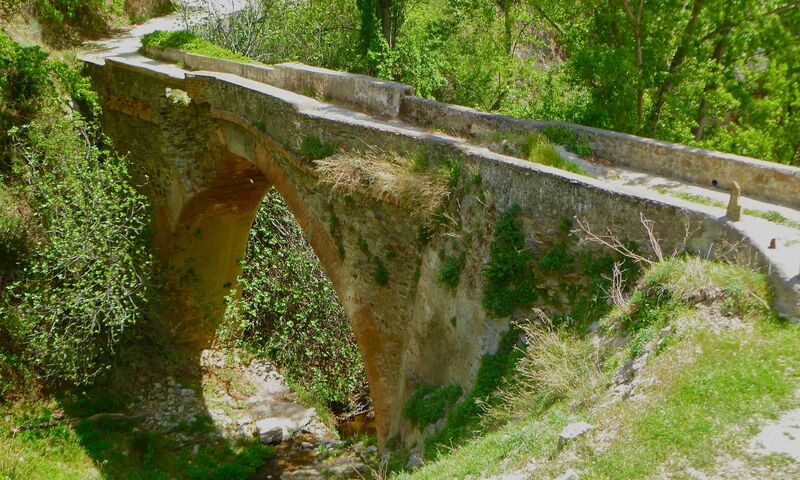 It passes through towns that might be 2000 years old with buildings that have been in continuous use for a thousand years or more. Old wells have produced good water for tens of generations. 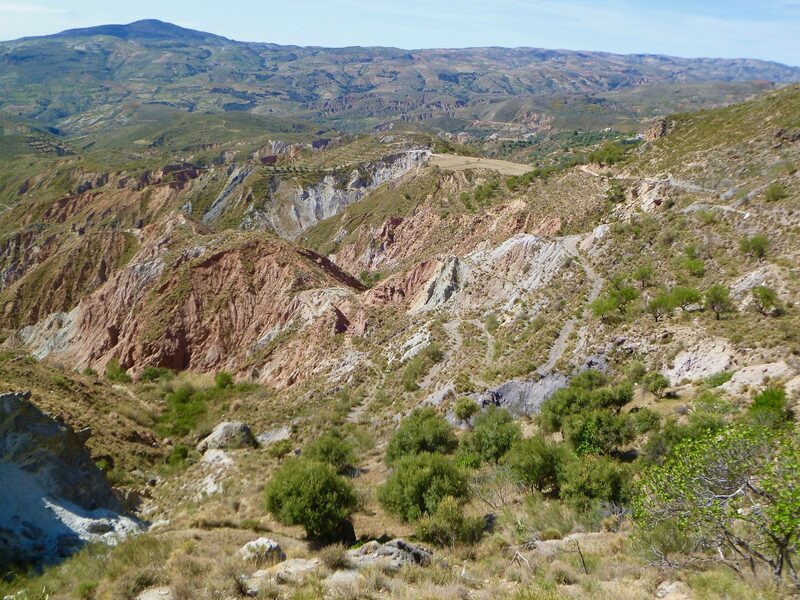 The GR-7 passes through the village of Orce where a nearby archaeological site contains hominid stone tools dated to over a million years ago and are possibly the oldest found in Europe. Chain stores and restaurants are only found in the larger towns and shops in the small towns are still locally owned and operated. There is not much sprawl once you leave the immediate coast. Public transport is widespread and works. 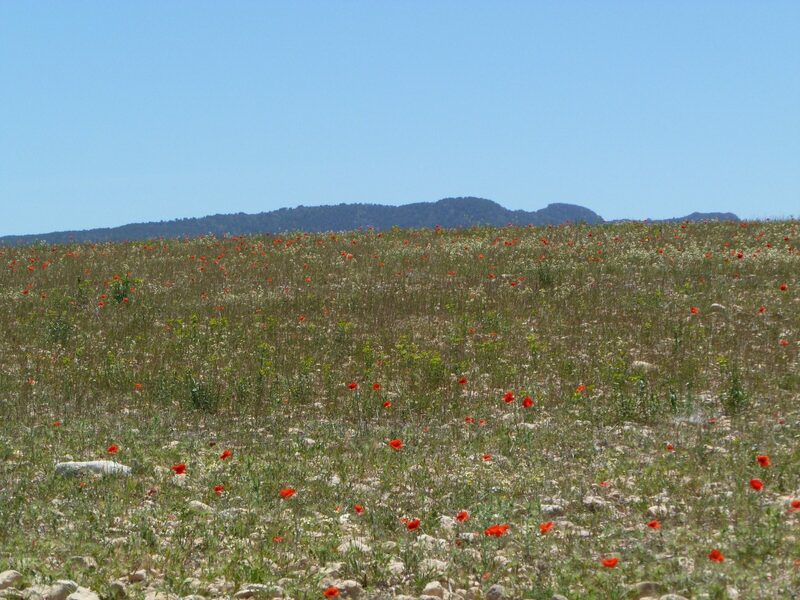 We find that hiking through settled landscapes like this is very different from and a great complement to the wilderness hiking we do at home. 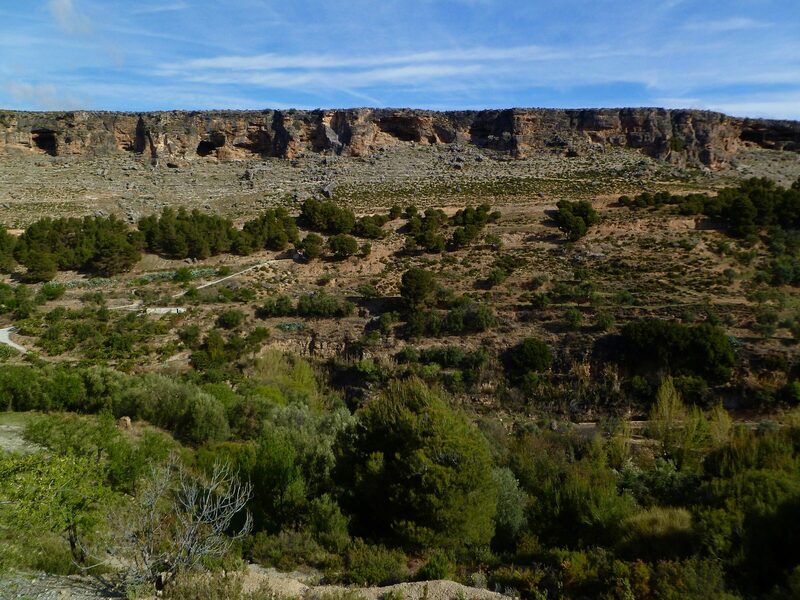 One of the things that is refreshingly different in Spain compared to the US is that privately-owned lands are usually open to anyone who wants to walk through them. 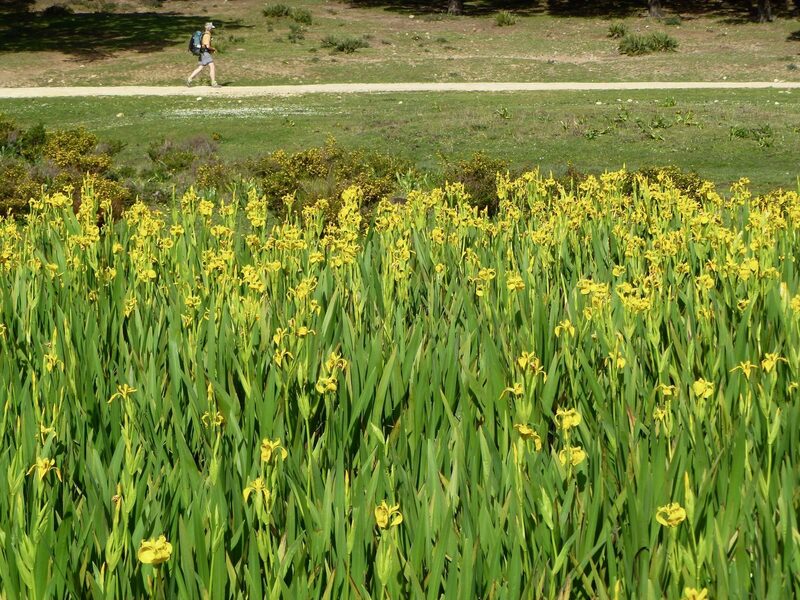 This means that while there are no wilderness areas, there are very large landscapes available to the walker to explore. In the US, private lands are rarely useable by the public. We camped on 31 of the 34 nights we spent on the GR-7. 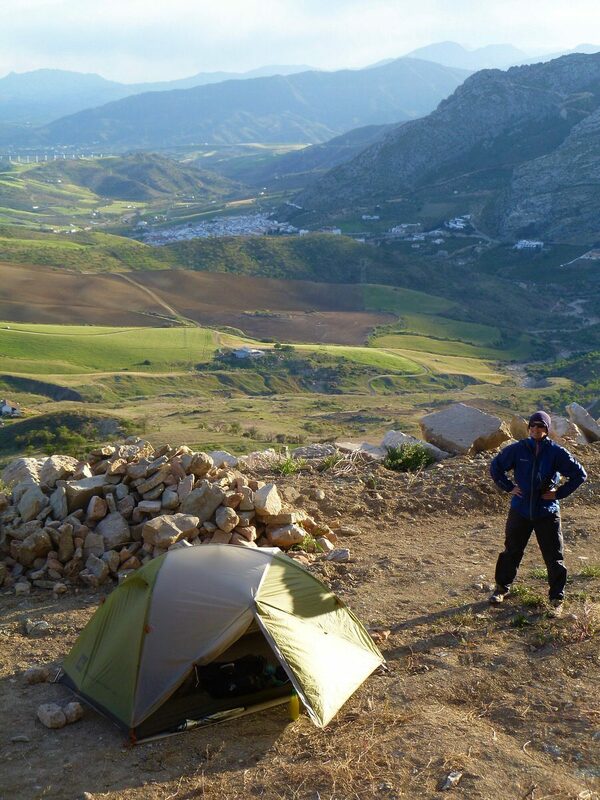 We never camped in an official campsite, but rather wild-camped whenever it was time and a suitable site was available. Although we try to be discrete, we were often in very visible locations; we spent one night on a paved scenic overlook just 100 meters from the village at Castillo de Castellar, another on a public plaza behind the administration building in Bérchules, and yet another on the patio of an unused farmhouse. 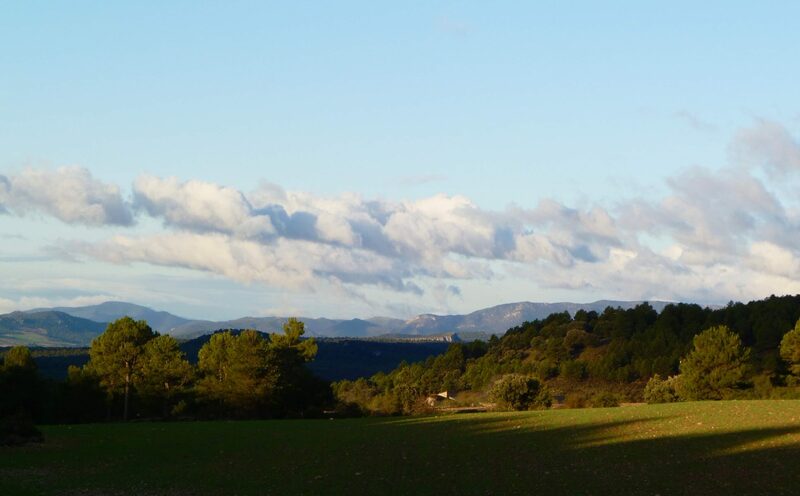 We camped in olive and almond groves and in a barn. We asked permission on the few occasions when somebody was around and were always granted leave to set up our tent; no one ever bothered us. 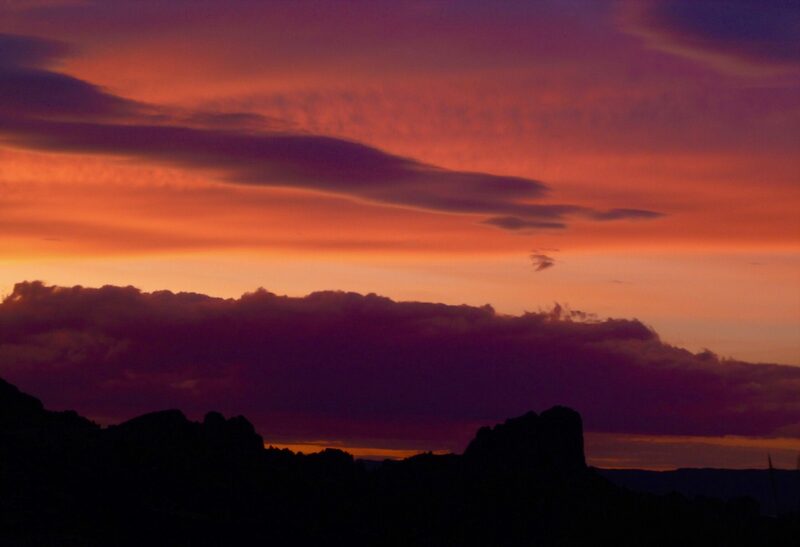 We were quiet and did not build fires, and usually did not set up until dusk and were packed up again before sunrise. 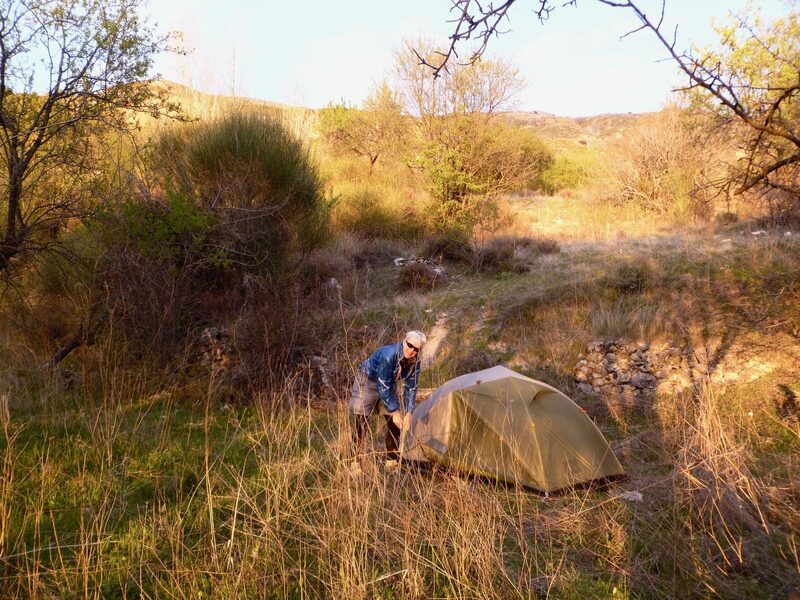 Campsites sometimes took some time to find due to the terrain: too steep, too rocky, too much underbrush and so forth. However, we were always able to locate a place that was at least better than adequate and many sites were quite memorable. 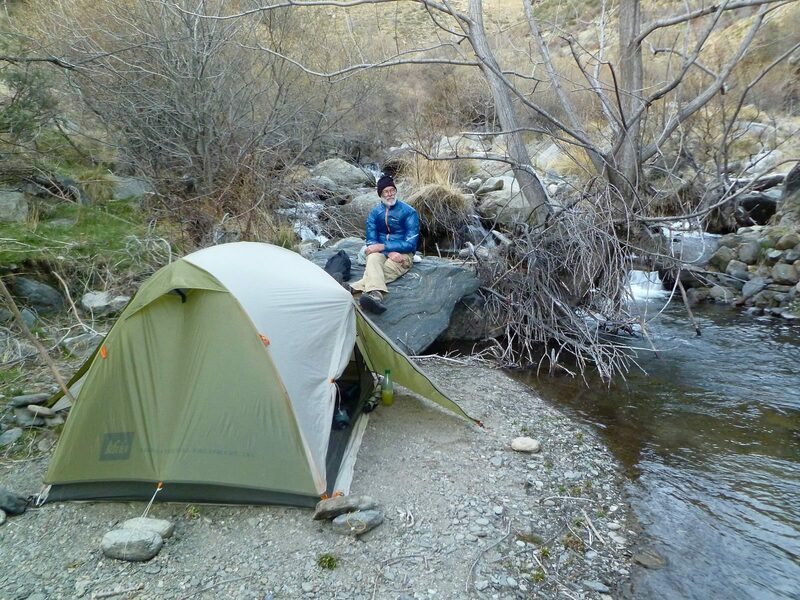 We saw few official campsites, either public or private. Many of the towns had commercial lodging such as pensions, hotels, hostels, and B&B equivalents for those who prefer indoor accommodations. 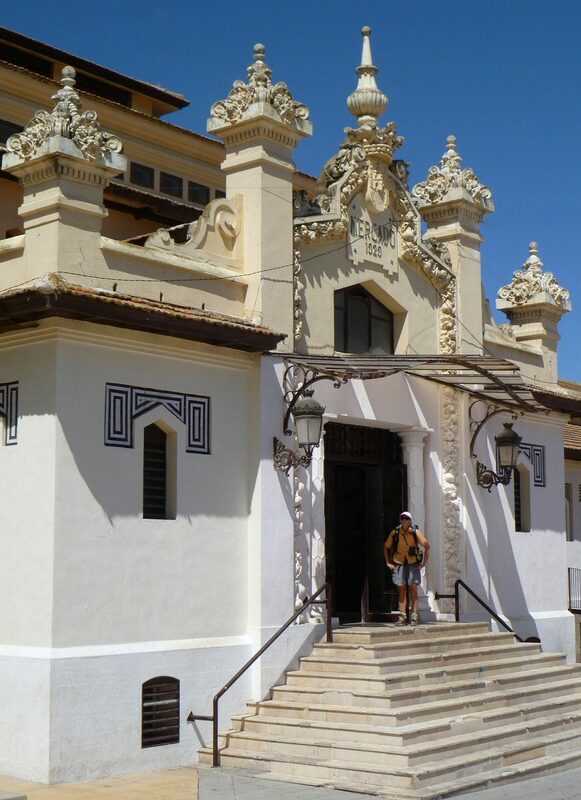 Althoug dated, the guidebook has helpful information on what lodging is available. A major downside of doing this trip without camping is that you will be forced to plan your days around the availability of lodging and there are several sections with extremely long distances between possible places to stay, so some camping is functionally mandatory unless occasional vehicular transport is arranged. The route passes shops every day or two. With a bit of planning buying food was not a significant problem. 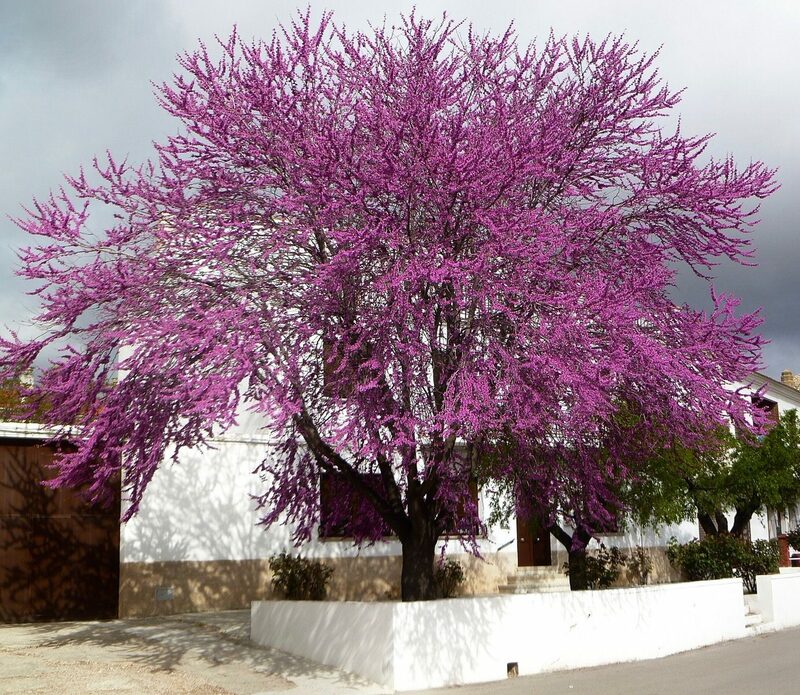 However, essentially all grocery stores in rural Spain are closed daily from 2 PM until 5 PM, Saturday afternoon, and all day Sunday. Also, local fiestas of various kinds are common in Spain and every store in town closes on fiesta days. The stores themselves, however small, were usually extremely well stocked with a wide variety of foods useful to walkers, much more so than small town stores in England and the US. Bakeries, pastelería for pastries and panadería for bread, had much better offerings than those in England, but were not quite as fabulous as the patisseries in France. 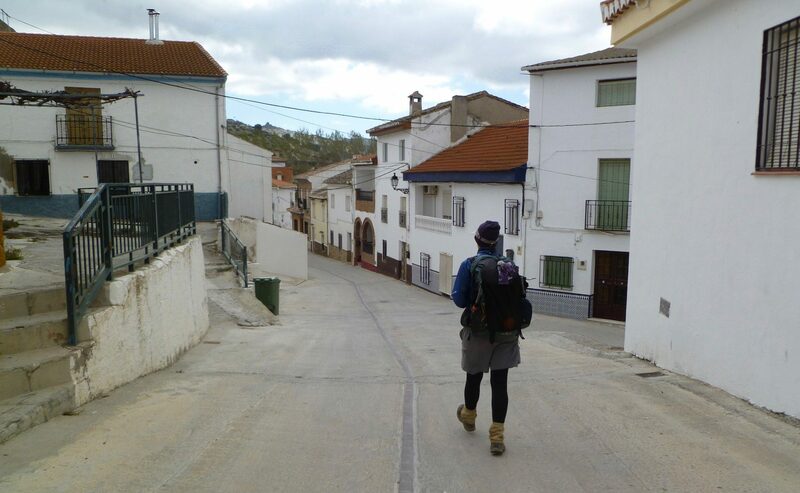 Since we don’t carry a stove, we subsisted on our normal walking no-cook diet of bread, locally produced cheese, jamón serrano, yogurt, crackers, nuts, fresh fruit and vegetables, sausage, tuna, packaged pastries and cookies, juices, wine, and chocolate. We frequently ate in the small town cafes. The quality of the food in these places, however modest they looked, was generally quite good and we had many very tasty meals. Since our Spanish is rudimentary and menus were usually non-existent, ordering was often a puzzle and often we simply asked the proprietor to feed us. We were never disappointed with this approach. On two occasions, someone had to phone the cook at home to come to make us a meal. The cafes were almost all very friendly and kind to us. Overall, we spent approximately $20 US per person per day on food. Finding water was easy. 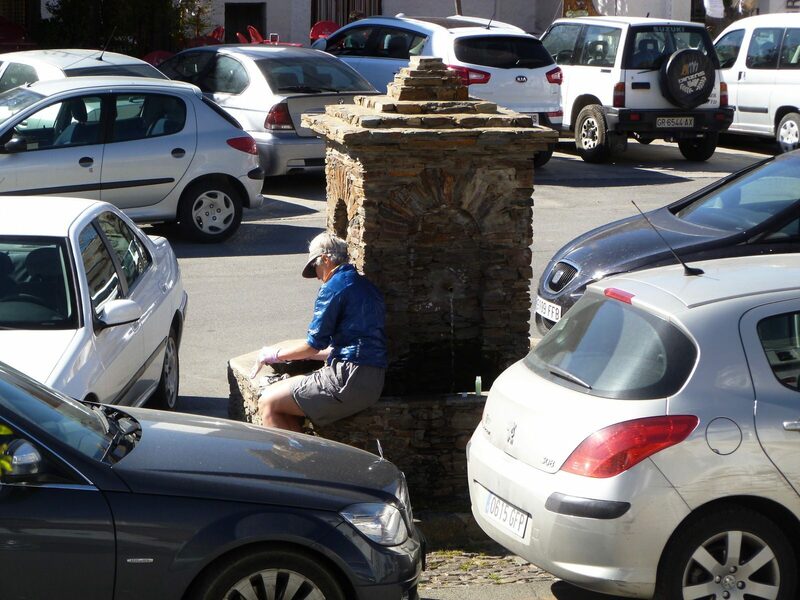 Towns and villages have public water sources called fonts, usually located in the square next to the church. The fonts are sometimes very old and sometimes very elaborately decorated. Rarely, these would be posted as non-potable, but the vast majority had good water. 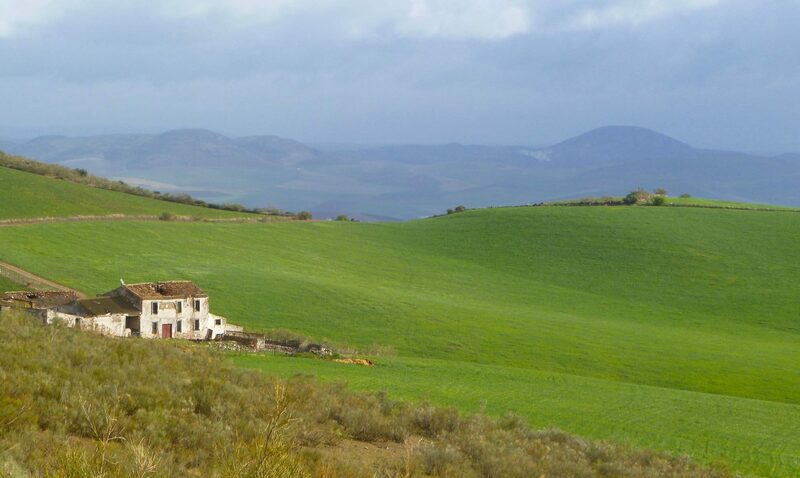 Farmhouses were also a source of water and there are many on the route. 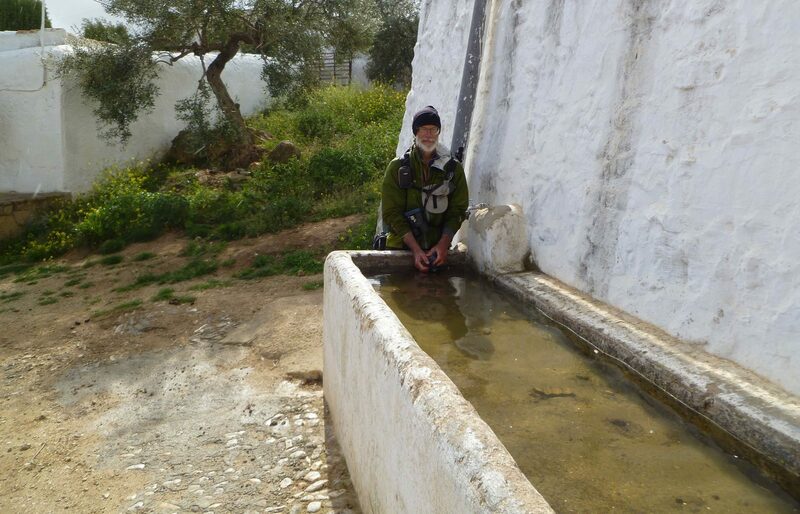 We never treated water, and we purchased water only in Venta Romana, where the well water is not very palatable. We met very few English speakers in the rural areas and small towns. Amy speaks enough Spanish to take care of trip logistics. The regional dialects are very different from the Latin American Spanish we are used to in California. People were enthusiastically helpful and we did fine stumbling along with her limited language skills. 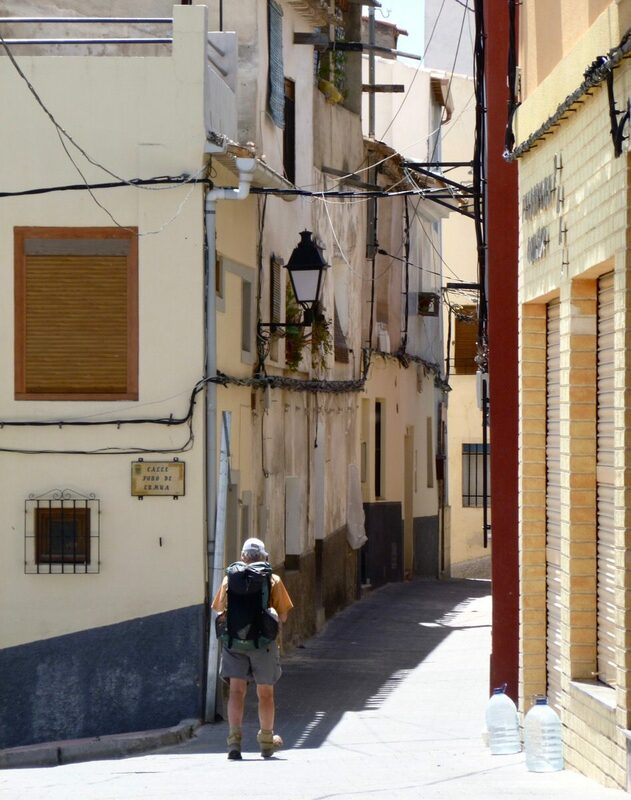 Being comparatively warm, sunny, and inexpensive, Southern Spain is a popular destination for northern Europeans, and many of the towns and villages on the route have significant ex-pat populations of Britons, Germans, Dutch, and other northern Europeans. The trail was not crowded. 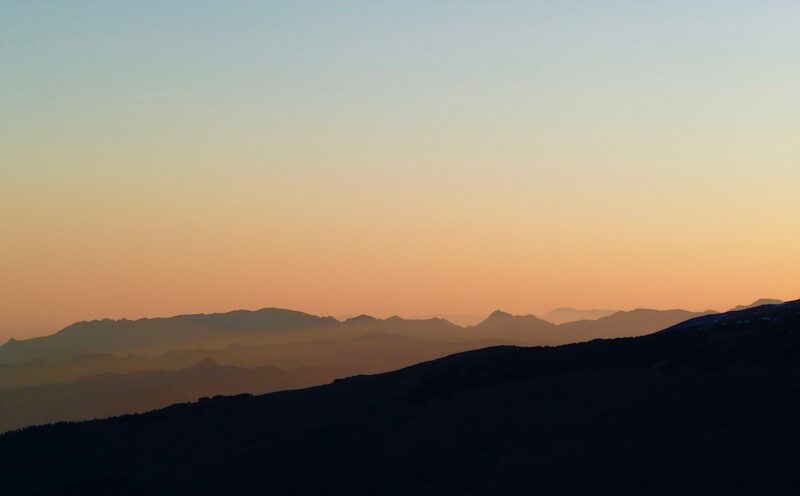 We met one Spanish, one French, and one Dutch couple each doing a week or so on the GR-7, but no other backpackers. 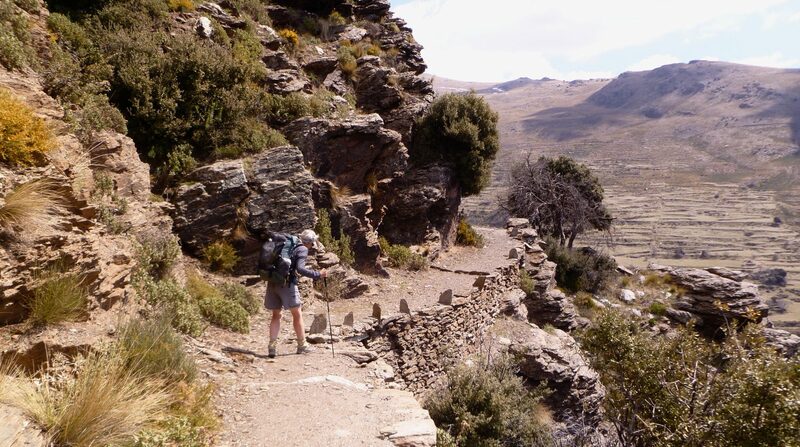 In the Sierra Nevada, we encountered numerous day-hikers, primarily British. We saw quite a few groups of mountain bikers and numerous lycra-clad road bikers, usually on weekends or during a holiday week. ANear Ventas de Zafarraya we walked along and chatted with a large group of Spanish children heading a couple of kilometers to their school. 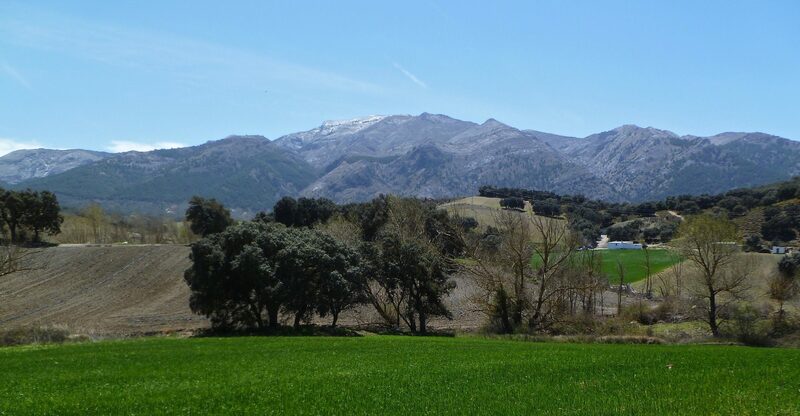 Although mid-spring in southern Spain is normally warm and dry, we experienced unexpectedly cool conditions, especially for the first couple of weeks. Skies were frequently overcast, winds were blustery, and we had intermittent, but very light rain. Locals often commented on the abnormally windy and cool weather. 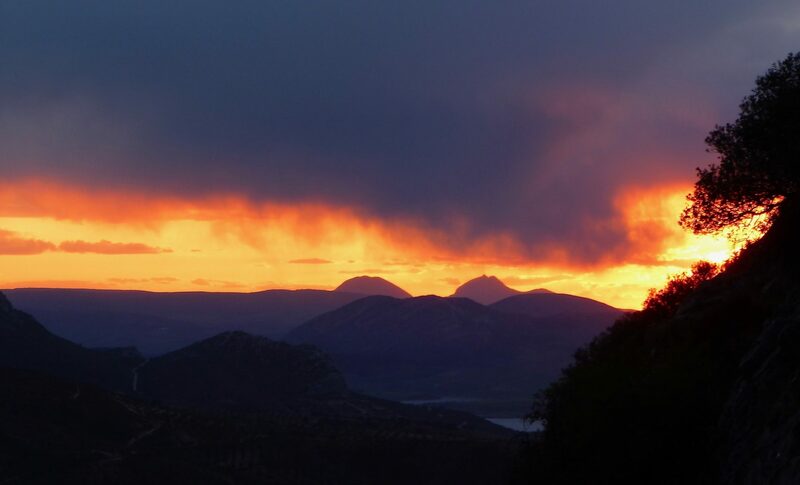 We had good to excellent weather during the middle portion of the trip, but experienced a storm with minor snow and hail while crossing the eastern Sierra Nevada and another storm in the Sierra de Baza mountains. The final week and a half was generally good, but the last few days were too warm for Amy’s comfort. Expect conditions to be very hot during the summer. John Hayes wrote a terrific description of GR-7 dogs in his E-4 blog, and it matched our experiences. Every rural house had at least one, and often up to a dozen, dogs. The savage dogs were always fenced or chained, and the loose dogs were consistently placid and lazy. We’ve never had trip with a larger quantity of barking savage dogs, but we had no bad encounters. The dogs were less problematic than any of our walks in the UK, where pet dogs (“he’s never done that before”) were occasionally quite aggressive. We had no real problems with annoying insects during our walk. 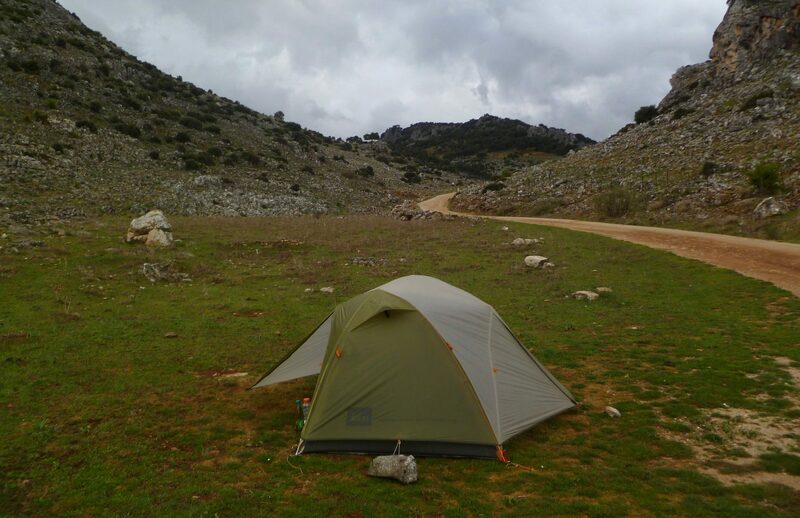 We had a few mosquitoes around the tent on a couple of nights, but they were not noticeable during the day. 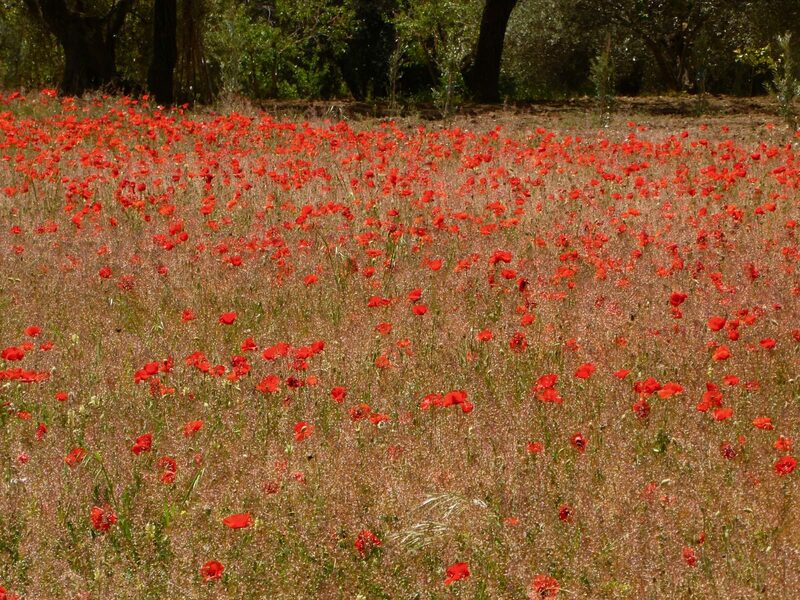 We are not familiar with the insect situation at other times of the year but given that most the terrain is dry, annoying insects may be uncommon. 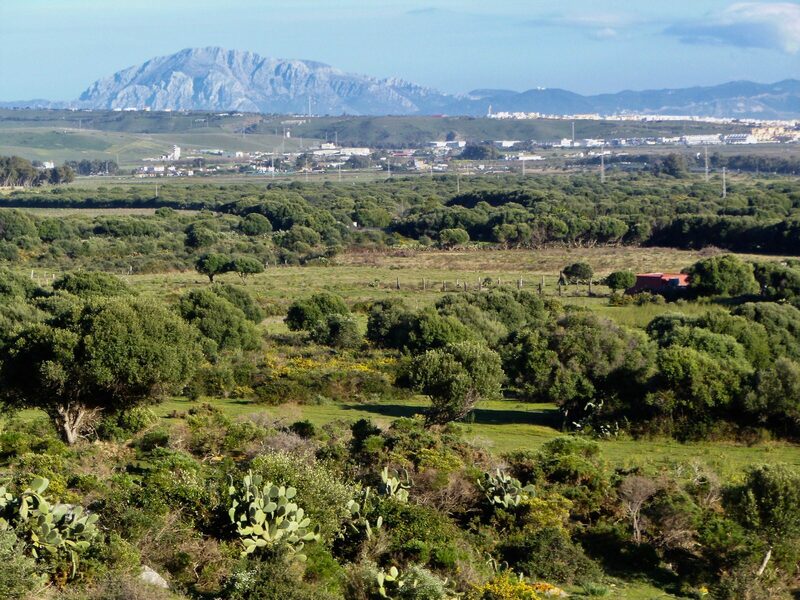 We are birders and spend time during our walks enjoying the local avifauna. On this trip we observed 134 species of birds. 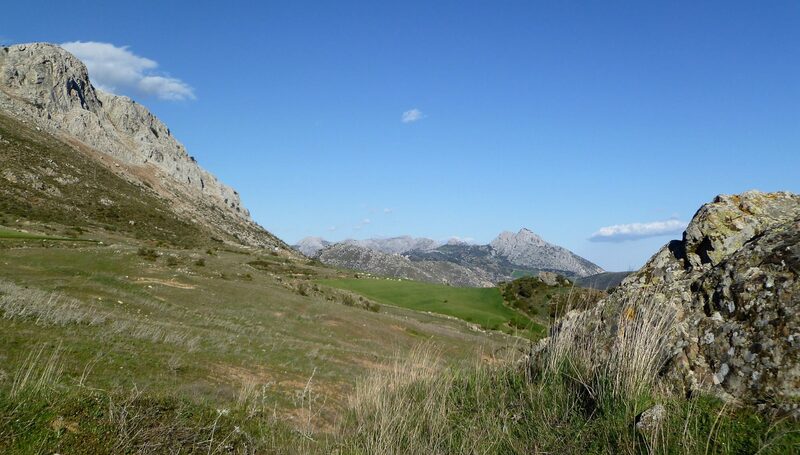 Spain has the greatest bird diversity in Western Europe, but the portion of GR-7 we walked does not spend significant time in all of Spain’s habitats. Thus we saw few seabirds, waterbirds, or shorebirds. However, we did see a fine selection of woodland and open-country passerines. Birds were reasonably abundant, but generally a bit more skittish than in England or the US. Wheatears, bee-eaters, and hoopoes stood out as particularly interesting for us. Larks were abundant and a constant identification challenge. We added three life birds to our list: European Scops-Owl, Great Spotted Cuckoo, and Rock Petronia.